Tony Maceli is one of the top bass players in the NYC indie music scene. Some months ago, he started organizing a regular mega-show called Full Vinyl. Last night was the first one we were able to attend, so I don’t know whether we’ve missed one or two. I also don’t know whether the format is always the same (or going to be). 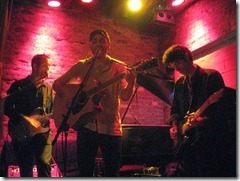 This show was at Rockwood Music Hall Stage 2. Now I know. Last night was #4, so we missed two of them before hopping on the train. If we’re physically able, we’ll never miss another one. Last night’s show was simply fantastic, on every level. It’s a touch ironic to say that. The theme was Yacht Rock. Not that the songs that fall under that heading aren’t awesome (they most definitely are, well nearly all of them are), but clearly, there’s a tongue-in-cheek phenomenon going on when kids (yes, the oldest musician on stage was a kid to us) select that music to highlight. 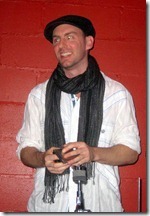 That said, whether they, or the large crowd at Rockwood were singing with any condescension, I certainly couldn’t tell. 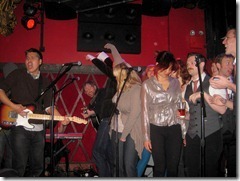 The party started instantly with Footloose, and never slowed down until the big finale. So many audience members were singing their hearts out to every song, so this wasn’t a trip down memory lane that left them in the dust. An excursion before I dive into the show itself. 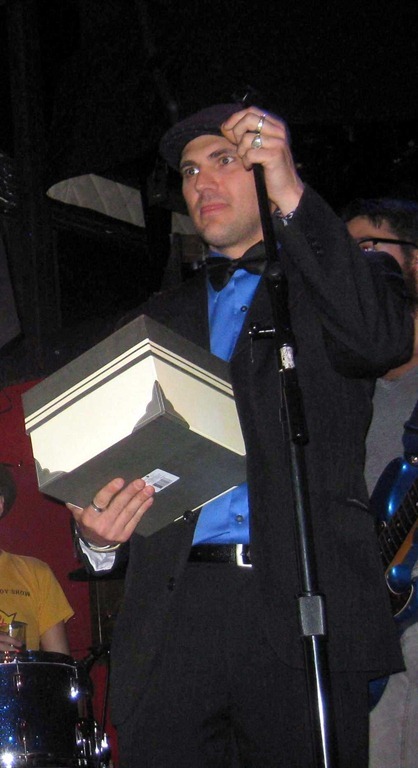 At the last Full Vinyl show, Tony swore on stage, quite a bit. 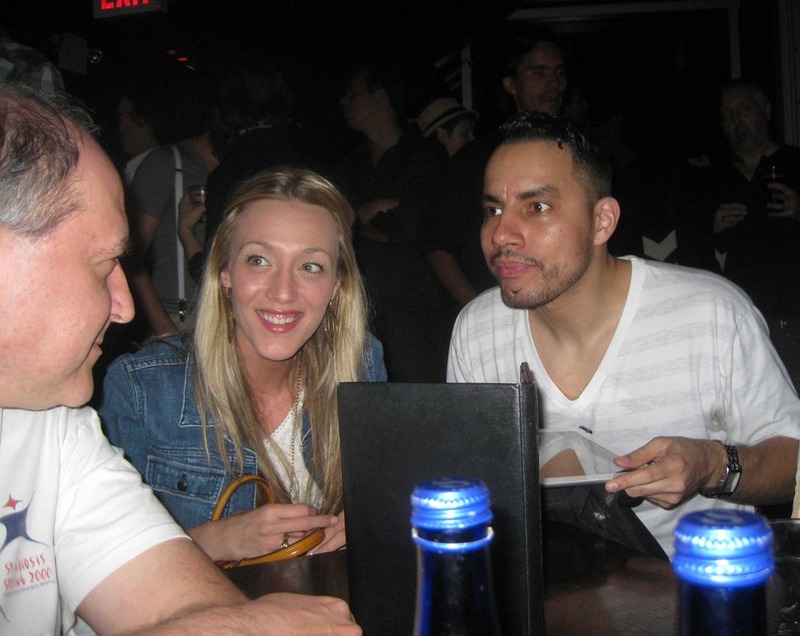 Sometime after the show (days, weeks, I don’t remember exactly), we ran into Tony and got to chat for a while. He brought up the cursing and said that although he loves to curse, and does it all the time, even he felt that he was over-the-top at the show. We didn’t disagree. We agreed. 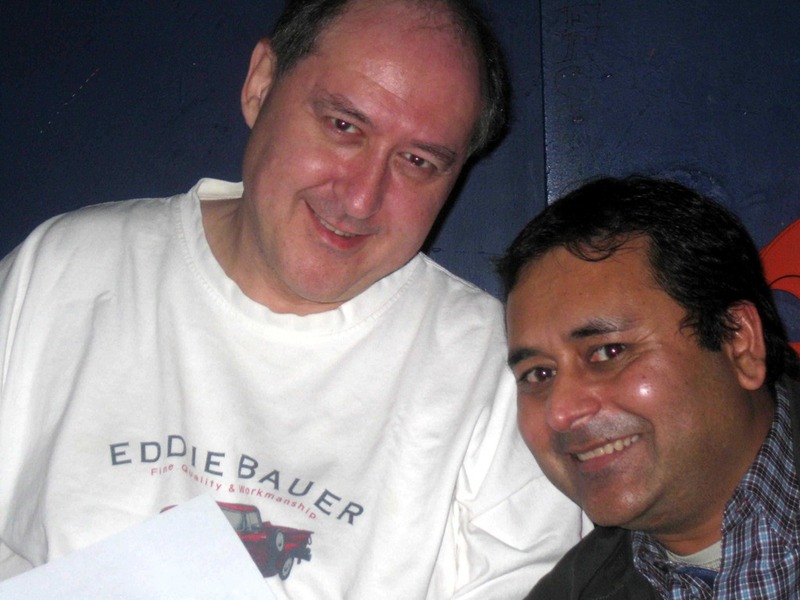 At last night’s show, both sides happily remembered the wager and rules. We gave our waitress a $20 bill in exchange for $20 singles. We started out with an empty glass. We ended up with a large bucket (the normal Rockwood tip jar). 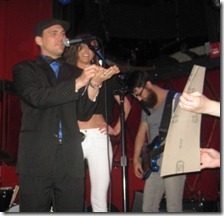 Tony expanded it to include any performer on stage who was game to toss a buck in if they cursed. Martin Rivas cursed just for the heck of it, and immediately tossed $1 in. Tony offered the audience the chance to participate if they wanted to toss money in to reward the lack of swearing. People did indeed come over to our table and toss money in! When an audience member at the table next to us cursed, she immediately felt self-conscious and reached into her purse and tossed $1 into the bucket. Cool! Tony didn’t curse a single time during the show (proving that he can control it completely). Right before the finale, he came out with a number of singles in his hand. After letting out a few expletives, he tossed all of the singles in the bucket. Aside from the release, he clearly wanted to participate in the additional tips to the staff and this was the best way to accomplish that. 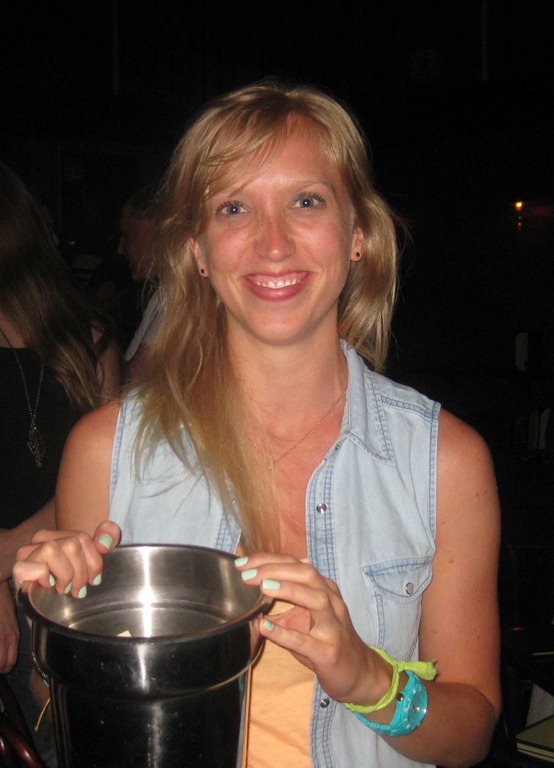 When the show was over, Lois presented Erin (who happened to be our waitress the entire evening) with the bucket on behalf of all of the performers and audience members who chose to participate in the challenge. I don’t know how much others chucked in, but I just counted six singles left from our $20, so at least 14 times, we (or more properly Lois) thought that the performers behaved well enough to be rewarded (even if the reward was going to someone else). I judge the experiment a complete success. It was Tony’s idea and he deserves full credit. Something that deeply annoys/affects us is the often constant talking (at volumes that are not to be believed!) 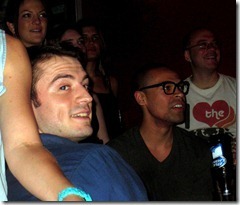 that goes on in the audience, even by obvious fans and friends of the performers. Lois thought that it might be interesting (albeit perhaps impossible!) if we had a challenge whereby talkers were shamed into putting $1 in the jar every time someone pointed them out. Somehow I doubt we’ll pull that one off as smoothly as we did the cursing challenge, but I would love to see it happen. Loosely following the format I established last time (ain’t precedent grand? 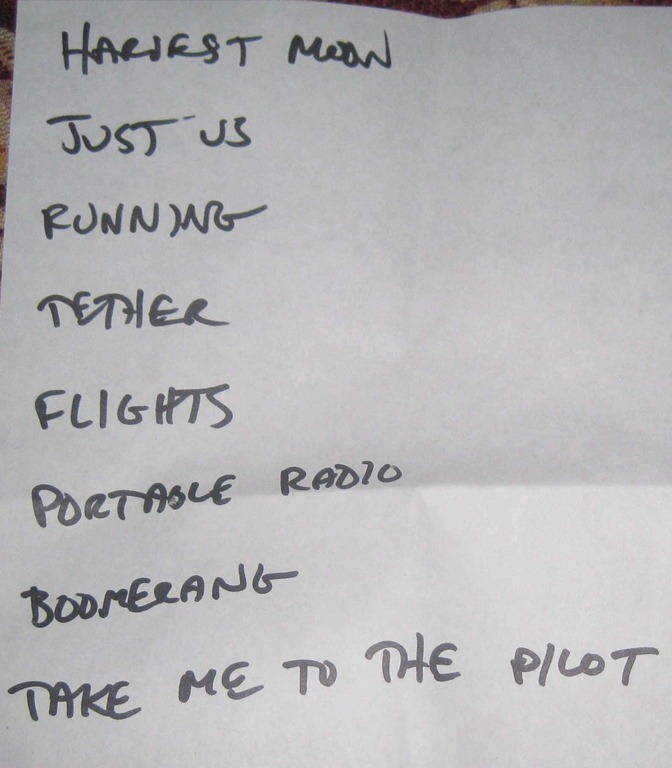 ), I’ll post the set list first, then the lead singers for each song, then the infinite (no hyperbole here!) band members immediately thereafter. Where someone was a singer and a band member, I’ll note that. 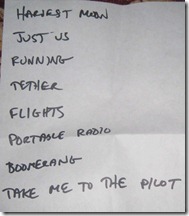 Tony decided to have fun with the set list, giving most people one or more nicknames for their first names. For most, he used their real last names, which made it a tad easier on me. 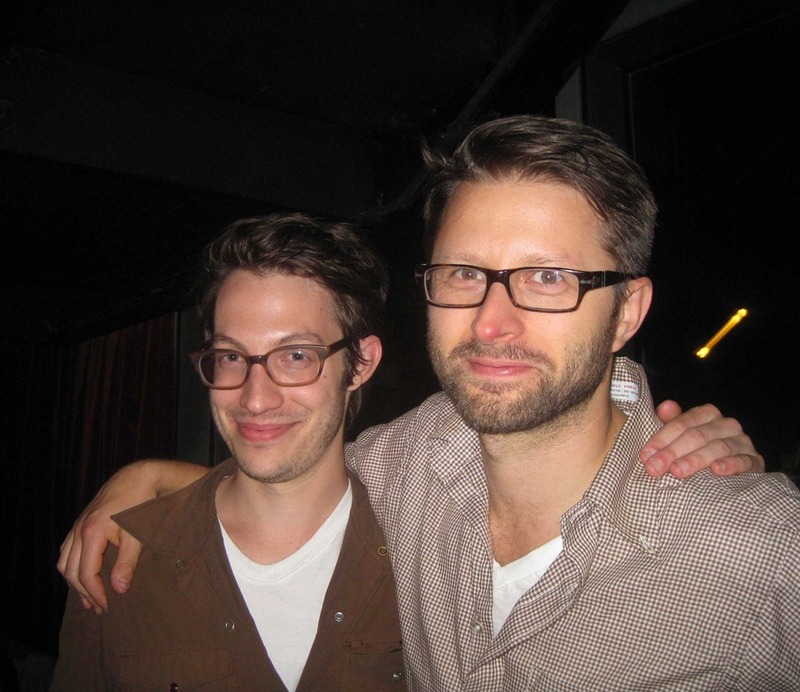 Thankfully, I figured out who Michael McMinkoff was. As with the first show, Tony Maceli kicked it off. I already told you that they shot out of the gate with a bang. Now you know who led the charge. 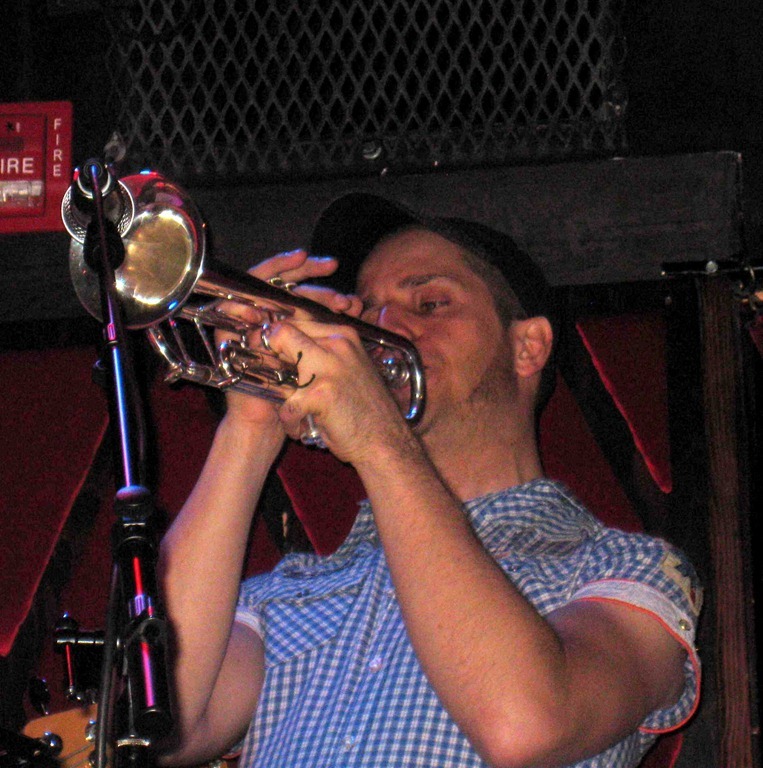 In addition to playing a lot of bass, Tony played the trumpet on at least two numbers. 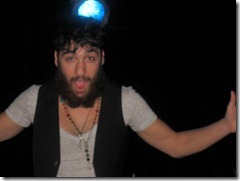 Zach also stepped out from behind the drums to sing some background vocals. Misty Boyce sang wonderfully. Not quite the barn-burner that caused me to describe the aftermath of her song at the last show as “we were all reduced to a puddle”. 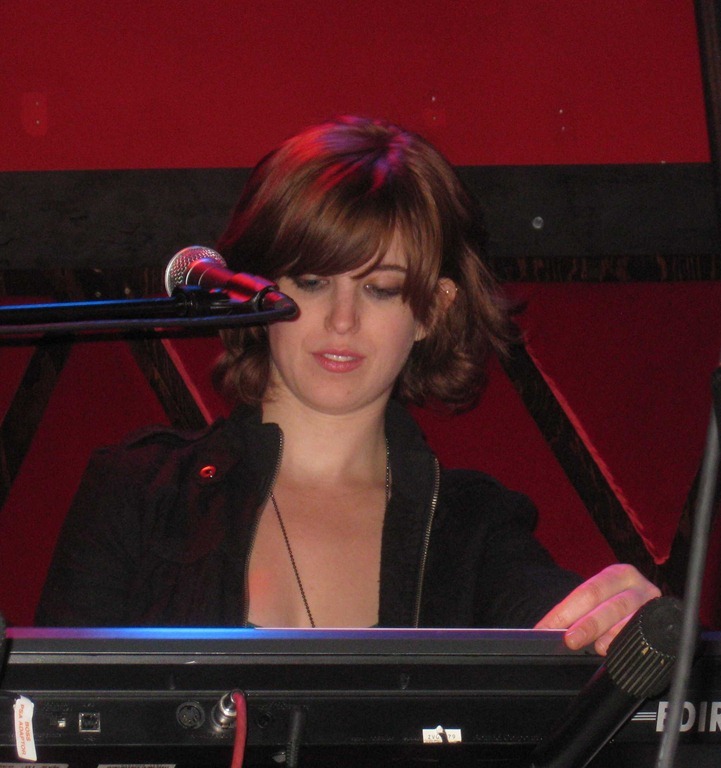 Misty also played the keyboards on some songs. 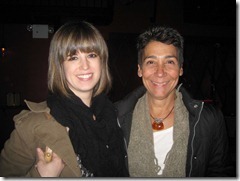 Deena Goodman was exceptional. 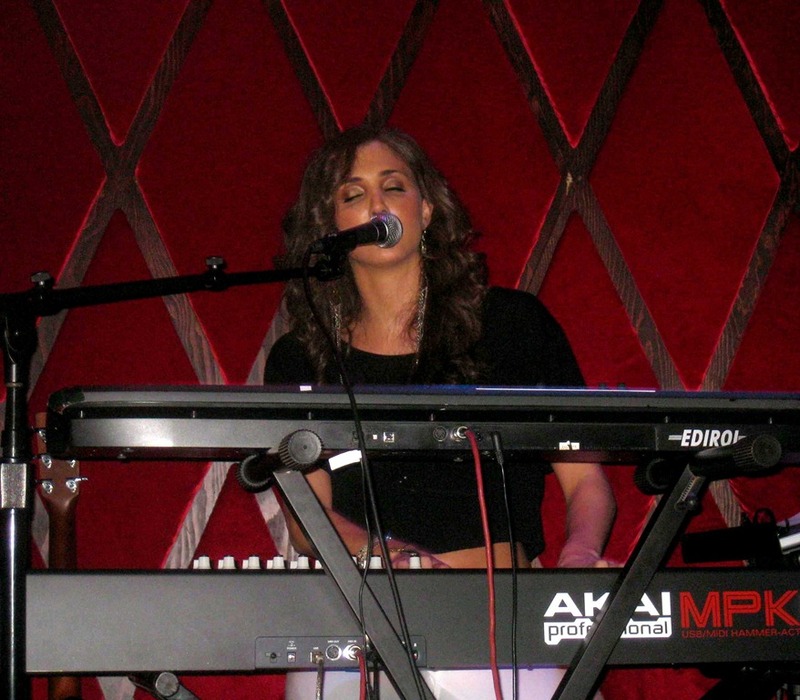 I’ve only seen Deena sing once before, at a Livestrong fundraiser, 2.5 years ago. 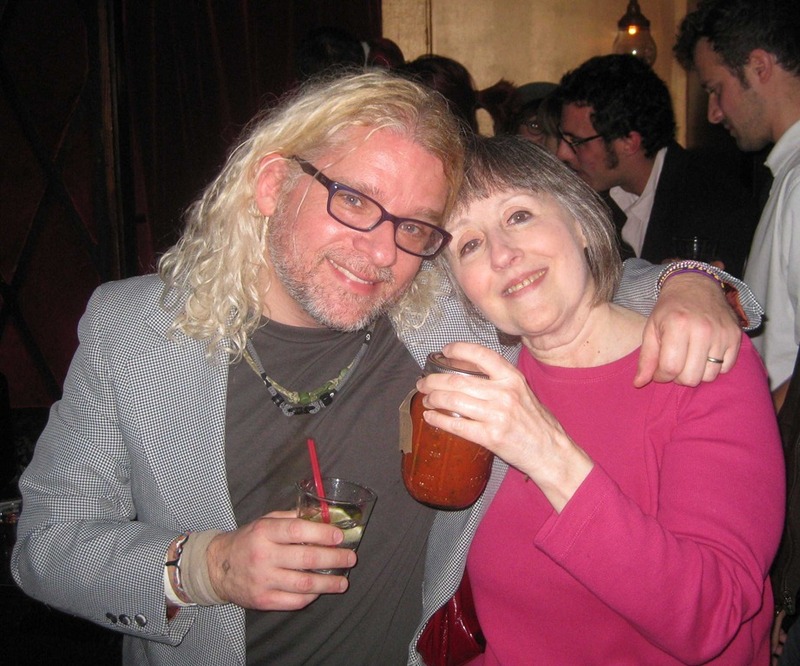 I praised her mightily that night. She did a lot of charity work and then I heard she returned to get a graduate degree, so I wasn’t surprised not to see her performing. Perhaps she needs to rethink that! 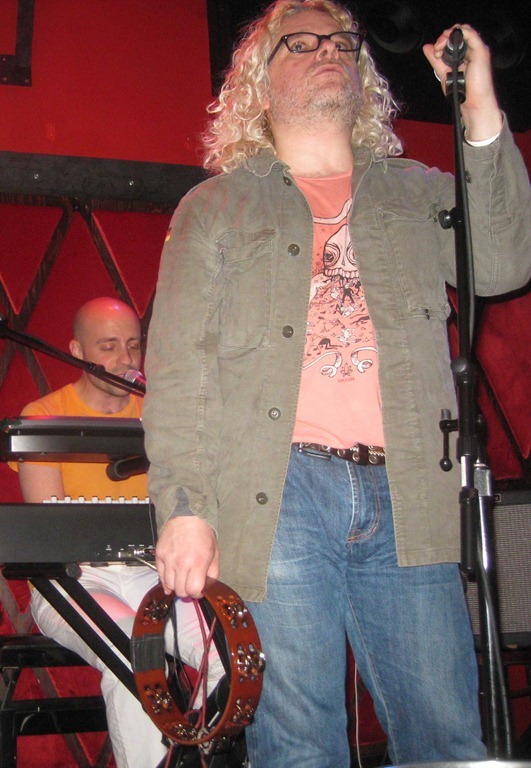 Adam Minkoff was amazing (hence earning the only double-nickname, since Tony believes he’s very faithful to Michael McDonald). 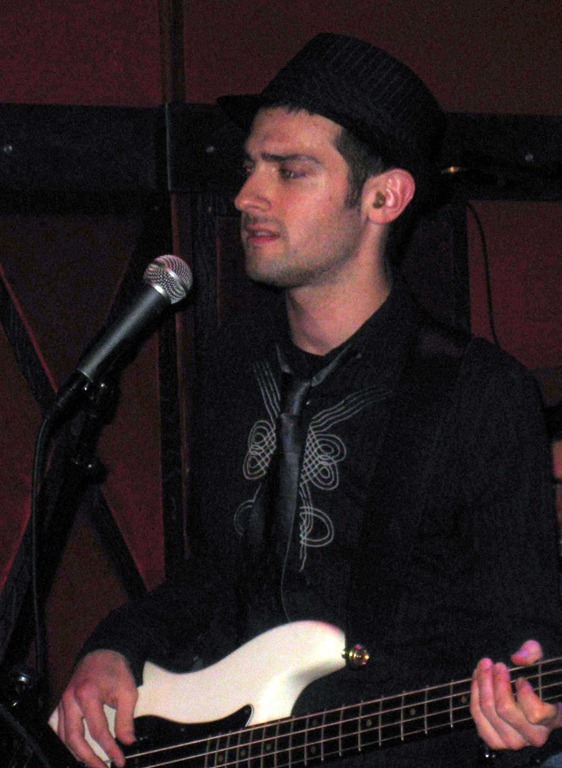 Adam also played bass and I even saw him wield an electric guitar. Julia Haltigan continues to impress every time we see her (which will continue to be frequent if she keeps up this level of performing). 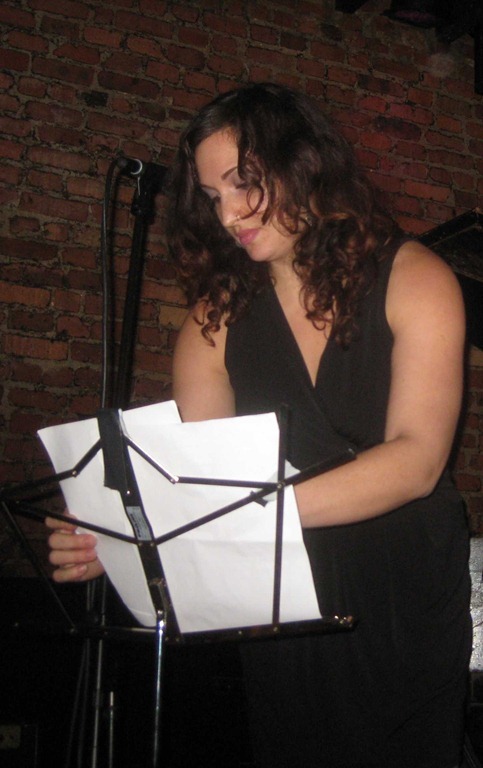 That said, she’s playing tonight, but I’ll be typing away at this while she’s doing that. 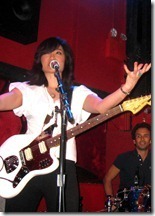 Charlene Kaye did a great job, also playing lead electric guitar for her own number! 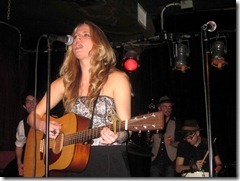 In addition to singing lead on Go Your Own Way, Charlene also sang backup on a number of songs. Emily Long was wonderful on her number. 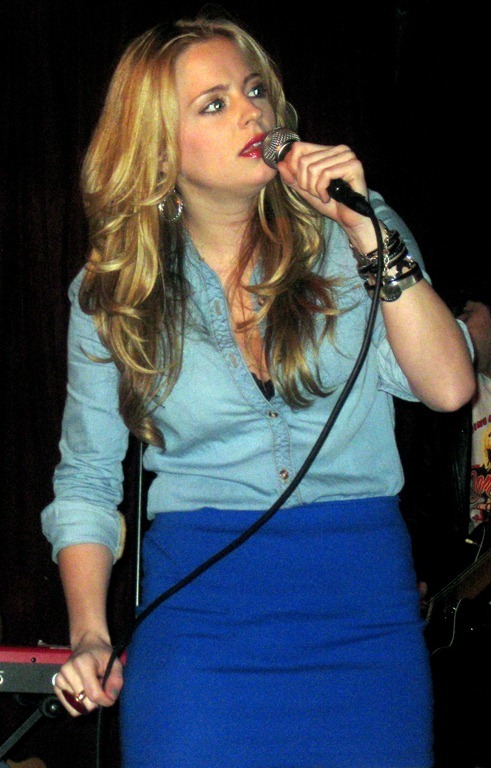 Like most of the other lead singers, she returned to sing on the finale. 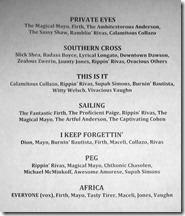 Greg Mayo sang lead on Private Eyes. 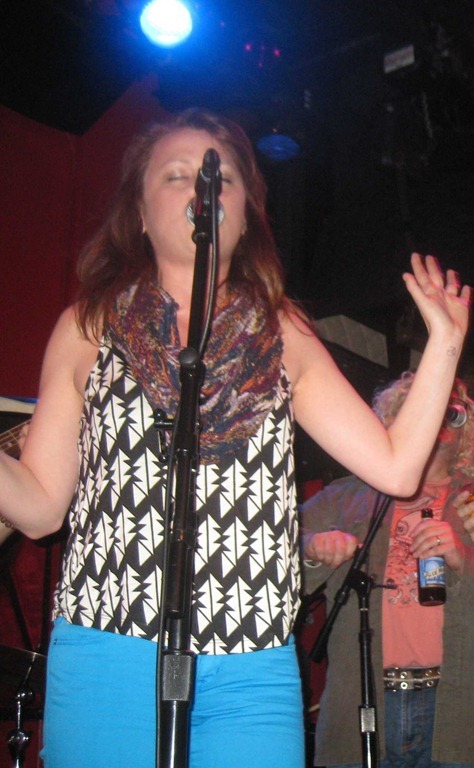 There was a delay in starting the song for a wardrobe change (calm down folks, this wasn’t a wardrobe malfunction). Greg left the stage while Tony explained that Greg needed to get a special jacket from the green room. 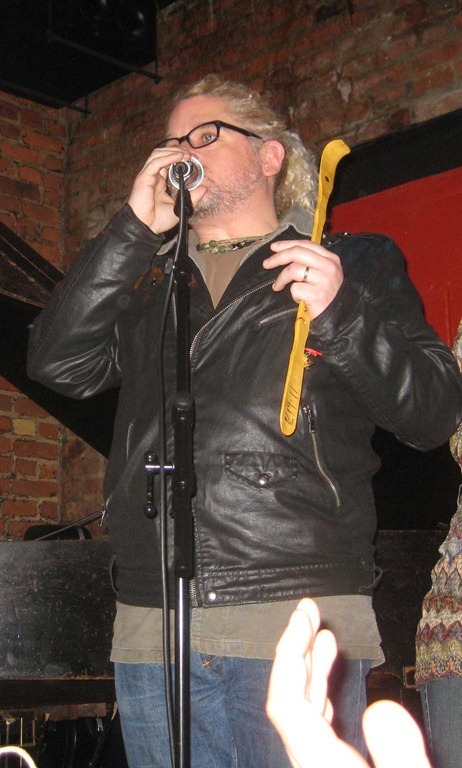 Greg emerged wearing a leather jacket that was originally owned by Daryl Hall. 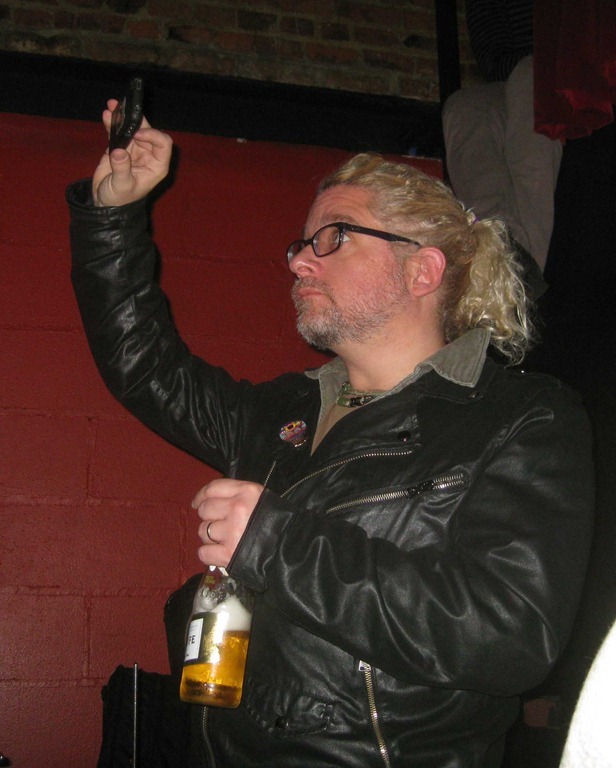 I wrote about the jacket, and the song (Private Eyes) when Greg performed it at his last Greg Mayo Band show. He was great then, and again last night, but it was really cool to see him perform it on lead guitar last night, whereas he was behind the piano at his last show. 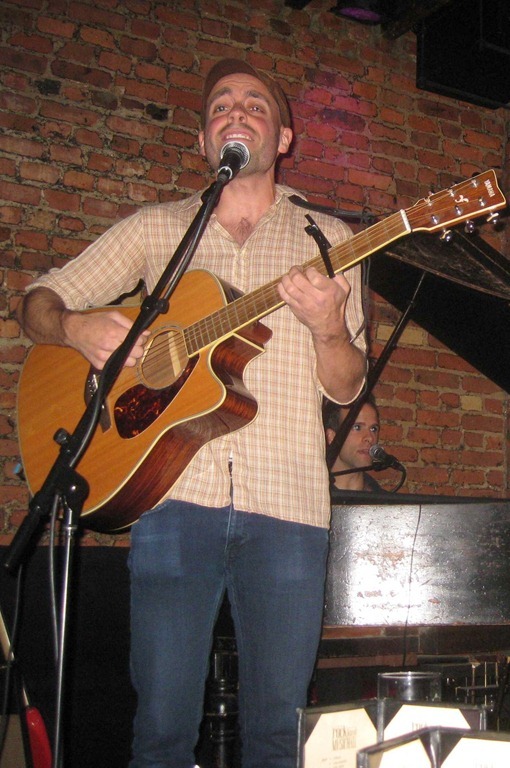 Of course, Greg also played electric and acoustic guitar (amazingly, as he always does) on many other numbers. Casey Shea was once again wonderful. 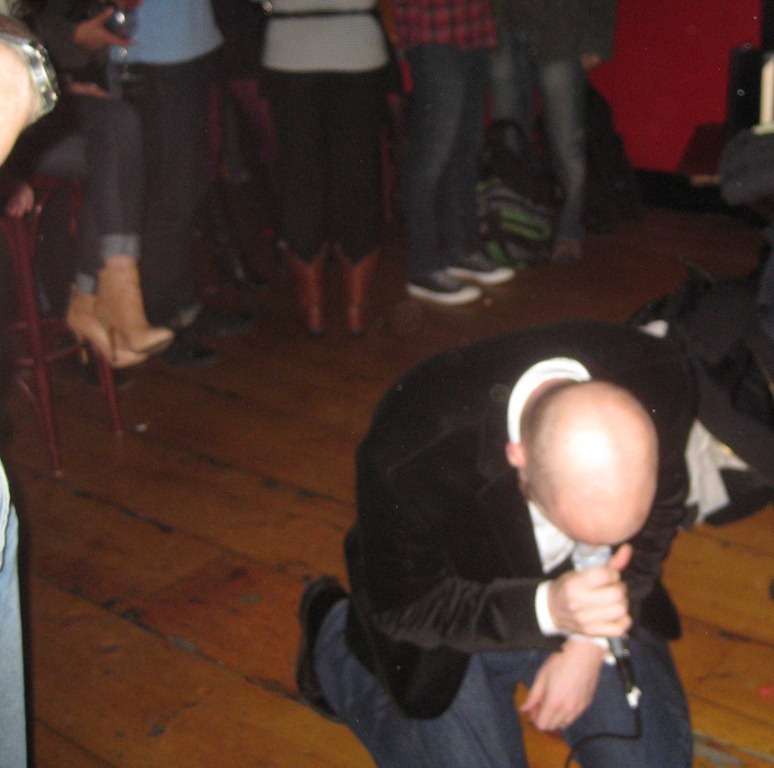 Once again (consecutive shows now), he descended into the audience to serenade a woman within inches of her face. This time, he sat down (last time he lay down on the table). It was the same woman though, Lois. So, to see whether she was his target, or just convenient, I’m going to have to have her sit in the balcony next time Casey sings. We’ll see if he climbs up there to sing to her. If so, I’ll know what the deal is. 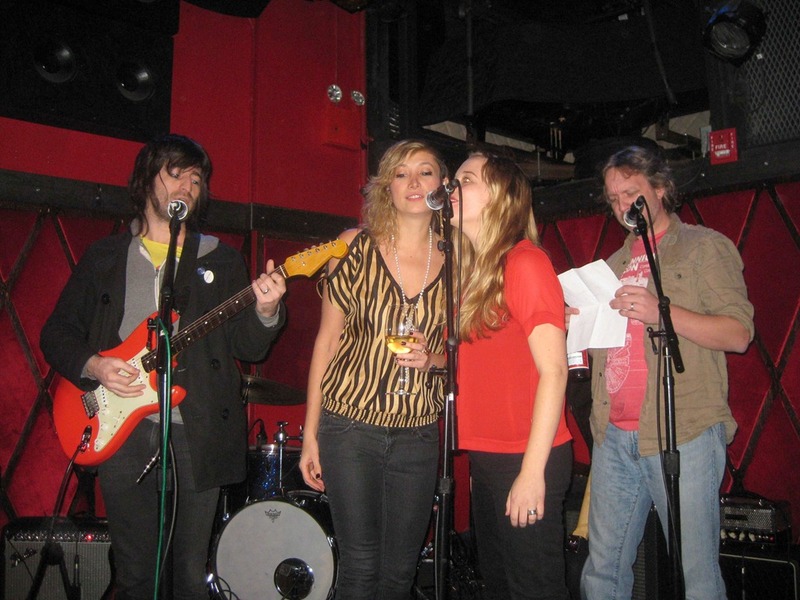 Casey also sang backup on some other songs. 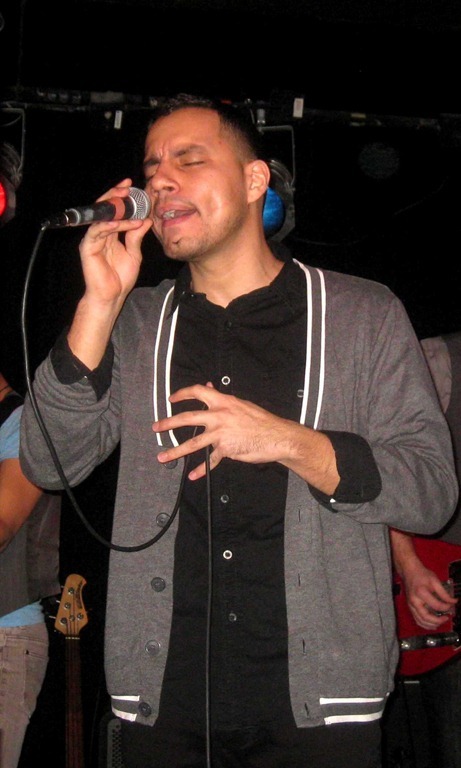 Brian Collazo (of Live Society) thrilled (as he always does) when he sang lead. 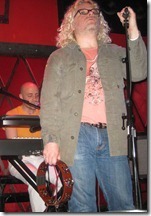 He was also one of the primary backup singers on many songs, and he was oh-so-tasty on each and every one. 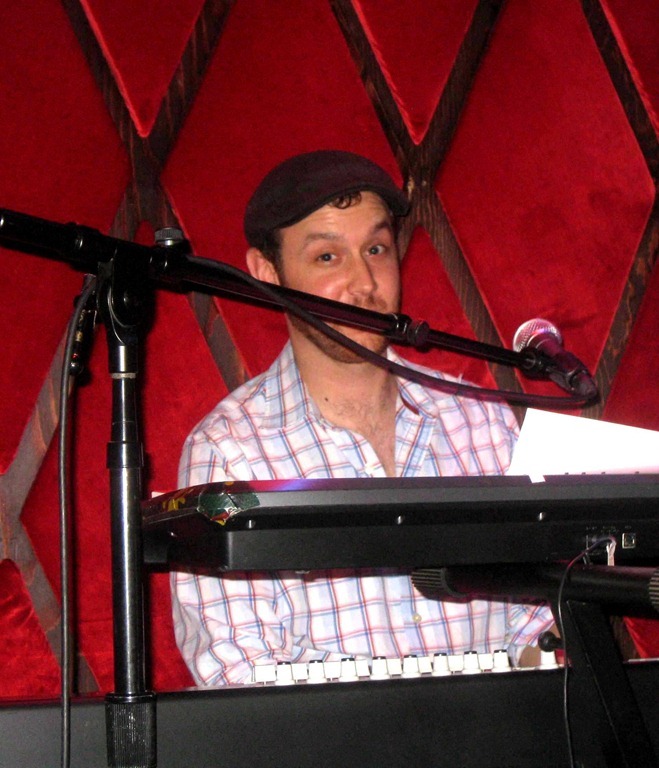 Patrick Firth sang wonderfully while playing the keyboards. 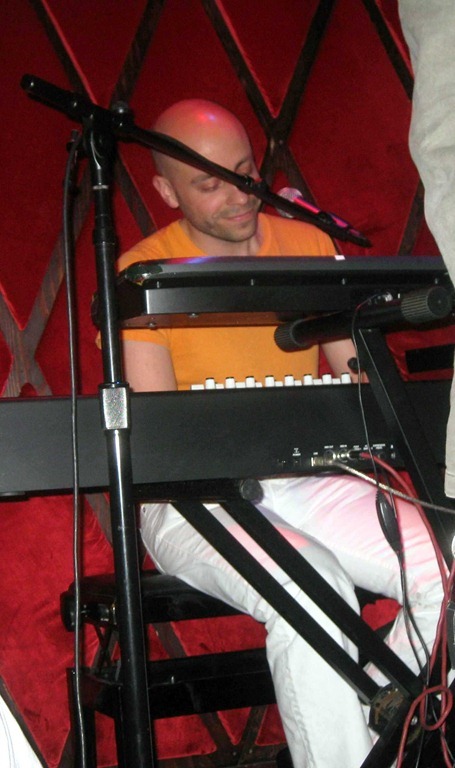 He was also the primary keyboard player on most of the numbers (though he did relinquish it occasionally). The relinquishing was perhaps reluctant. 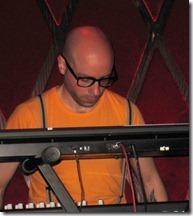 On one number, he hung around and played the top of the double-decker keyboards while his replacement played the bottom. 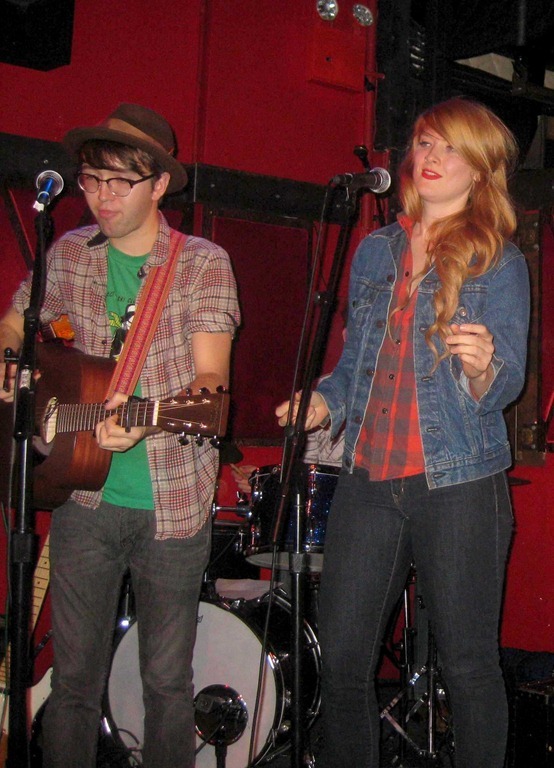 Morgan Paige didn’t sing lead, but she joined Patrick to sing on Sailing. 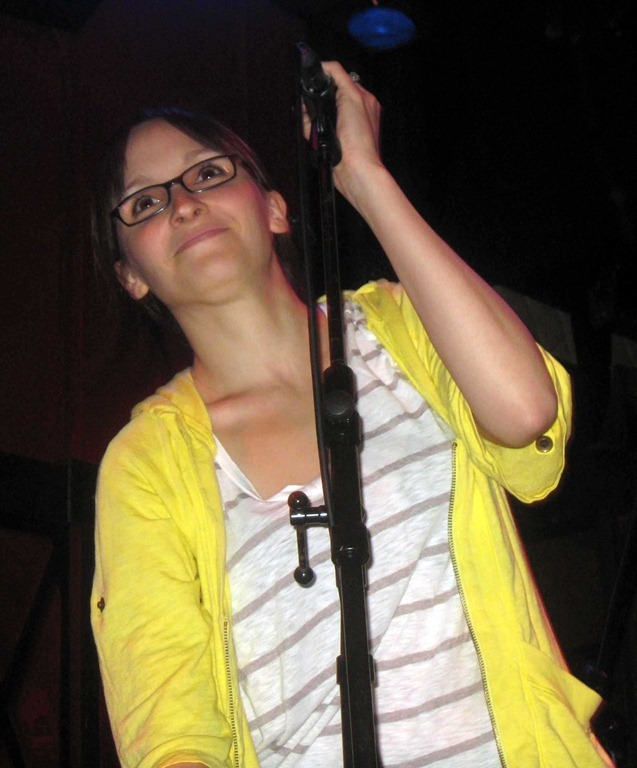 Since I didn’t notice her on stage for any other numbers, I’m mentioning her here. 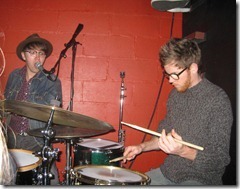 Josh Dion ripped it up again, vocally and on the drums. How anyone can watch him perform and not be mesmerized is beyond me. Of course, I shouldn’t assume that there’s anyone who isn’t mesmerized, so my hypothesis might just be incorrect. 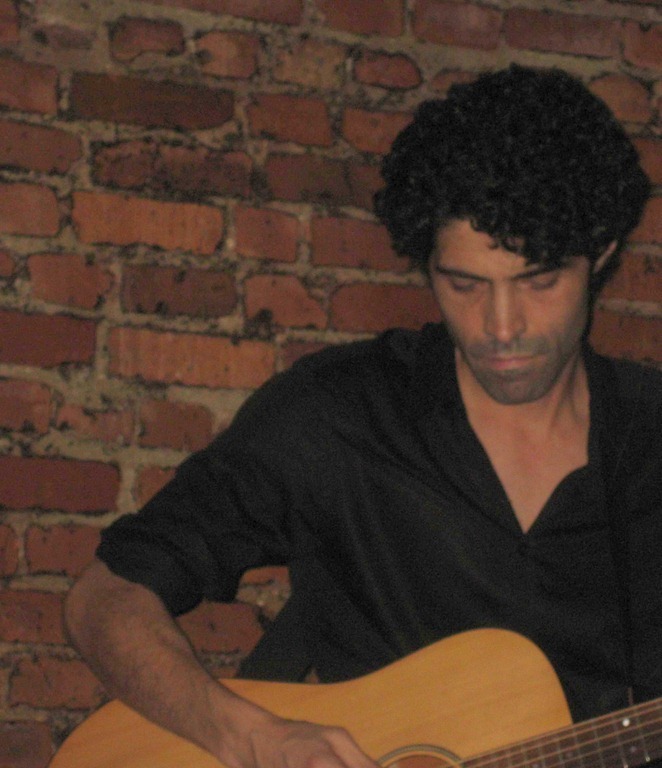 Martin Rivas sang his way into our hearts. 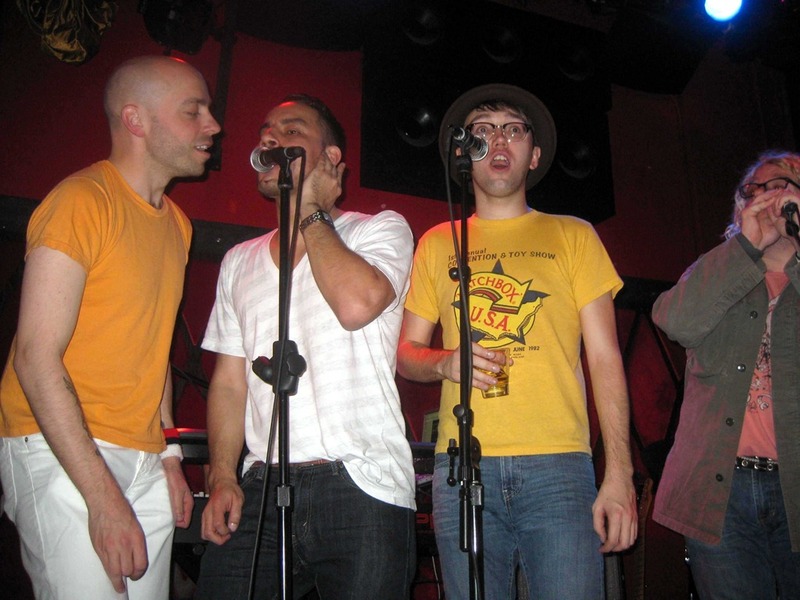 In addition to singing lead, Martin was on stage as much (perhaps a bit more) than Brian Collazo was, singing with everyone else. He played some tambourine too (as did a few others that I failed to note above). 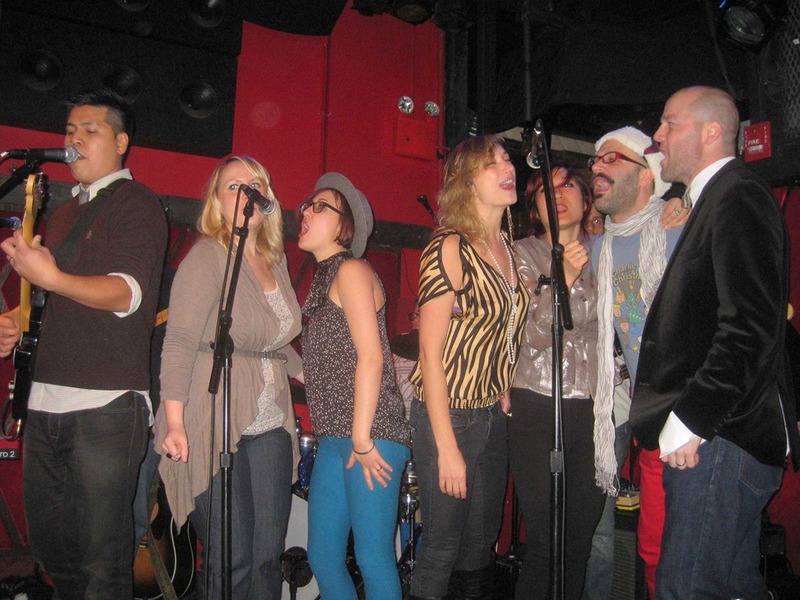 That leaves the big finale, where most of the singers took a turn at the mic. In a small-world twist, two posts ago I mentioned that The Vanity Belles performed Africa by Toto during their set (which was on the same stage, a few hours earlier). Their acoustic version was fantastic. To end the night with a stage full of people, supported by a top band, performing the same song, was an interesting contrast. Both versions were amazing, even though they were totally different. On to the band. 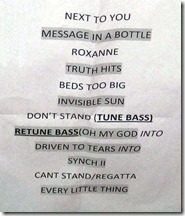 I’ll mention them in the order that they appear on the set list. If you pay attention, many of them played on multiple songs. I won’t repeat anyone who is mentioned above. 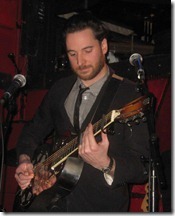 Dan Tirer on electric and acoustic guitar. I’ve only seen him once before, at the last Full Vinyl show. Must… see… more… of… him… He’s so good! Matt Simons on saxophone and electronic keyboards. 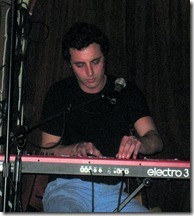 At the last show, Matt played only the keyboards. That’s great, but if you really want to add some awesome sauce to the mix, make sure you catch Matt on the sax, he’s incredible. One one number, he was the only brass. 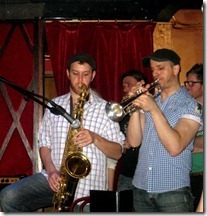 On another, he and Tony played together, with Tony whipping out his trumpet. More, please! 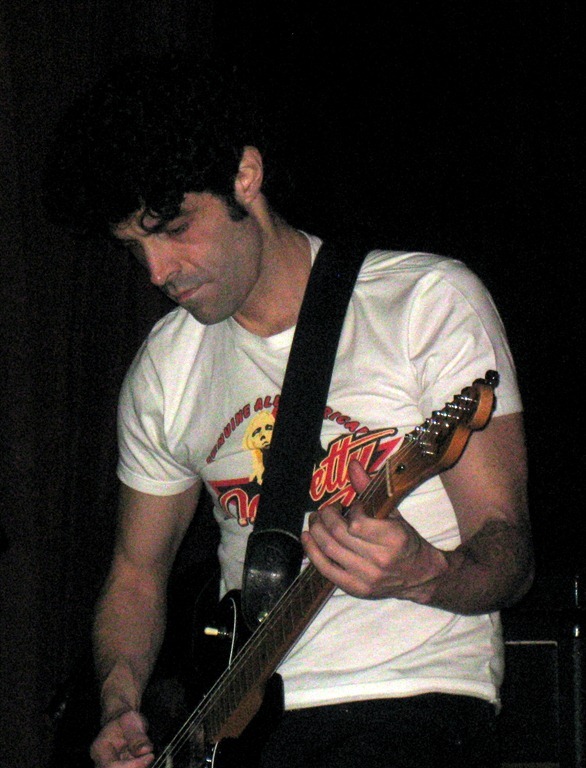 Andrea Longato on electric guitar. Holy smokes, what a nice surprise. 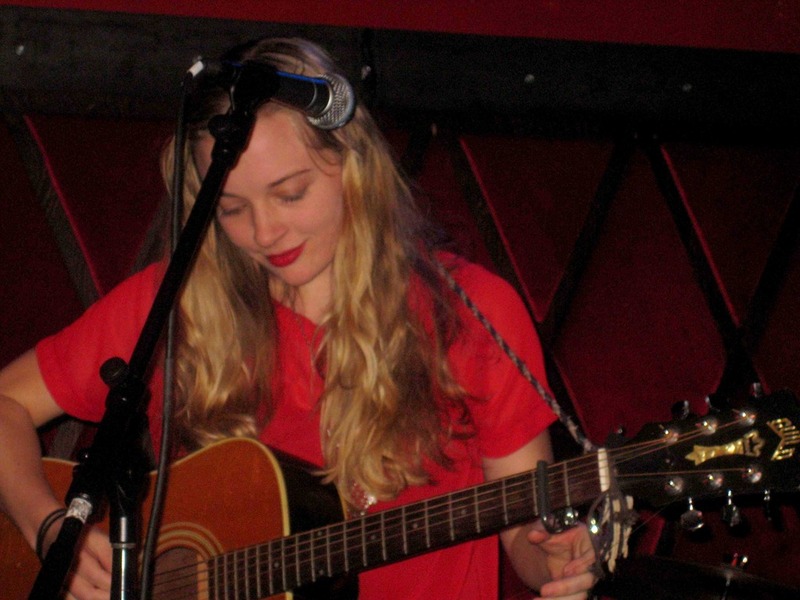 I’ve only seen Andrea once before, when he played with Carley Tanchon in February. I was blown away that night and I’m happy to have gotten a taste again last night. 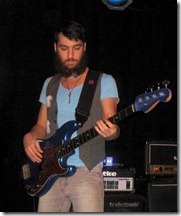 Matt Basile on electric bass. 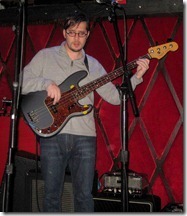 Another in a string of great NYC bass players who never disappoint. 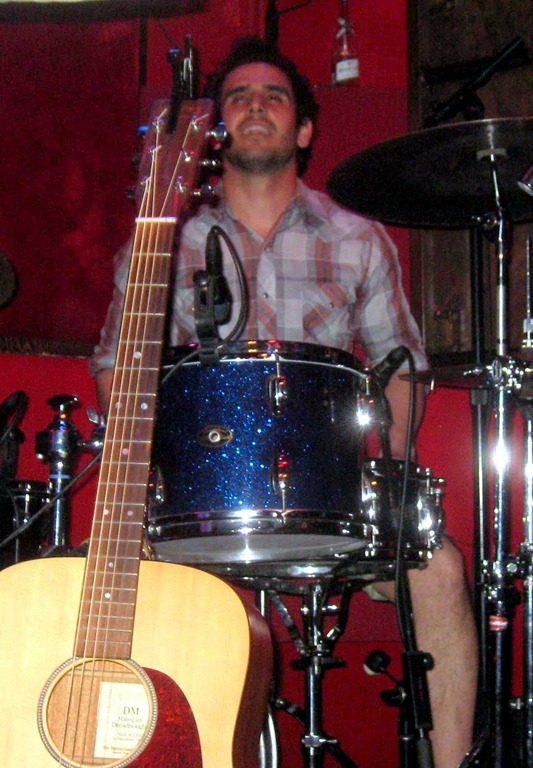 Jamie Alegre on drums. Jamie always delivers. For me, that’s usually when he’s playing with Derek James. He was great at the last Full Vinyl show as well. 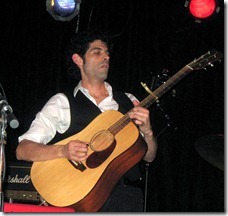 Steve Dawson on acoustic and electric guitar. I can’t say that I really made out his acoustic guitar (tough to hear it over all of the other instruments), but I can tell you that his spirit (demeanor) fit in perfectly. He was having a blast (like the rest of them were), as we all were too. 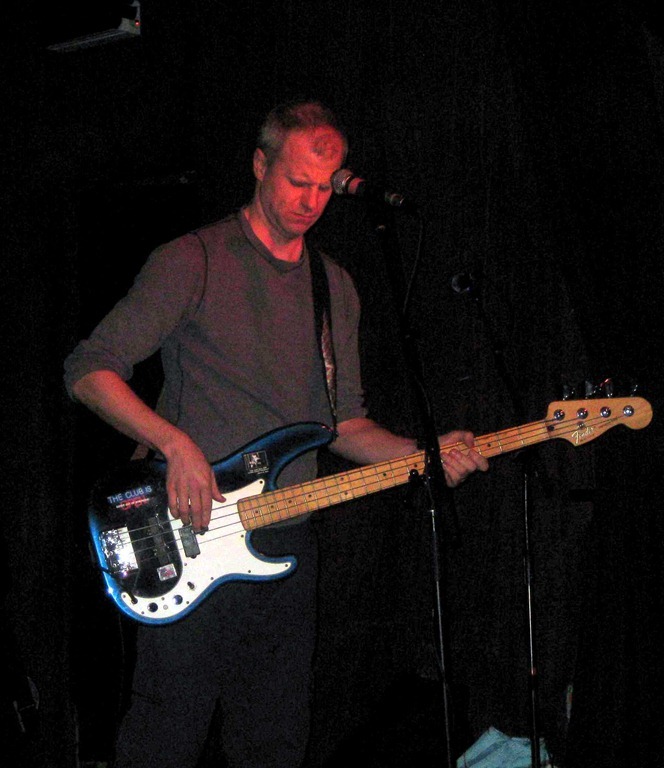 Rob Calder on electric bass. Excellent! My first time hearing Rob. 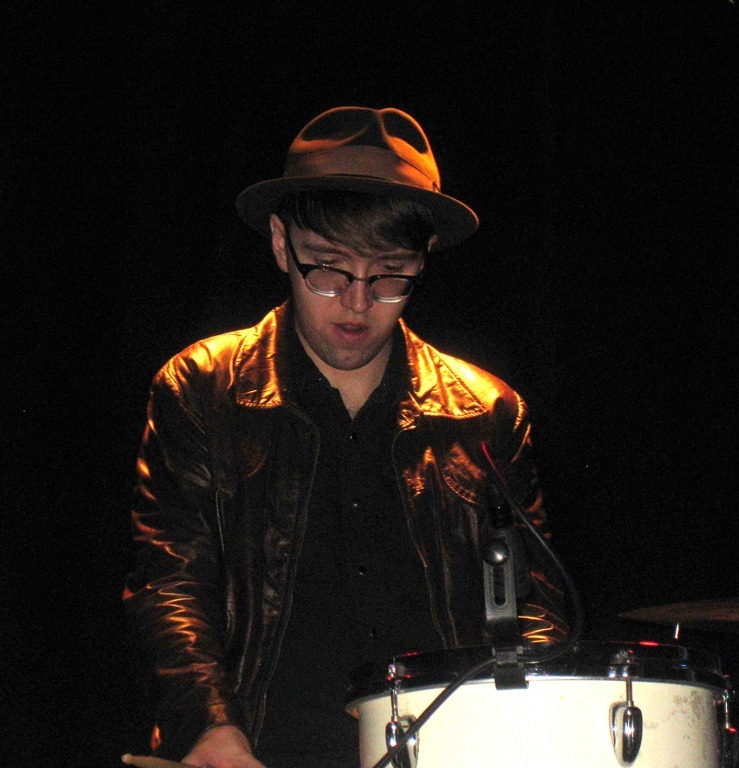 Spencer Cohen on drums. 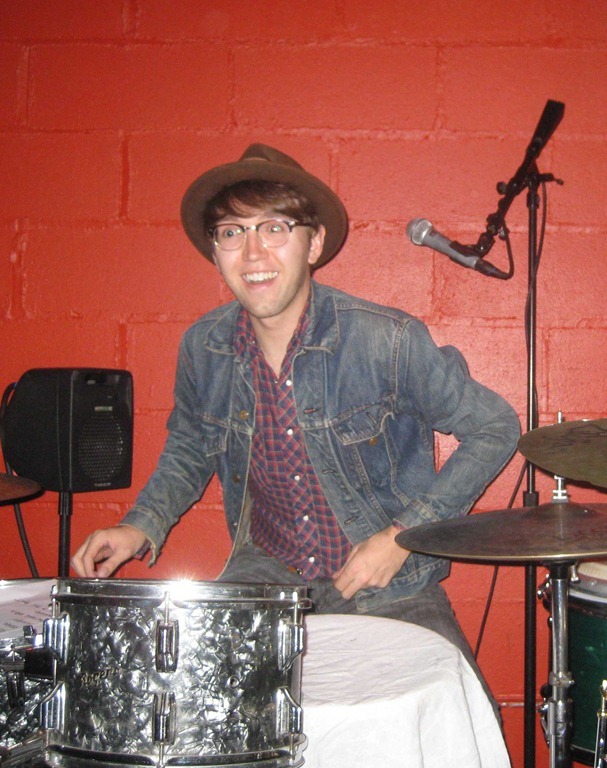 Spencer is fantastic, whether he’s on drums, percussion or cajon. 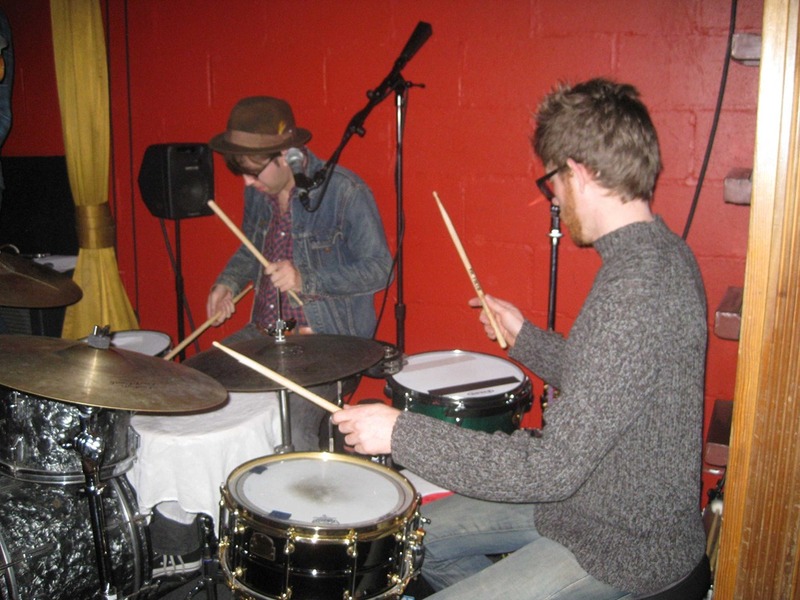 Last night, it was the drums. 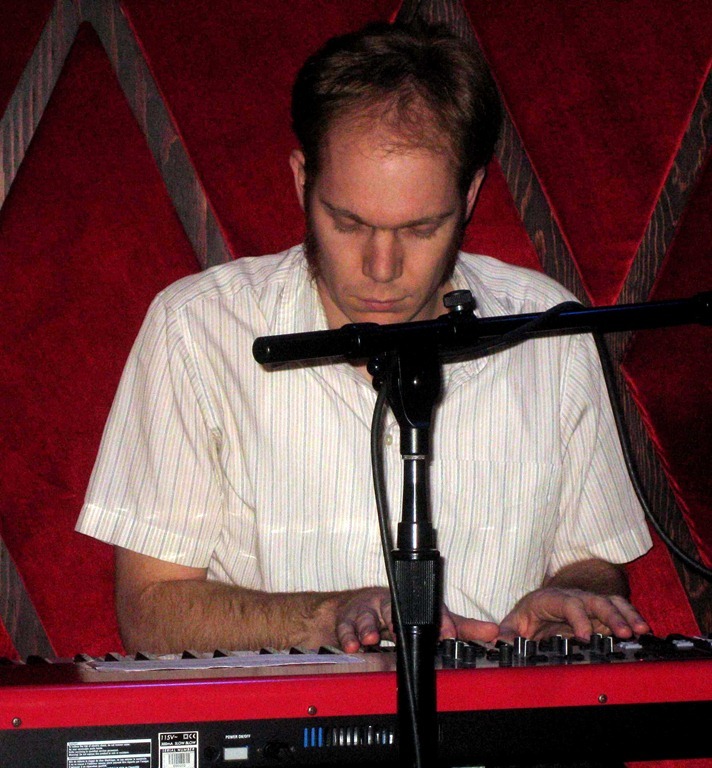 Scott Chasolen on electronic keyboards. He’s a great pianist, no further information required! 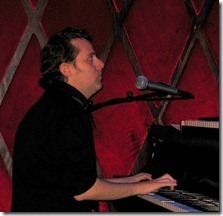 I mentioned above that Patrick Firth hung around to play the keyboards with someone else. It was Scott. 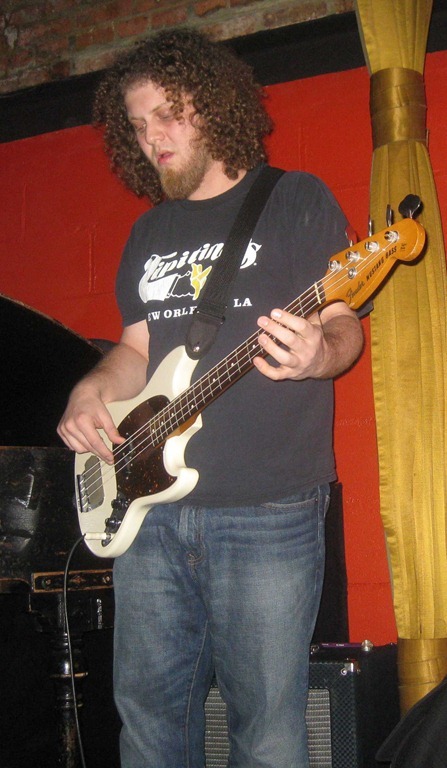 Ben Zwerin on electric bass. Another stellar performance from Ben. 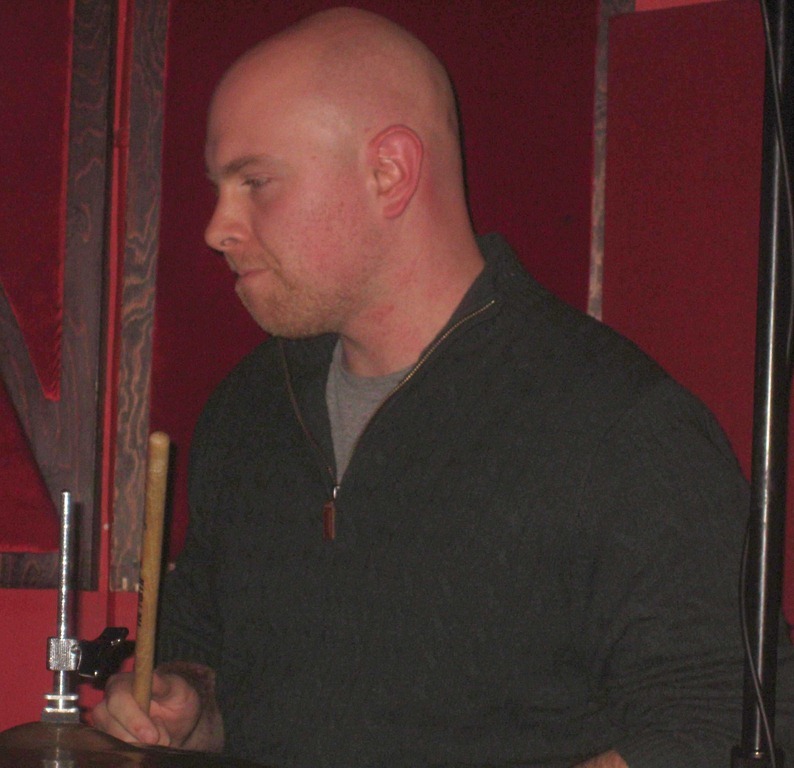 Tommy Diehl on drums. My first time, won’t be my last. He did a great job. 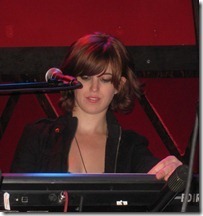 Rebecca Haviland on electronic keyboards and vocals. 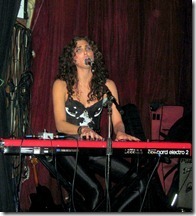 Rebecca backed Charlene Kaye on Go Your Own Way, singing (great) and playing the keys (also great). Rob Jost on electric bass. Another winning performance. 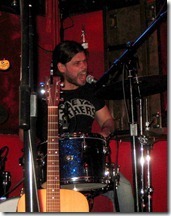 Robert DiPietro on drums. Again (as with the last Full Vinyl), a superior effort on the drums. 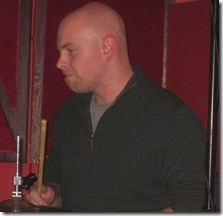 Ryan Vaughn on percussion and drums. 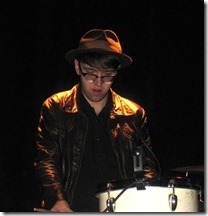 Ryan is always one of the most masterful percussionists. 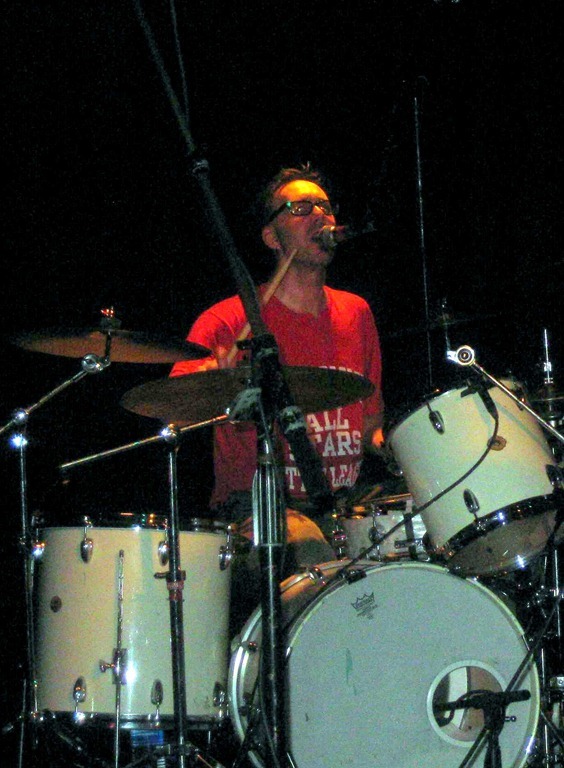 In addition to playing on a number of songs, he was joined on percussion by Josh Dion for the finale, complementing the already-mentioned drumming of Zach Jones. Ahhhhhh. 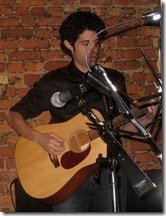 Oscar Bautista on electric and acoustic guitar. 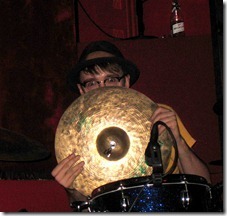 I had already gotten to enjoy a full set of Oscar earlier, when he played with The Vanity Belles. When they were setting up for Full Vinyl, I saw Oscar and Greg Mayo on stage at the same time, tuning and sound-checking their guitars. What a lineup of guitarists, independent of the others who I have already oohed and ahhed about. 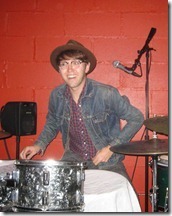 Seth Faulk on drums. Man, it’s been way too long since we’ve seen Seth play. Over three months to be precise. It’s not our fault. He was on an extended tour across the country and just recently returned. 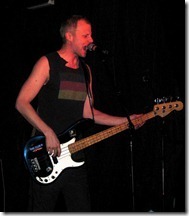 Chris Anderson on electric bass. As with Oscar, we enjoyed a full set of Chris’ play with The Vanity Belles earlier. You can never get enough Chris, so having more of him in the same evening was fine in my book! 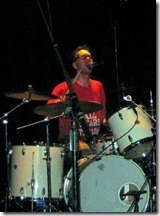 Kenny Shaw on drums. Kenny wore sunglasses, so he might have been trying to hide from me. It’s been roughly two weeks since I’ve seen him play, which is an unusually long stretch for us to go without Kenny. Fantastic job on the drums! Tom Welsch on electric bass. Tom was superb. It was my first time seeing him. 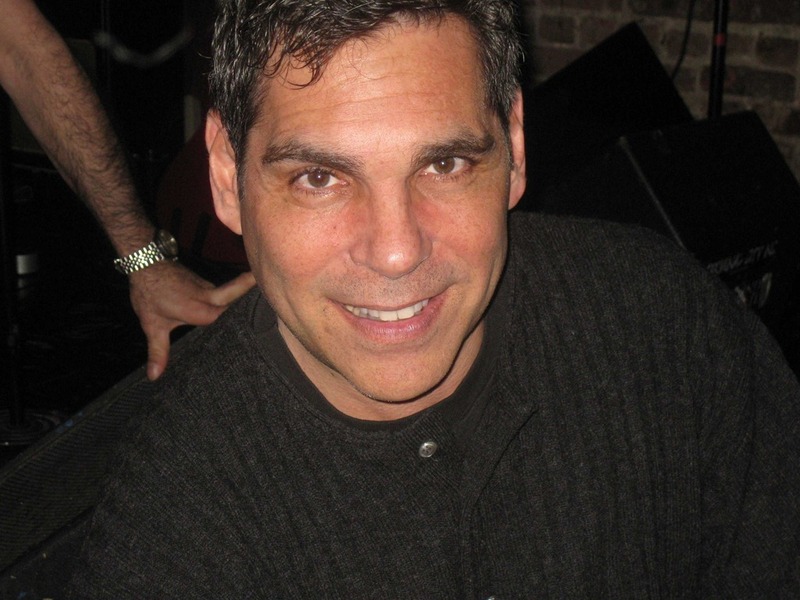 Paul Amorese on drums. Another tremendous performance! I think that’s everyone. Someone will spank me (and I’ll gladly update this) if I missed anyone. We got home around 2am. I have to say, I was still really energized and was not at all hoping the show would end. On the other hand, I went to bed at 2:45 and woke up at 7am (and have been up since), so the candle can’t be burned at both ends every night, no matter how much fun it is at the time. I’m sure they blew away the large crowd there, but those fans only got to hear one song. We got a full set, with their regular (awesome) band, so we win. I’ve written about the Belles a lot in the past three months, so rather than repeat all of that, if you’re new to them (or me), please read this post. As with that show, everything clicked last night. Their voices were great, the band was great, their set selection was great. One of the hallmarks of The Vanity Belles (TVB) show is getting baked goods by Jessi Rae Waltz. Given their hectic schedule the day before, she couldn’t pull off her usual magic. Not to worry. Sitting one table over from us was none other than the star himself, Superman. 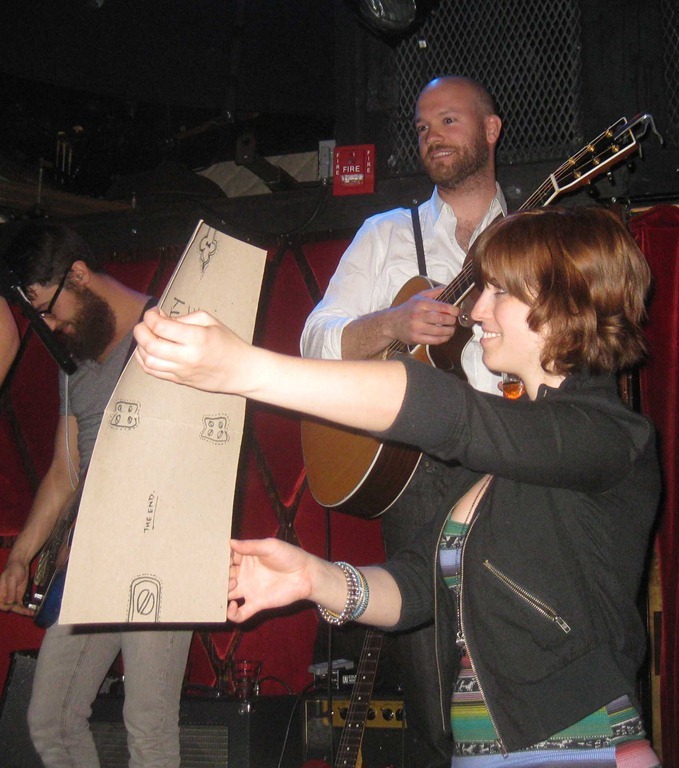 As is their custom, the Belles picked up their instruments for one song, Bottle. This time, Jessi introduced it and explained where the inspiration came from. 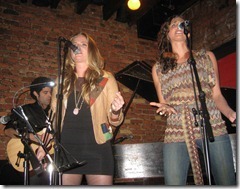 Then they nailed it, with Jessi on the electronic keyboards and Carrie on acoustic guitar. TVB recently completed a successful Kickstarter campaign. Their new CD will be released in a few months. One of the reward levels was getting them to arrange and record a cover song of your choice. I think that included playing it at a show as well. The person who chose that reward picked Africa by Toto as the song. 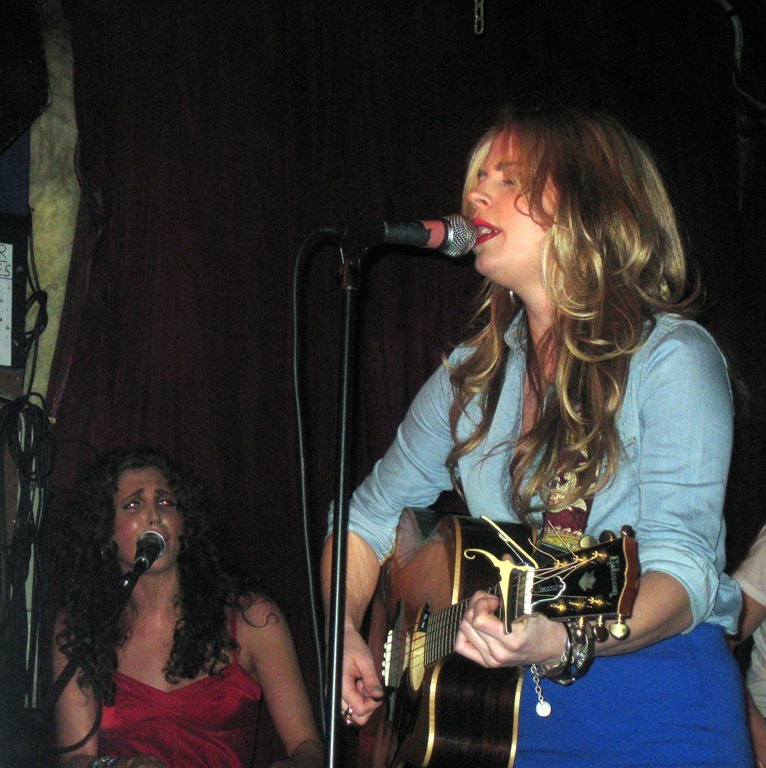 The Belles did a wonderful version, accompanied by two acoustic guitars. 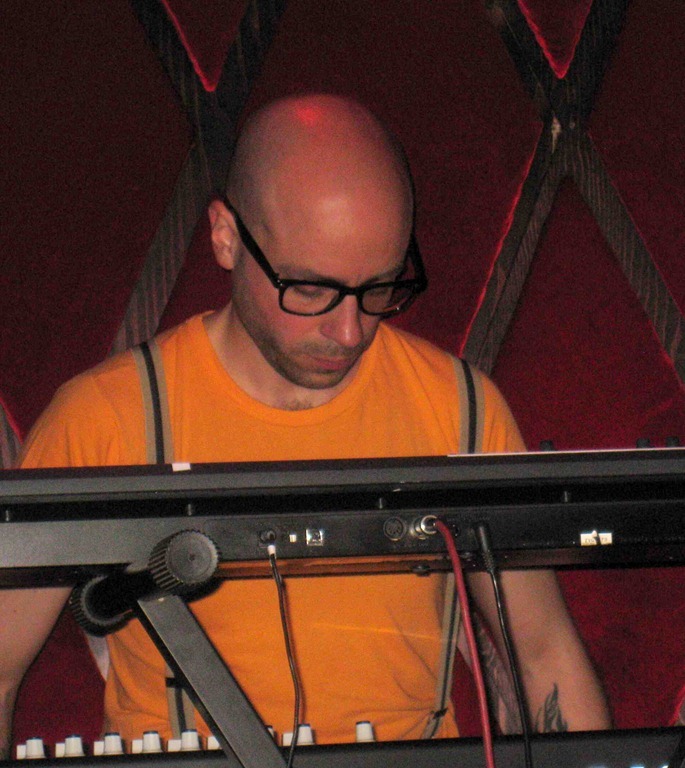 Patrick Firth on double-decker electronic keyboards and background vocals. Patrick never disappoints (as you will see if you read two posts from now, as yet unwritten). 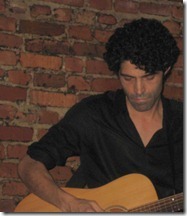 Oscar Bautista on electric and acoustic guitars. Oscar thrills at every show. Last night, when taking a lead, he gave a hand motion to the others to take it down a bit. They all complied immediately. 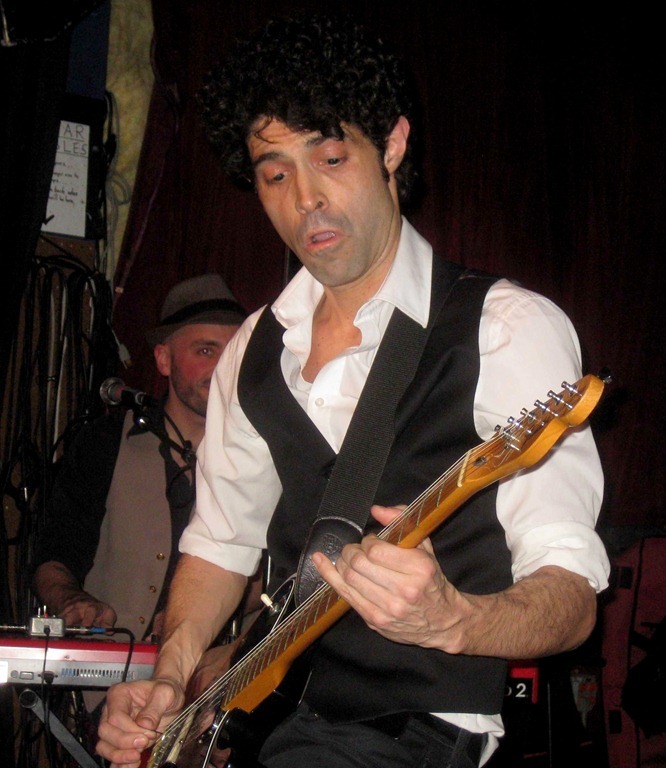 He worked the guitar soulfully, building up to a crescendo as the rest of the band followed. 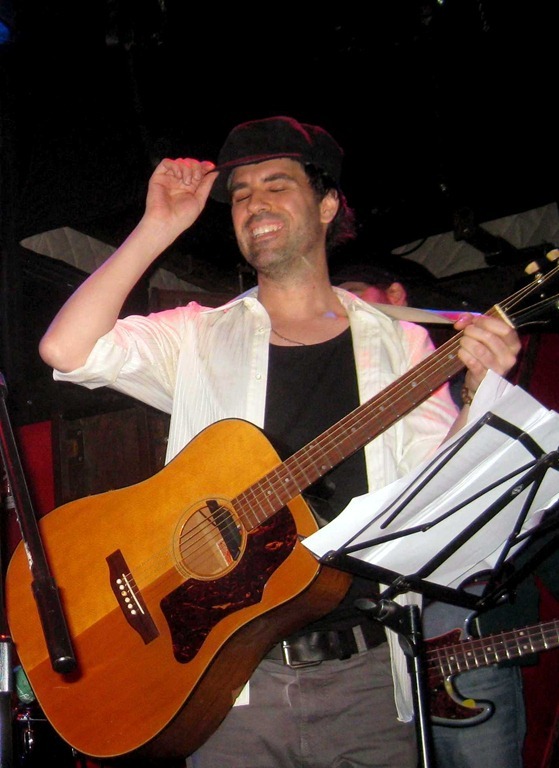 One of the songs that he played acoustic guitar on was the Toto cover. 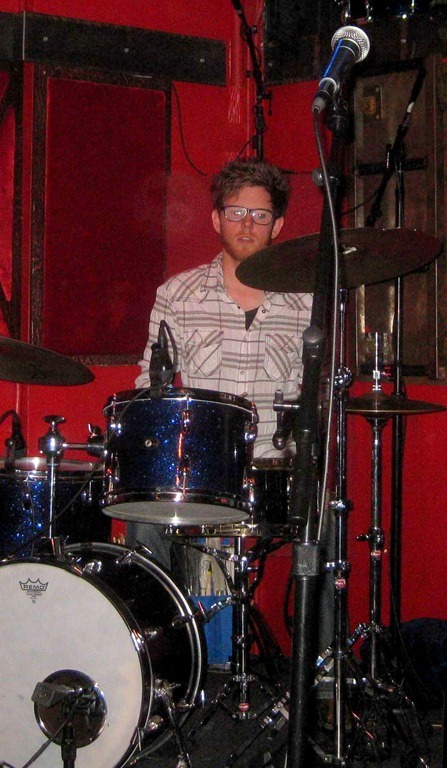 Zach Jones on drums and background vocals. Another of our favorites (have I mentioned how much I love this band?). TVB has so many driving songs and Zach keeps the action moving at just the right pace. 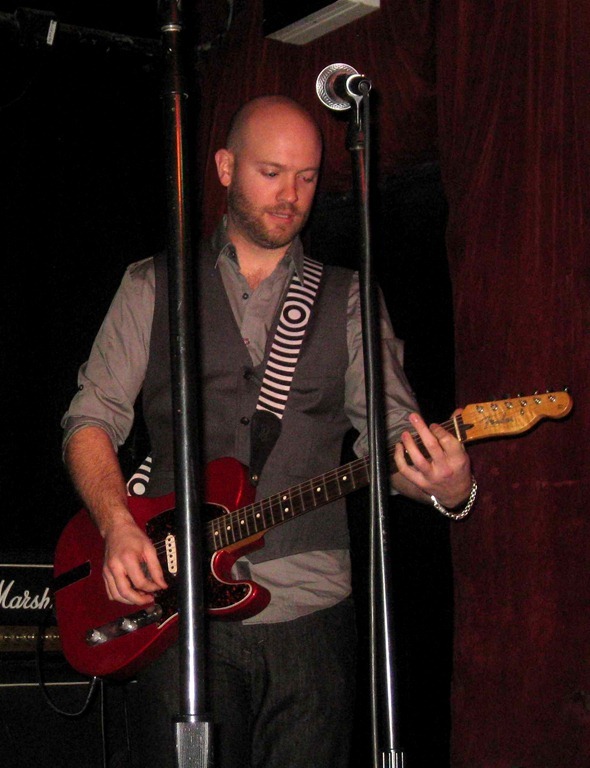 Chris Anderson on electric bass and vocals. 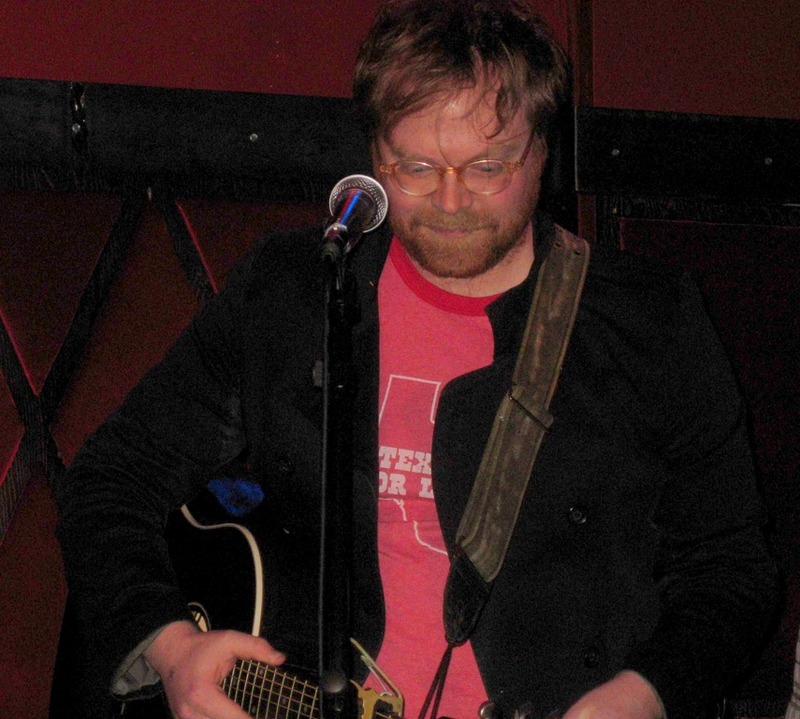 It’s been 72 hours since we’d seen Chris perform (at a house concert in VA), so we were due. Thankfully, since he’s another that always delivers! 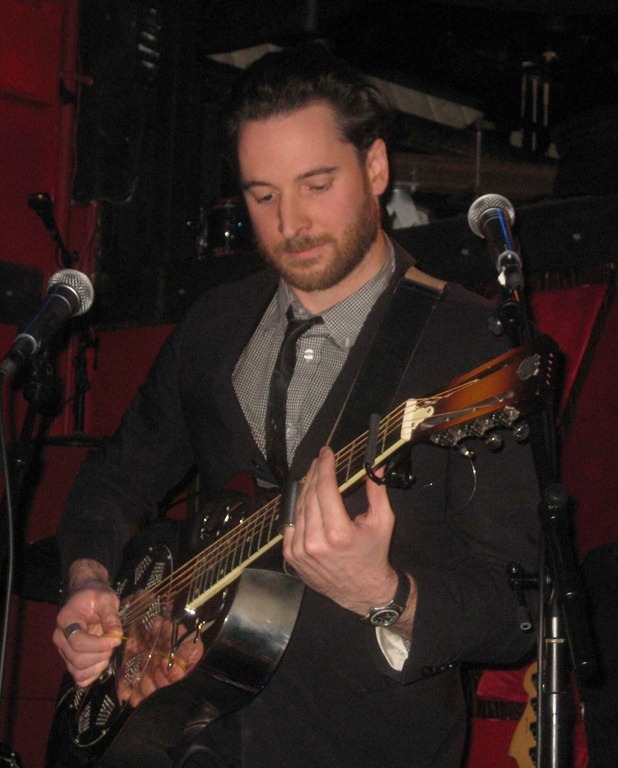 Cameron Mitchell on electric and acoustic guitars and vocals. Cameron plays rhythm guitar to Oscar’s lead (for the most part) and does it extremely well. 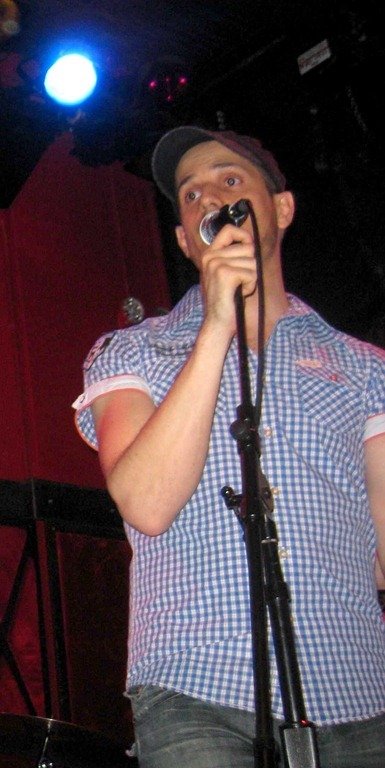 He’s also co-written with the Belles. 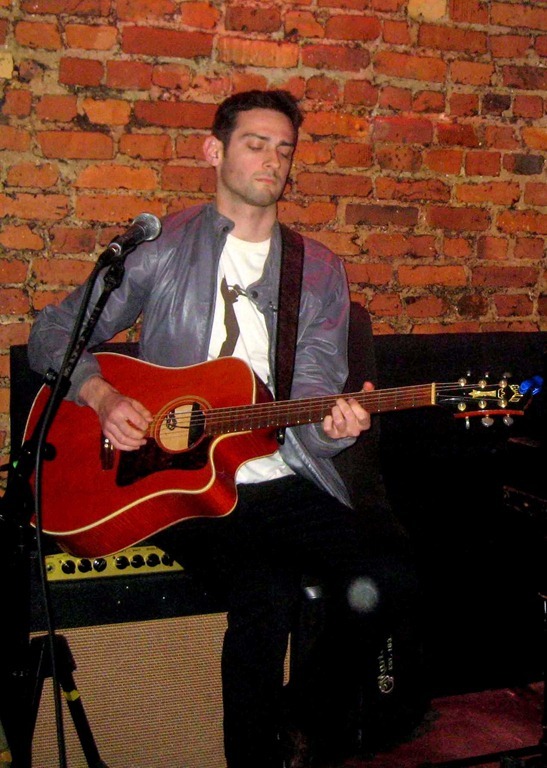 Typically, Cameron is on acoustic when Oscar is on electric and vice versa. Last night they mixed it up a bit. Cameron opened the show on electric (with Oscar also on electric) and Cameron joined Oscar on acoustic for the Toto cover. Last year, we used to consistently be out of town for TVB shows. I’m glad to say we’re in a nice zone at the moment, catching them in a variety of configurations and venues. Keep it up ladies and we’ll keep coming out to see ya. 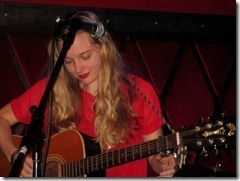 Bri Arden headlined a set at Rockwood Music Hall Stage 2 last night. 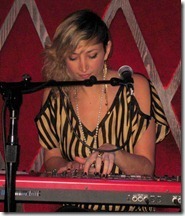 We missed her last appearance at Stage 2, her EP Release show. I heard that it was absolutely incredible, and based on all of the times I’ve seen Bri, and having listened to her EP many times, I have no reason to doubt that. It’s been 3.5 months since we last saw Bri perform. As I noted in that post, you never really know what to expect (lineup wise, hairstyle, guests, etc.). 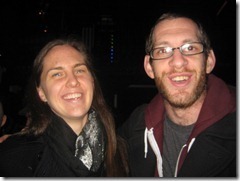 We were actually up in Westchester to catch two full sets (and an amazing meal!) at Watercolor Café earlier, and we dashed out after the second set, dropped some folks off and made it to Rockwood a few minutes late. 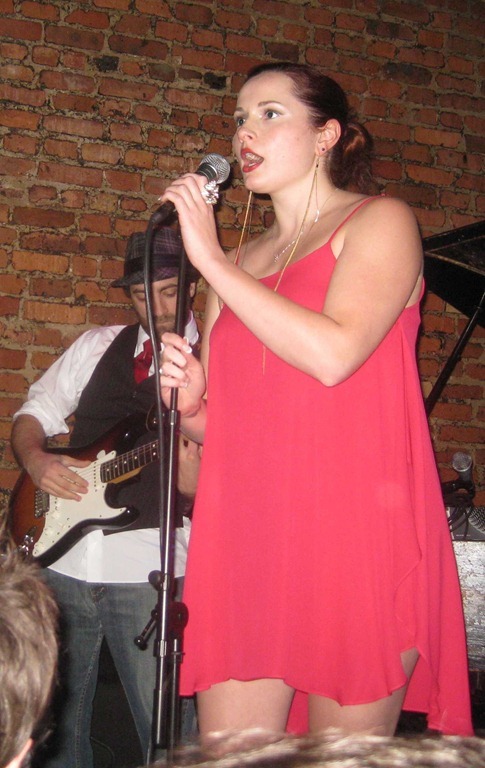 We were immediately bathed in Bri’s amazing voice, nice way to walk into a joint. Bri had a full band, always a treat. The only change that seems somewhat permanent (or at least it’s been a while), is that Bri no longer employs a duo of female backup singers. The sets are great without them, but I’ll happily admit that they were a fantastic addition (the default ladies were Valerie Mize, now based in Nashville and Kate Ferber, though others have filled in as well). Bri mixed it up. 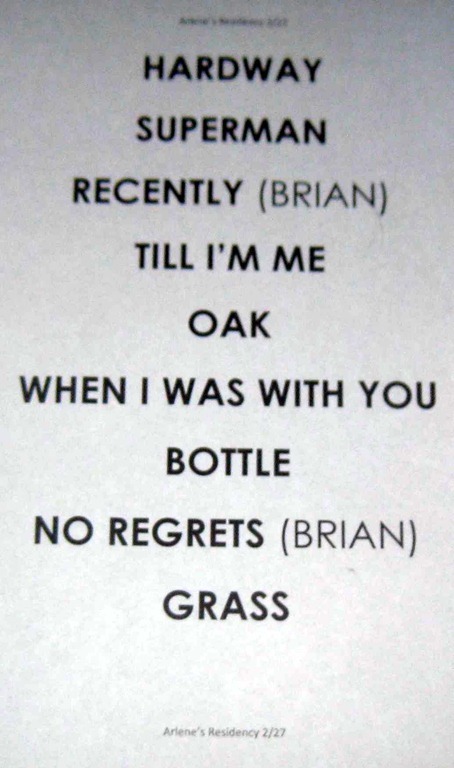 While most of the show was full band, Bri also played one song solo on the acoustic guitar. She performed another one solo at the grand piano. 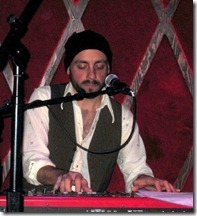 Jason Wexler on grand piano and electronic keyboards. 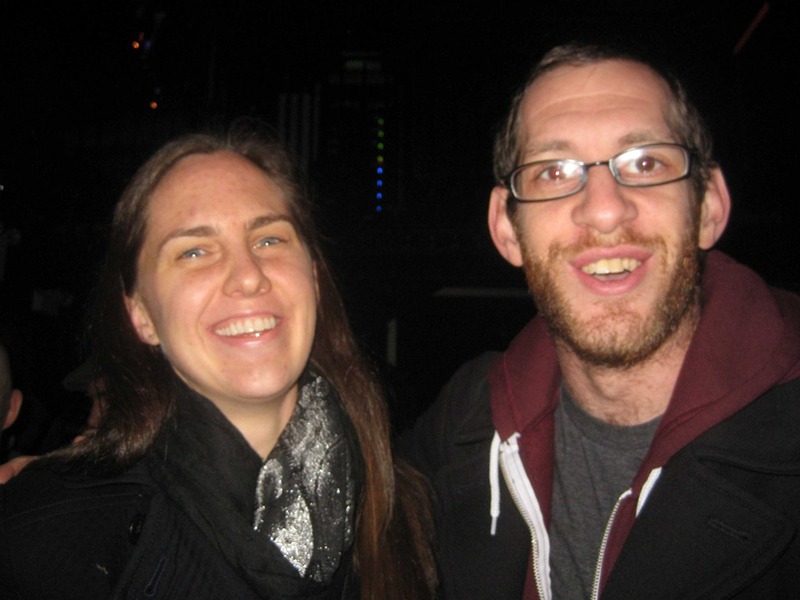 We see Jason supporting a number of our favorite artists, including Bri. He’s a superb keyboard player, and if I understood another musician friend correctly, a talented producer too. 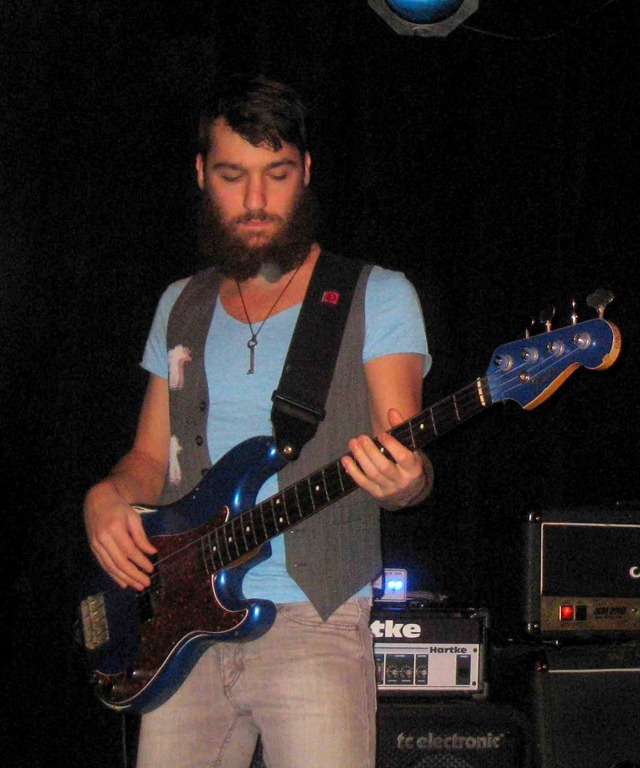 Justin Goldner on electric bass and vocals. Like Jake, Justin always impresses. 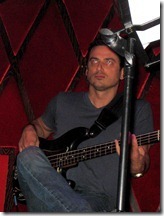 When there’s a full band, he’s the bass player. 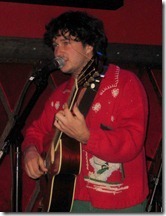 When Bri gets acoustic, he plays the guitar. 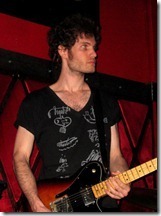 In other words, he’s an integral part of Bri’s sound, including background vocals. 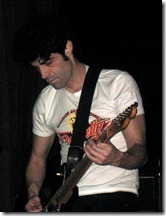 Oscar Bautista on electric guitar. 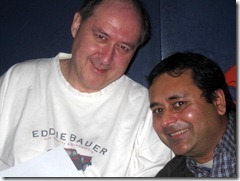 Oscar is simply amazing, always, not just when supporting Bri. Unlike Jake and Justin, we’ve seen Oscar a number of times since, with his own Police tribute cover band and with The Vanity Belles. He’s awesome. 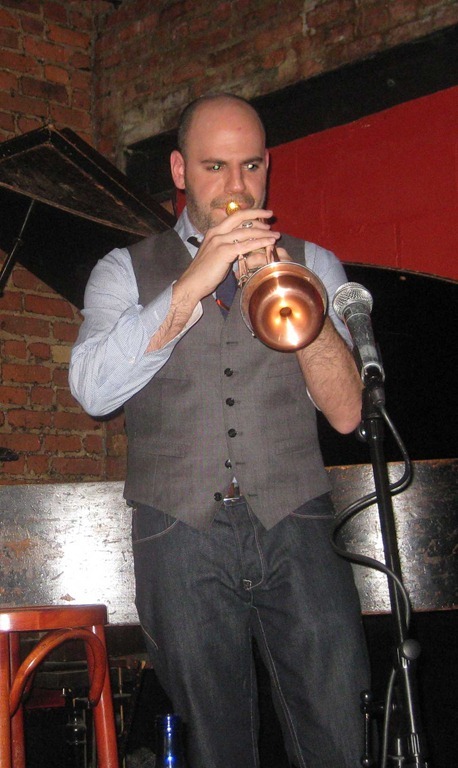 Ian Schaefer (Ian Carleton Schaefer) on trumpet. 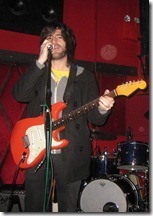 I don’t know if Ian was in the opening songs which we missed. He was called up for the final two numbers and was great. 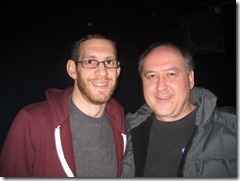 As I noted to him when we stood next to each other for the following set, he helped Bri close out the show with a bang. Leave ‘em hanging, wanting more, in no small part due to the energy that the trumpet brought to those closing numbers. 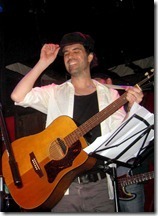 Jeremiah Birnbaum on acoustic guitar. 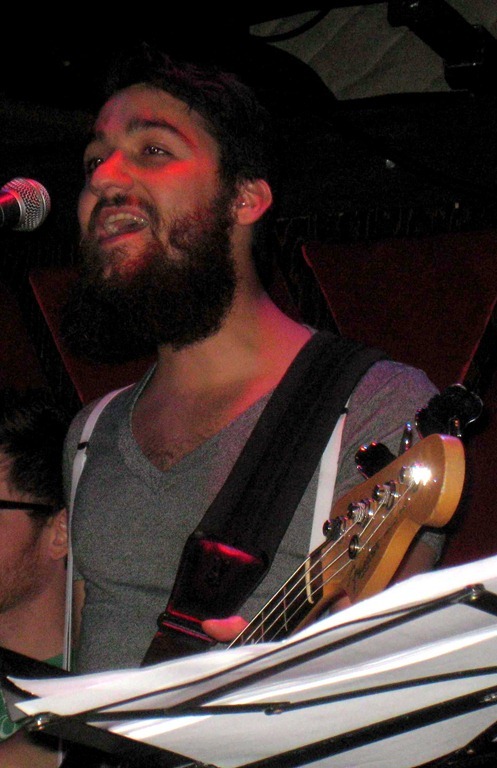 Jeremiah has filled in on bass a couple of times for Bri. Last night he joined Ian on the final two numbers to play acoustic guitar. I can’t really say that I could make out the acoustic guitar, but I can say that I really like Jeremiah, especially when he fronts his own group, The Ramblers. I mentioned one special guest above. 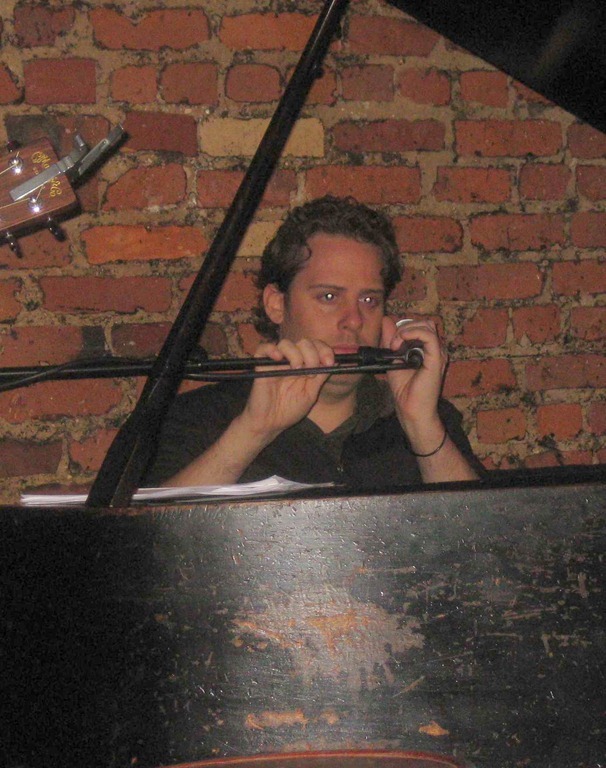 There was another, who replaced Jason at the piano, but the rest of the band played as well. 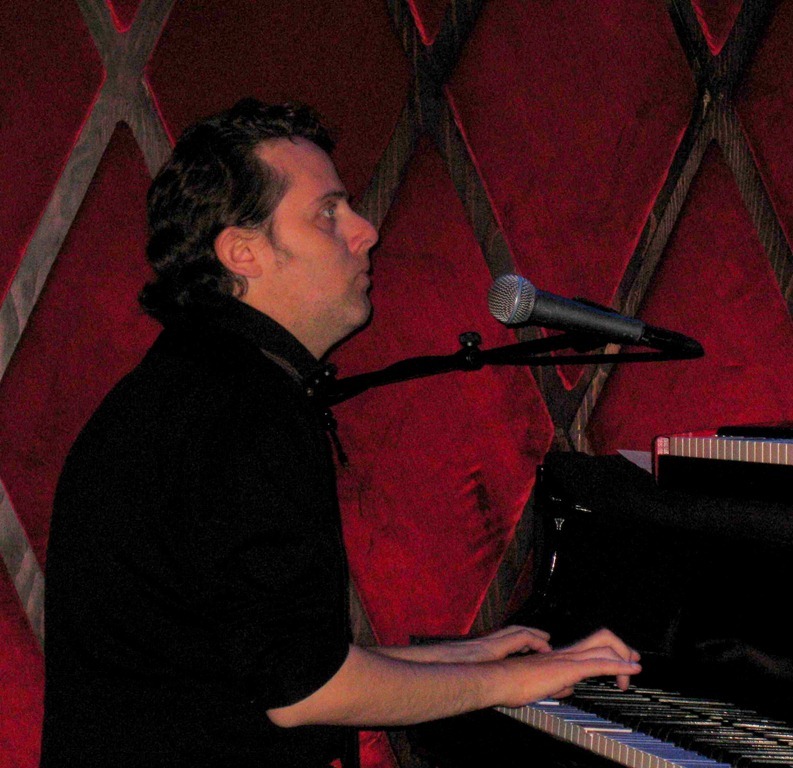 Craig Wilson played the piano on Scars Do Fade, a number he co-wrote with Bri. It’s one of a few songs they’ve co-written, all of which have impressed me, so they should continue collaborating. 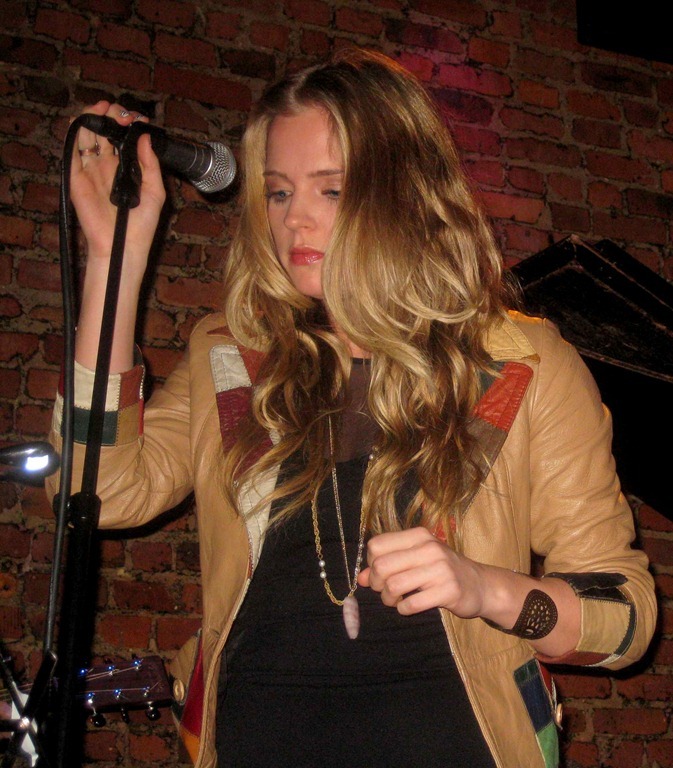 Anna Krantz joined for a number that they co-wrote very recently. 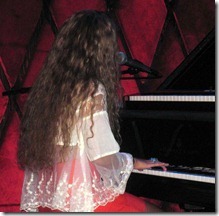 Anna played the grand piano (gorgeously!) and sang harmony just a drop. Bri was spectacular on the song, with only the piano accompanying her (one of the three songs where the band got to rest). 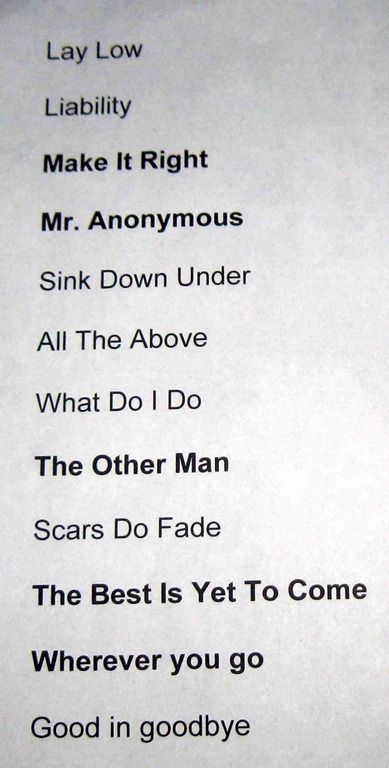 Here’s the set list, but I’m reasonably sure that not every number toward the bottom was played. Specifically, The Best Is Yet to Come wasn’t, at least I don’t remember it. Scars Do Fade and Good in Goodbye were likely the last two numbers, among my favorites! We got to say a quick hello and take some photos with Bri afterward. Thanks to some strong-arming by Sam Teichman, The Ghost was actually caught on film! 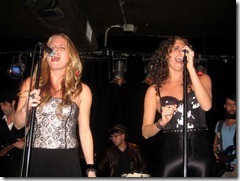 The Vanity Belles (Carrie Welling and Jessi Rae Waltz) finished up their month-long residency at Arlene’s Grocery with a bang! It was crowded (mobbed actually), it was rockin’, it was awesome. If you missed it, I feel sorry for you (seriously). 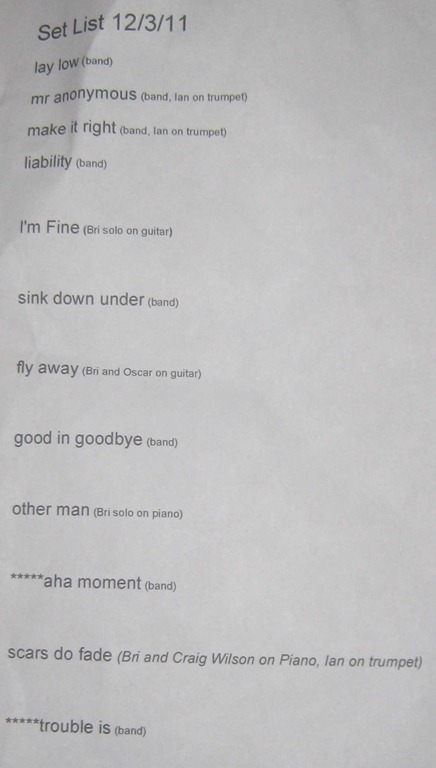 Not that this wasn’t completely fresh (it was), even though there was an 88.89% overlap in the set lists. The differences were large enough to make this a very different show than last week (including something as simple as completely varying the order of the set list!). There was a different guest, the regular keyboard player was back, and the Belles themselves seemed to be feeding off of the frenzied crowd. Or, perhaps it was the $5 Country Cosmos (created especially by Arlene’s for this one night) that fueled them (and many others). If you don’t understand the drink name above, the Belle’s self-titled genre is Cosmo-Country. So, take a Cosmopolitan (the drink), twist it a bit to be sassy like the Belles, and you have a Country Cosmo. 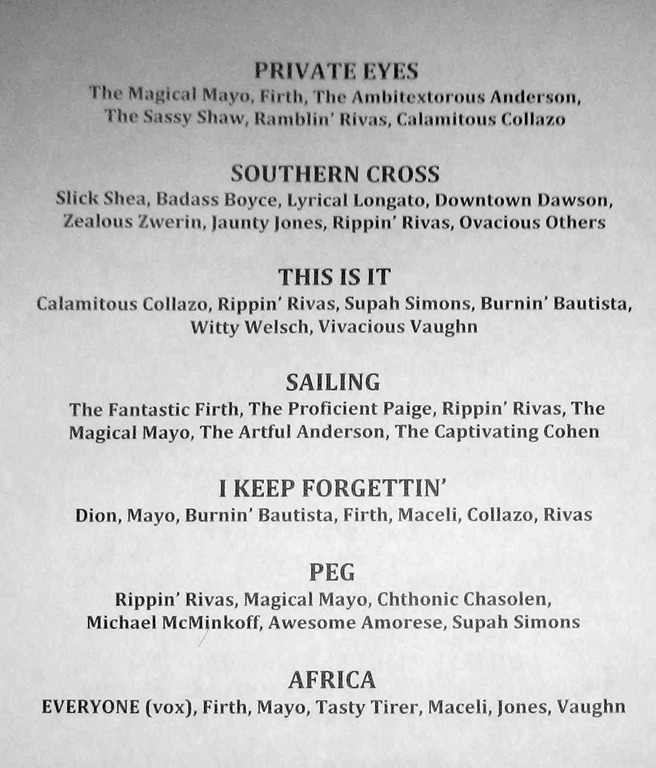 There was one song swap from last week’s set list (independent of the complete change in song order). Last night they played Till I’m Me. This is a very recent song which they wrote and recorded live in order to get it on their upcoming CD (after the real studio recording had already been wrapped up). Wow, awesome song. I’m very glad that I’ll have it when the CD comes out. Oops! When I Was With You was the new song, Till I’m Me was new for this set, but is already on last year’s EP. The ladies each played an instrument on Bottle, as they did last week. Once again, they crushed the song. 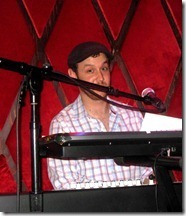 Patrick Firth, the normal keyboard player for the Belles, was back in the saddle. He’s always great, whatever group he plays with. I was a few feet from the keyboards last night, so in addition to hearing Patrick’s fine play, I got to watch him work, close up. 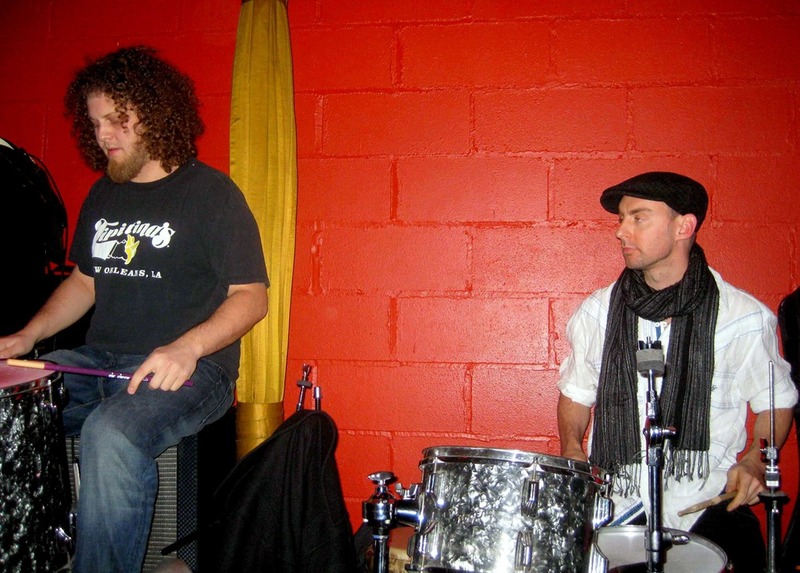 When he relinquished the keyboards on Bottle, so that Jessi could take over, Patrick stood near the drums and played the tambourine. 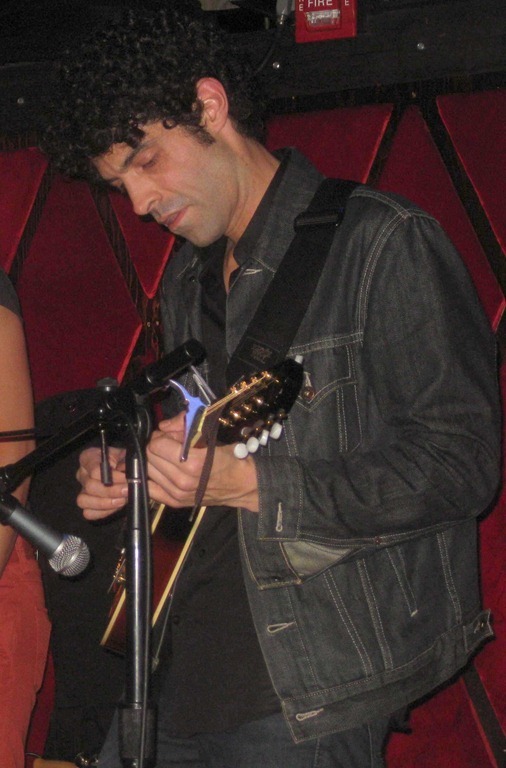 Oscar Bautista on electric and acoustic guitars, and mandolin. Oscar is always superb on the guitar. 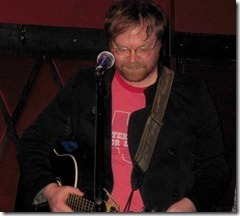 Last week I described his long solo as having a jam band feel. Last night it may have started out that way, but it took on more of a rock god type lead, and Oscar obviously realized the crowd felt that way. He stepped out from the back and finished up the lead front and center stage. It was a huge crowd-pleaser. 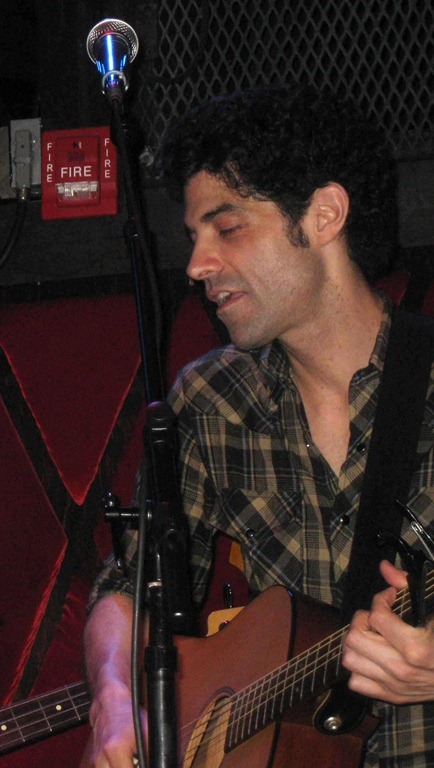 On one number, Oscar played the mandolin. Considering I love the mandolin, and love Oscar’s play, this was a real treat for me. 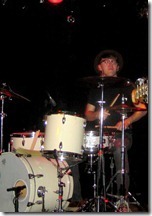 Zach Jones on drums. 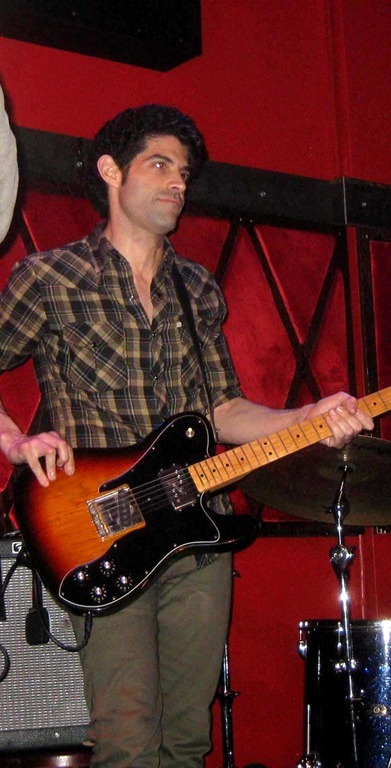 If you’ve read this space recently, then you know I’ve been raving about Zach a lot lately (in fact, my most recent post was all about his band The Stone Lonesome). 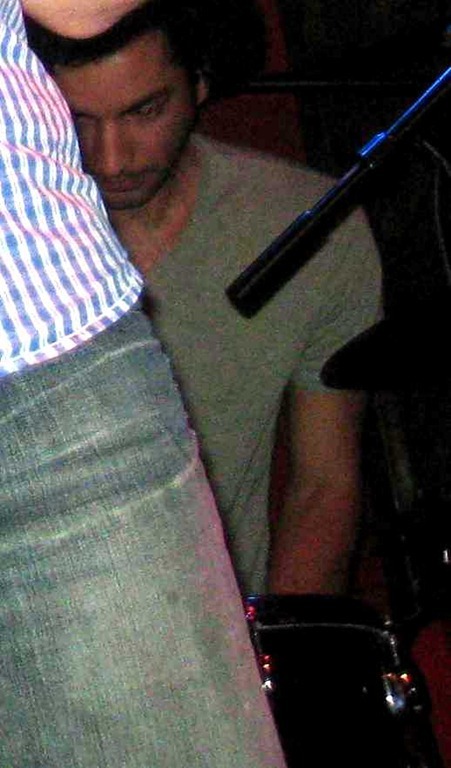 Of course his drumming was amazing last night (it always is). 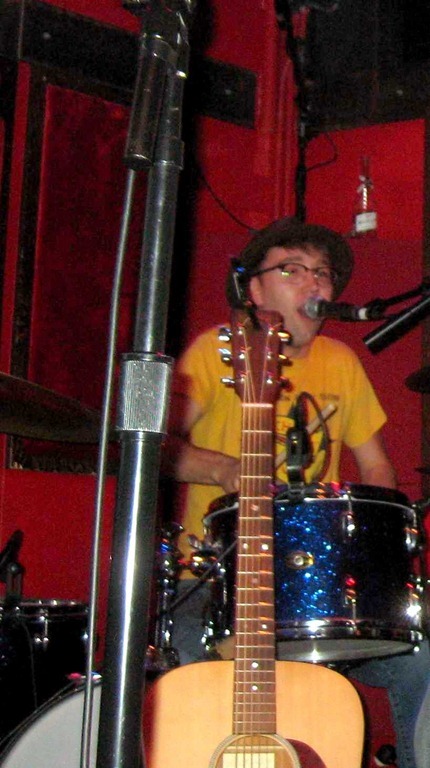 He even played the snare with his bare hands during one song, bringing out a bongo-like sound. 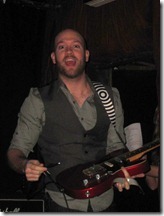 Chris Anderson on electric bass. 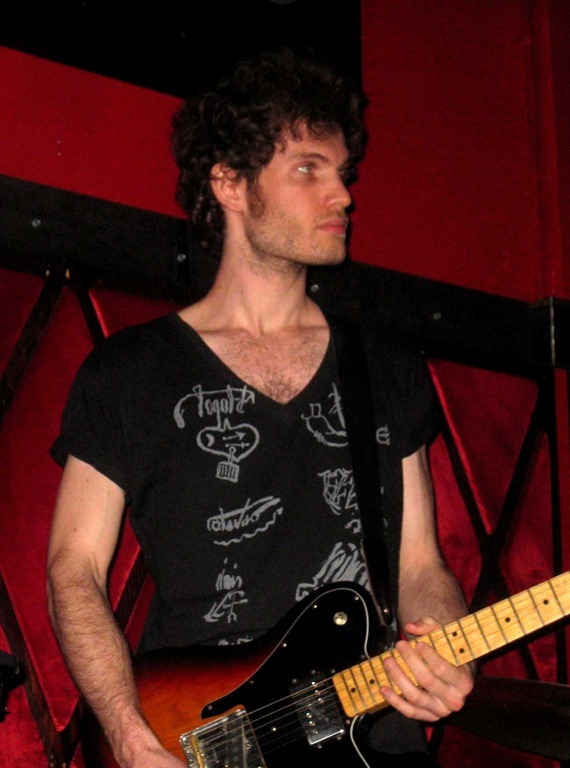 As with Zach, I’ve been raving about Chris a lot recently. 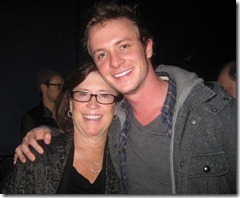 Unlike Zach, I’ve been raving about Chris for years (I only first heard Zach last July). Chris impresses every time, that is all. 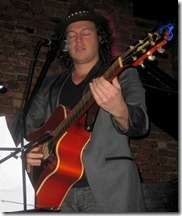 Cameron Mitchell on acoustic and electric guitars. 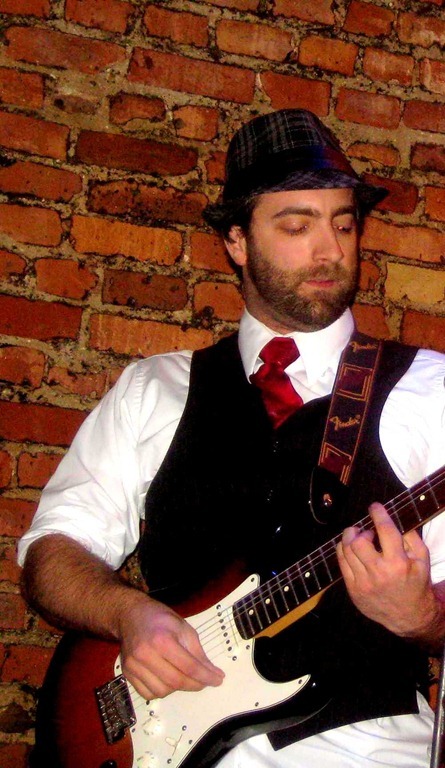 Just like last week, Cameron took on the rhythm guitar duties to complement Oscar’s lead and mandolin play. Once again, a wonderful job! 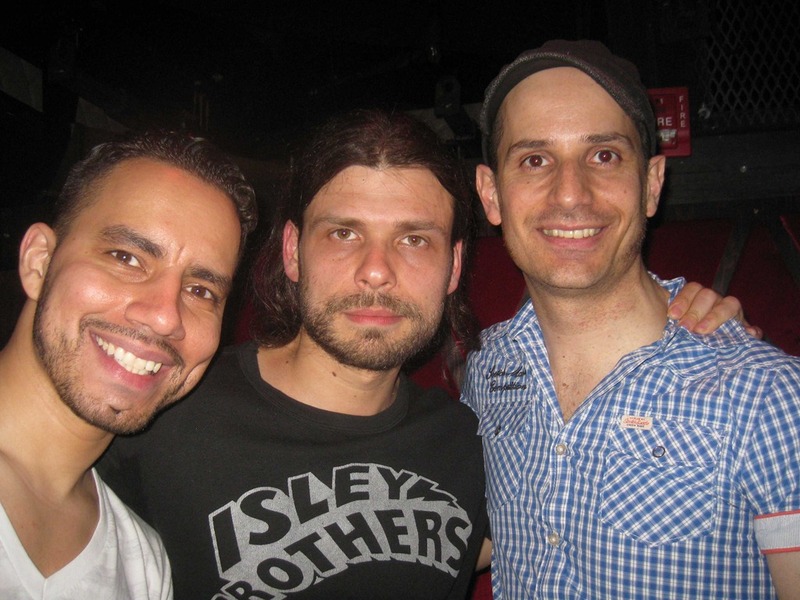 Brian Collazo (lead singer from Live Society) was the special guest last night. We could listen to Brian sing all night, every night. 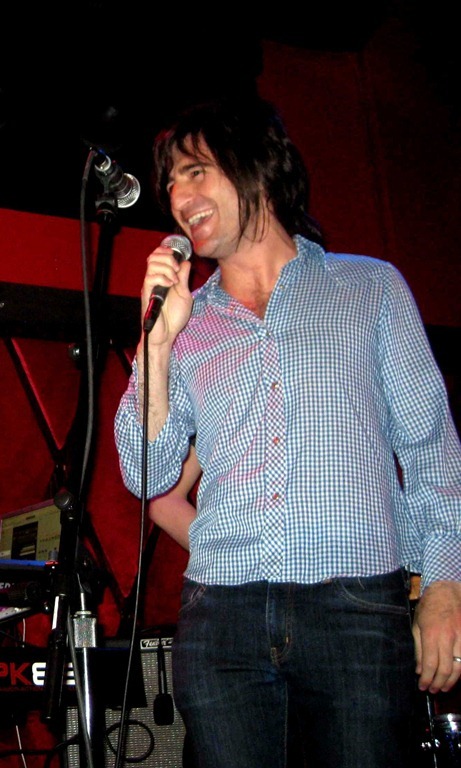 Amazingly (and achingly), it’s been five months since we’ve seen him sing, when he guested with the Belle’s Manager (I’ll get to him in a minute). It’s been eight months since we’ve seen a full Live Society show (also at Arlene’s), and we’ve been trying hard (with near misses along the way) to get to one. 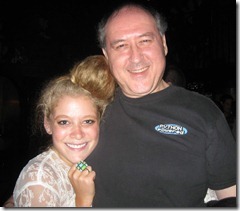 Brian sang on No Regrets (amazingly) and on Recently (which Rebecca Haviland sang with the Belles last week). It only made us want to see Brian and Live Society all-the-more. 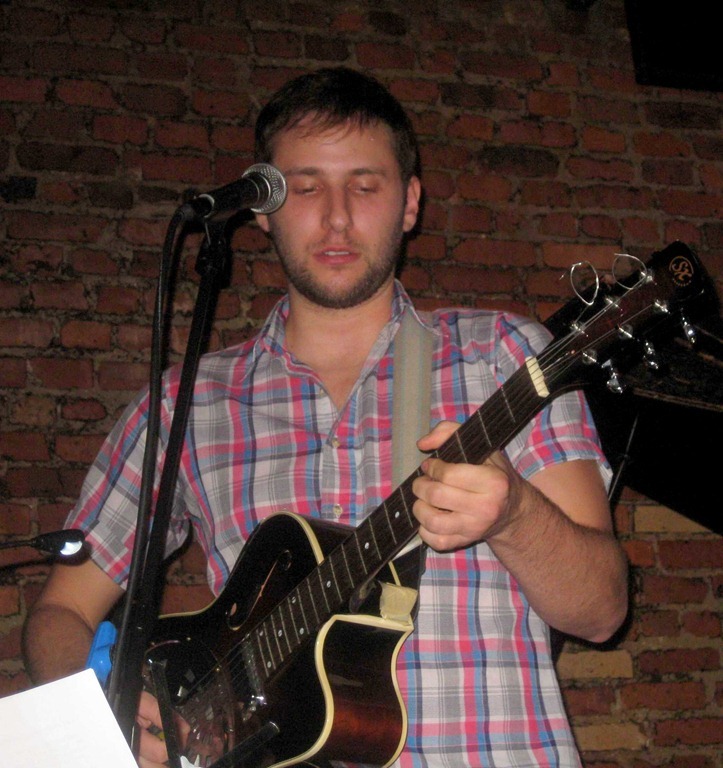 Patryk Larney has his own musical career (check him out, fall in love, and donate to his current Pledge Music campaign!). In addition to that, he manages the Belles. 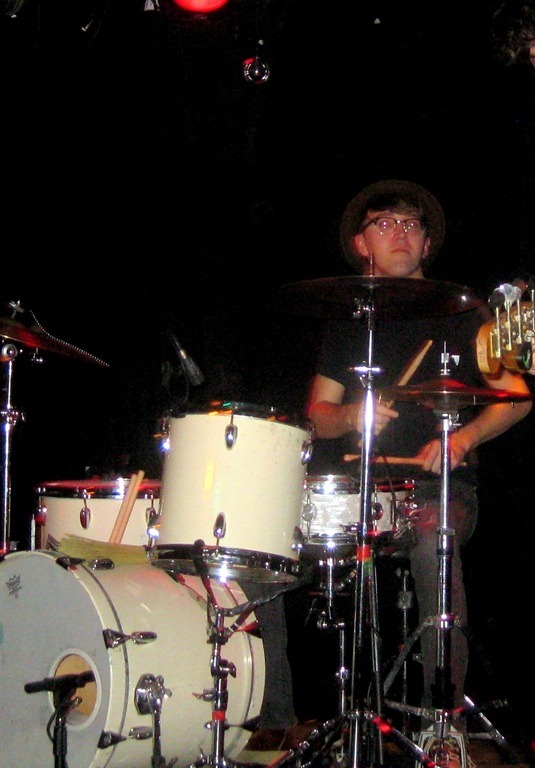 One of the 1,873 jobs that managing them entails, is being The Bucket Man at their shows. 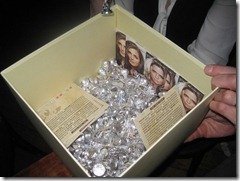 The Belles prepare treats for their audiences, and wrap them in The Vanity Belles goodie bags (genius, and delicious). He carried around a bucket filled the goodie bags last week and last night, handing them out to greedily awaiting fans. 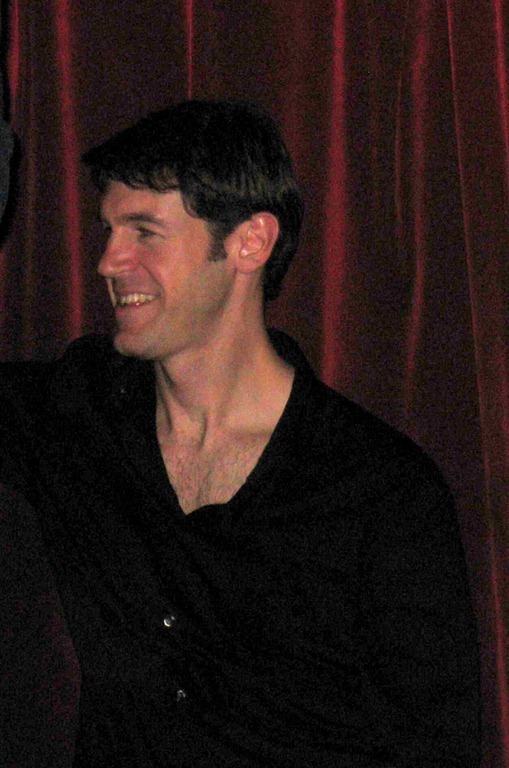 Ben Morgan, last week’s keyboard player (filling in whenever Patrick Firth can’t make it), was in the audience enjoying himself as much as the rest of us were. 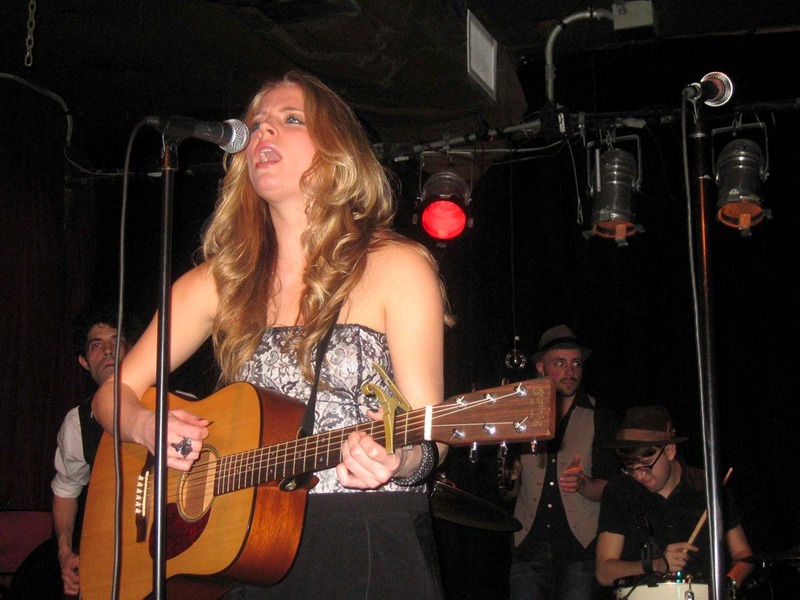 The Vanity Belles have a month-long residency at Arlene’s Grocery, every Monday at 8pm in February. We missed the first two and expected to miss last night as well. I was sick the last two weeks of January and we’ve been gone all of February. We cut our trip short by a few days, largely to make it to last night’s show. Glad we did! 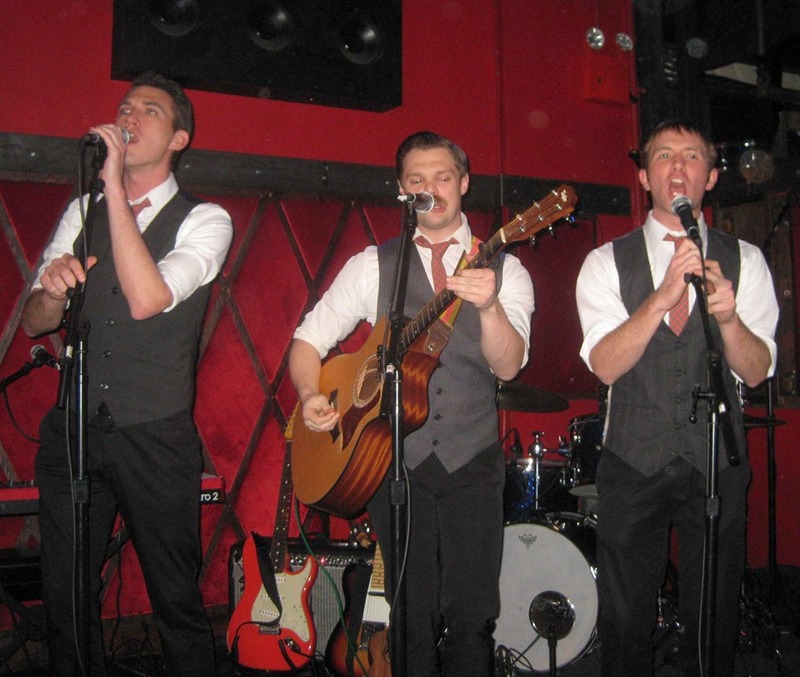 Amazingly, last night was the first full set we’ve see of the Belles! I honestly believe that they peek at my travel calendar and purposely schedule their shows for when I have to be out of town. At least I finally fooled them by coming home earlier than expected. Take that Belles! 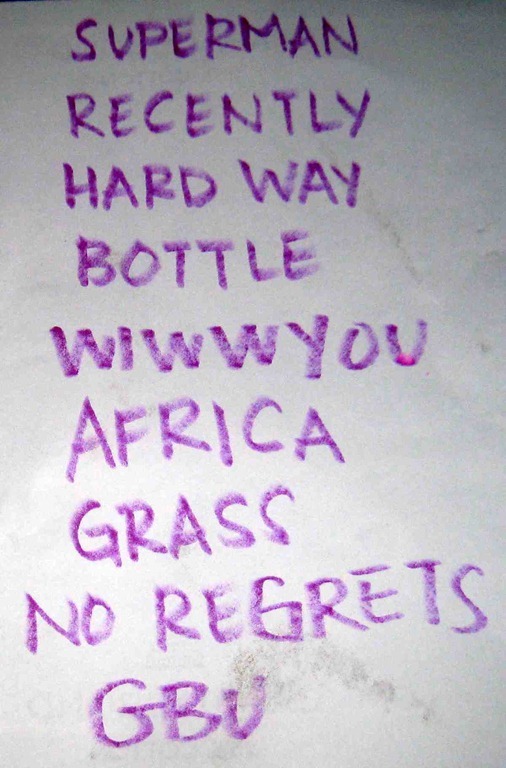 All of the above was in abundance last night. The ladies were in fine voice, the set selection very upbeat (many songs feeling closer to rock). They were complemented by an incredible band with special guest stars thrown in just in case you needed to amp up the excitement a bit. 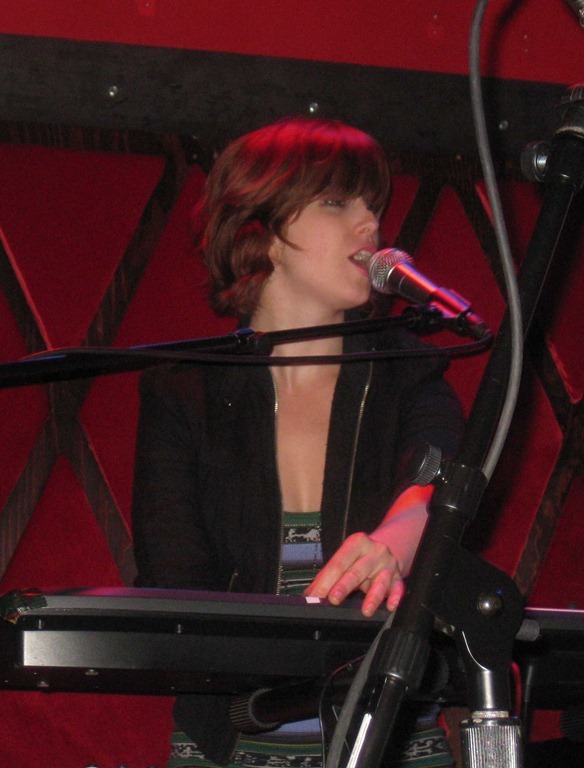 On one of the more mellow (yet still very powerful) songs, Jessi played the keyboards and Carrie took up the acoustic guitar. Both played well and sang phenomenally. After the show, we bought two copies of the 3-song EP they released last year (yes, they scheduled the EP Release Show for when we were out of town). All three songs are wonderful! We also backed their recent Kickstarter early (they were successful) and are looking forward to the new full-length CD, which should be coming out in the not-too-distant future. 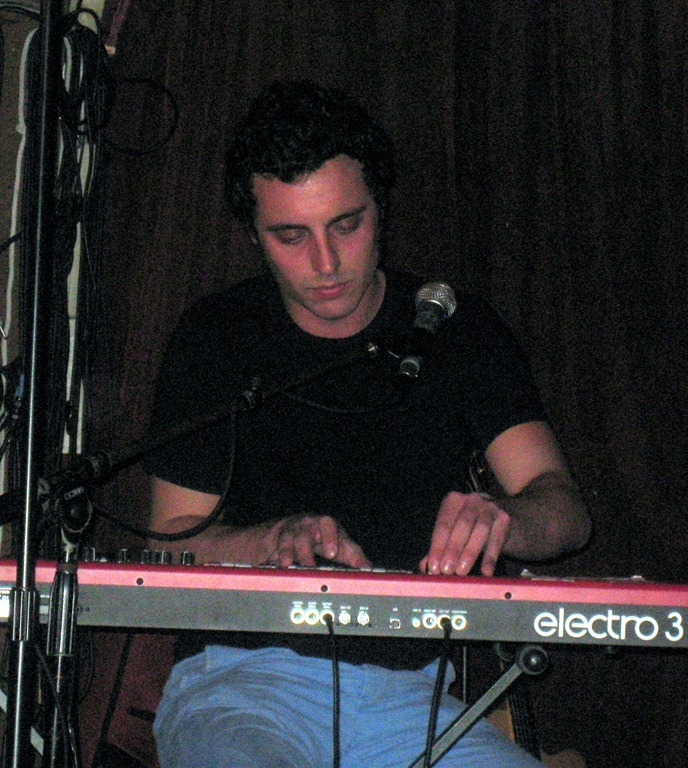 Ben Morgan on electronic keyboards. 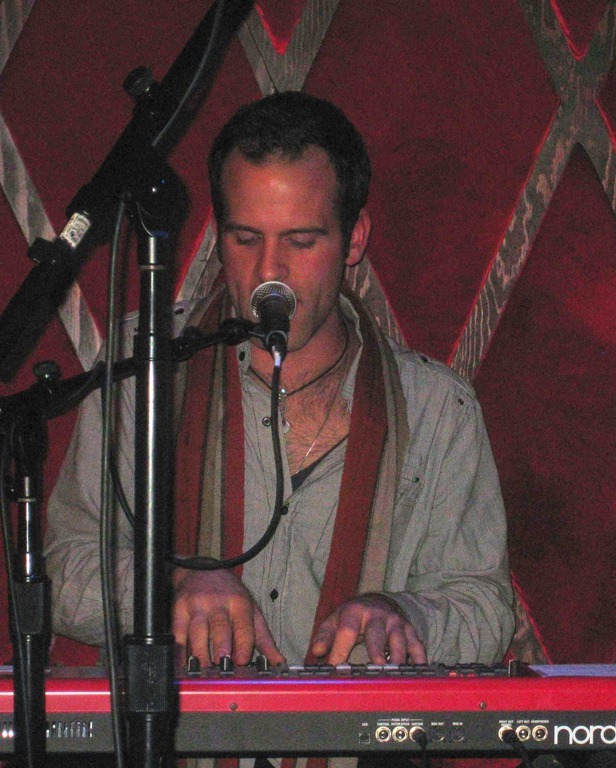 Ben is extremely talented on the keyboards. We’ve seen him support the Belles a number of times. He was excellent last night. 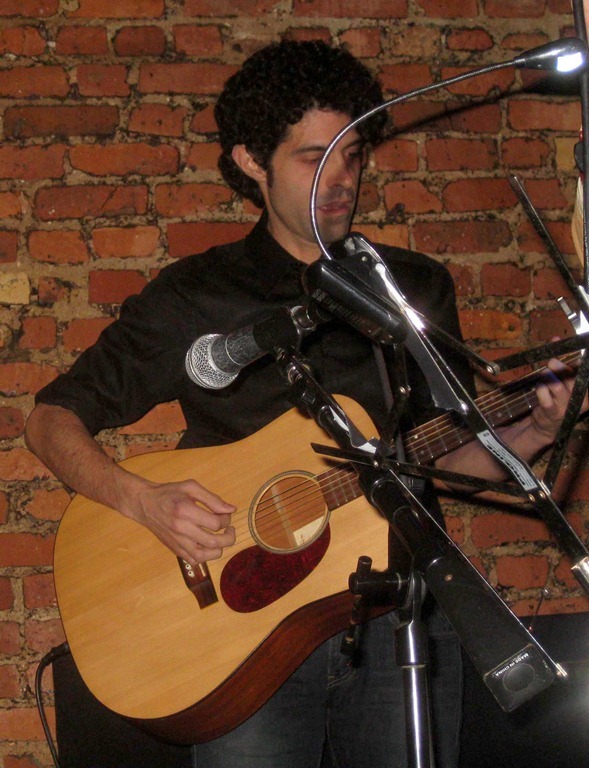 Oscar Bautista on electric and acoustic guitars. Oscar is always fantastic. In fact, the last show we saw, just over a month ago, was also part of month-long Arlene’s residency, a Police tribute band. We went solely to see Oscar. While he was great throughout last night’s set, during No Regrets, the ladies stepped aside and let Oscar take over the lead. The sound and feel was reminiscent of listening to a great jam band reel you in with a long guitar solo. Very well done! 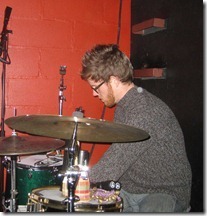 Zach Jones on drums. 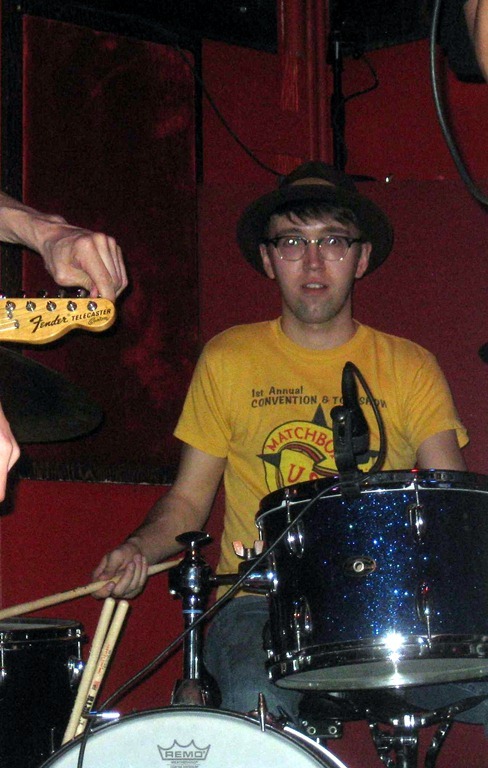 Zach is one of our favorite drummers. It was a complete surprise to see him playing with the Belles last night. He was at the top of his game. So are the other regular drummers that the Belles use, so it’s clear they can attract the best talent when they come a callin’. 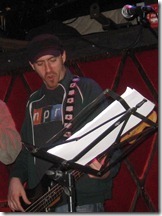 Chris Anderson on electric bass. Chis is an amazing bass player with tremendous versatility. Arlene’s is a very loud club, often most noticeable in the bass shaking the joint on every note. 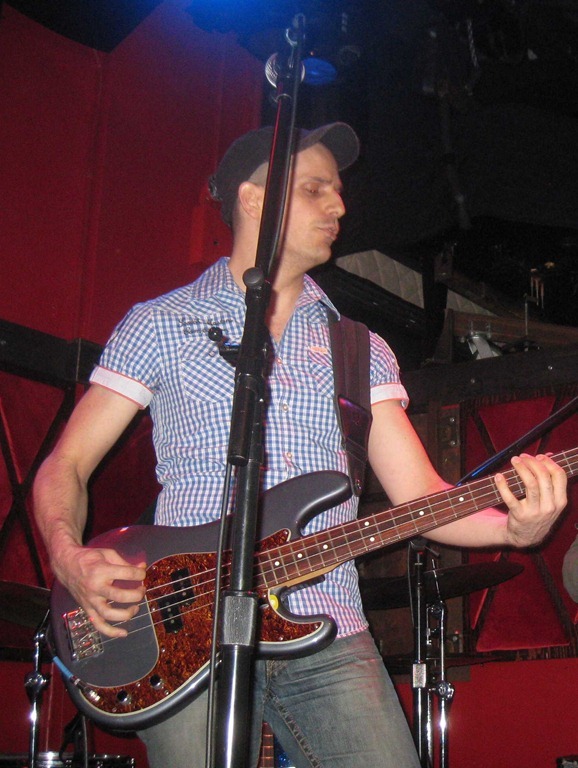 I have little issue with it when the bass player has the skill that Chris has. Last night, Chris shook me, in a good way! 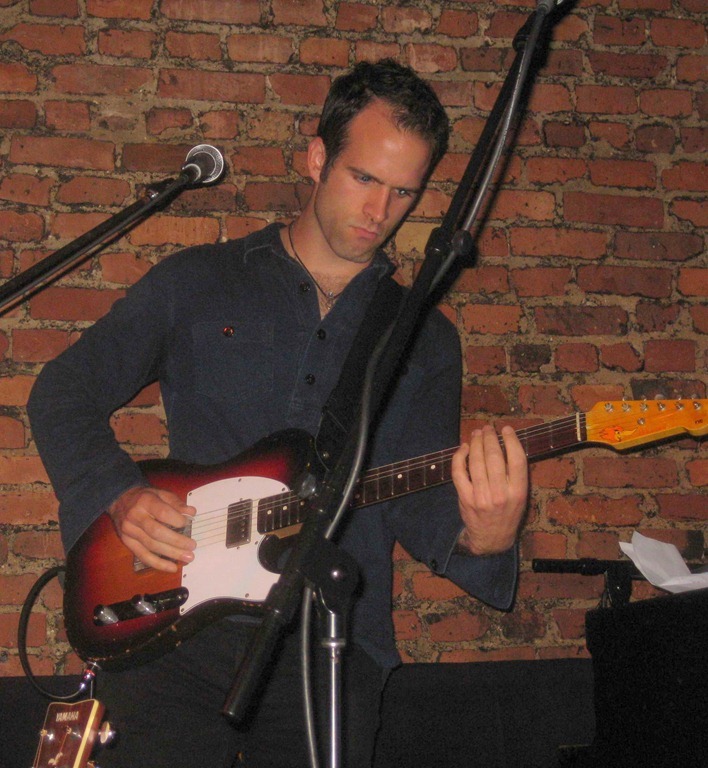 Cameron Mitchell on electric and acoustic guitars. While Oscar took most of the leads, Cameron was playing rhythm for the most part, very well. 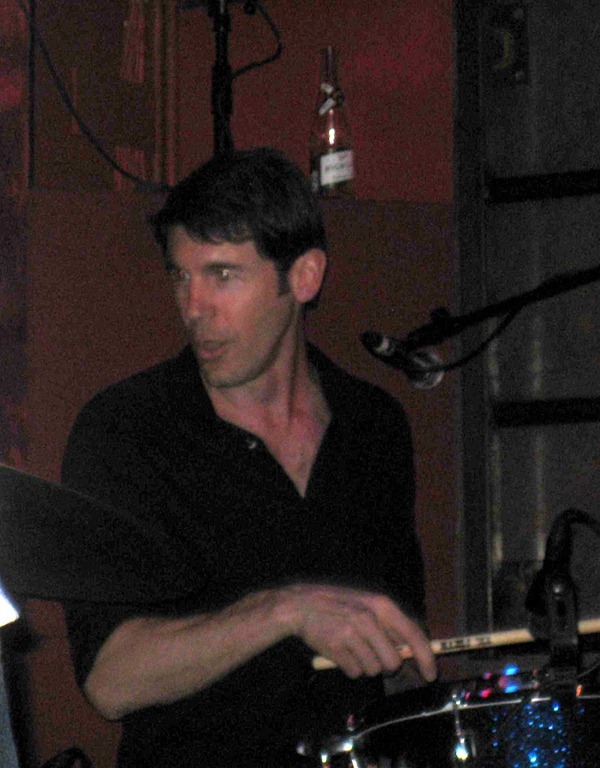 He also seemed to be one of the leaders in terms of cueing the rest of the band. 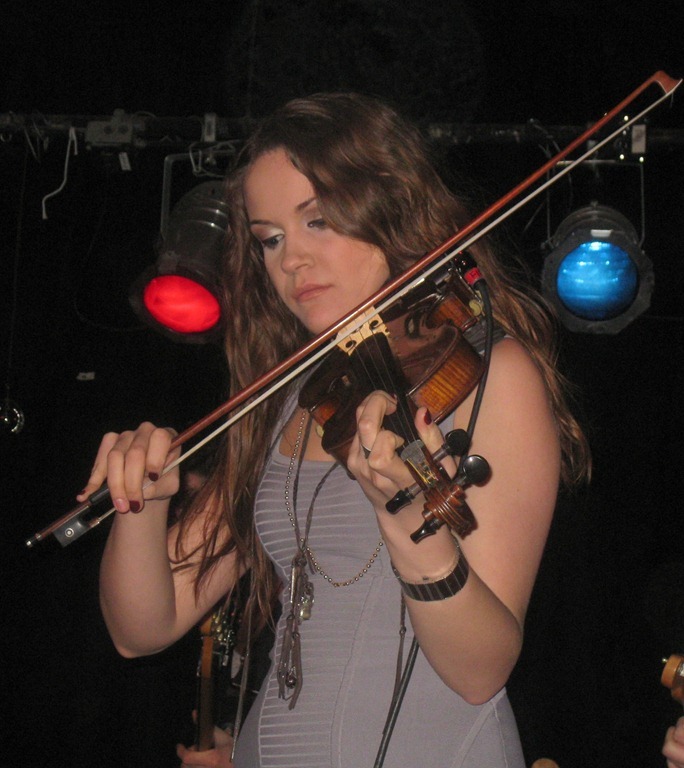 Rebecca Haviland joined for three numbers, including the first one. 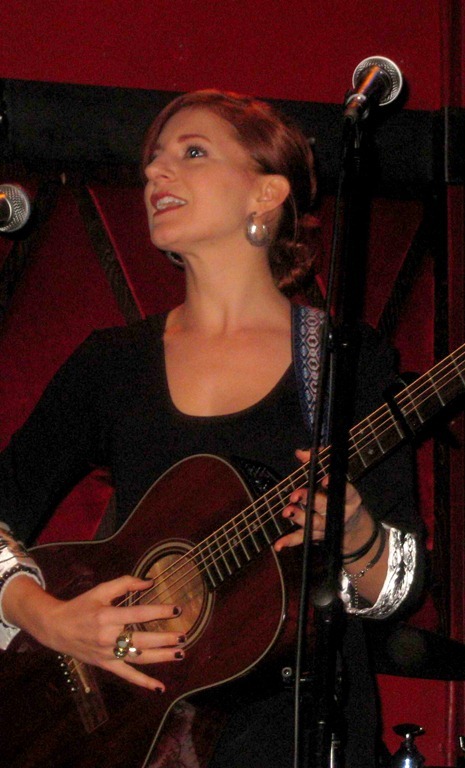 Rebecca is one of our favorite singer/songwriters (she co-writes and performs with Chris Anderson). 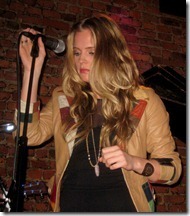 In her own band Rebecca plays electric guitar. 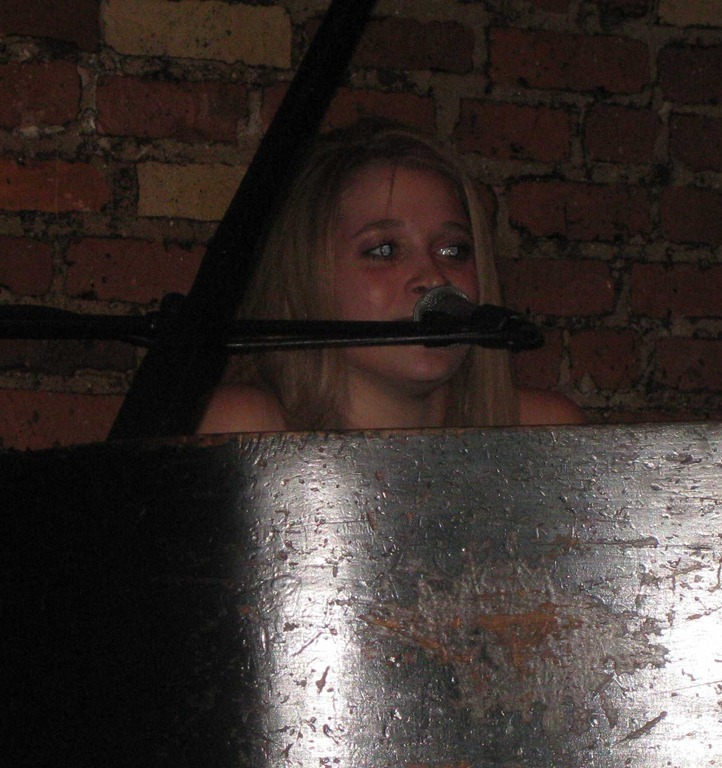 The first time we ever saw her play an instrument though, it was the grand piano, just over a year ago. 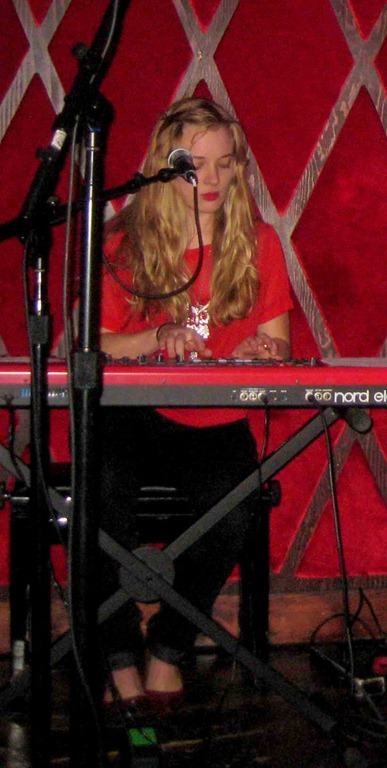 I think she’s great on the keyboards, and I can’t believe it’s taken this long to see her tickle the (fake) ivories again. 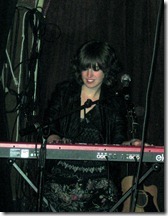 In addition to playing the keyboards, Rebecca sang background vocals on the closing number. The Belles don’t need any help in the vocal department, but if they’re going to invite a third voice into the mix, it would be hard to pick someone better suited to hold their own than Rebecca. We didn’t know until yesterday afternoon that Rebecca would be joining them, so it was an extra special treat. Sierra Noble played the fiddle on two numbers. Yesterday was Sierra’s 22nd birthday. 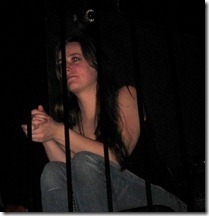 I’m glad that she chose to celebrate it on stage, entertaining us, rather than in a more private way. I knew for a week that Sierra was joining and it was one of the reasons for cutting our trip short. I don’t think Sierra will be there next Monday, so last night would have a special flavor all its own. We bumped into a number of friends that we haven’t seen in a month (always a big draw for going out). Hopefully, we made a new one too (I’m looking at you Jack!). We’re going to do our best to make it out to Arlene’s next Monday at 8pm for the final show in the residency. Do yourself a favor and come out as well! 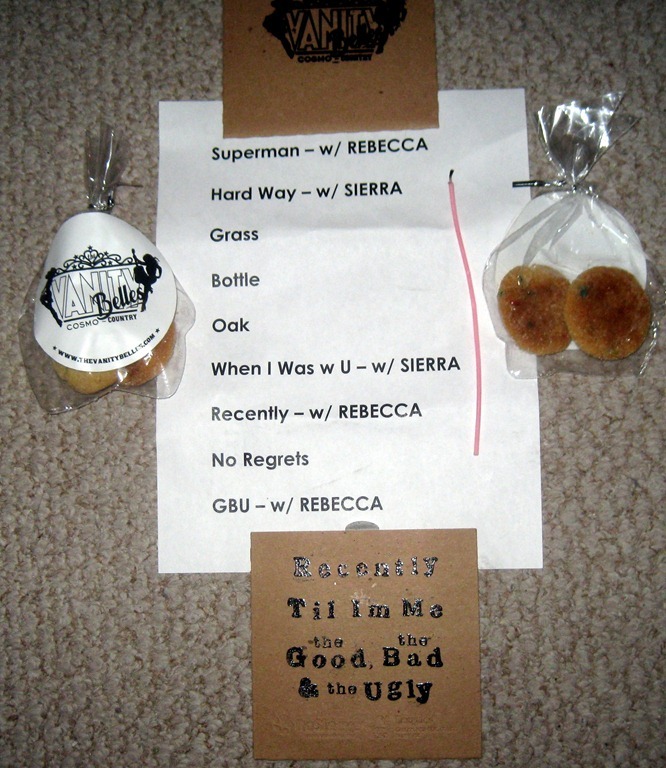 The Vanity Belles usually hand out goodies at each show (I only know that from Twitter, this being our first full set). 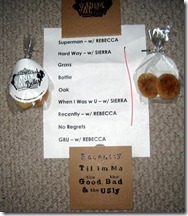 Here’s a photo of the set list, with the front and back of the EP, and the goodie bag (front and back). Don’t miss next week’s treats! I’m the optimal age to have been a major fan of The Police. I wasn’t, not because I didn’t care for their music, it’s just one of those things. I never owned any of their CDs and never saw them perform. Through osmosis, I am obviously familiar with a number of their hits, but even some of those I don’t instantly associate with any particular band, including The Police. So, you might wonder why we went to Arlene’s Grocery last night for a 10pm set by a Police tribute band. 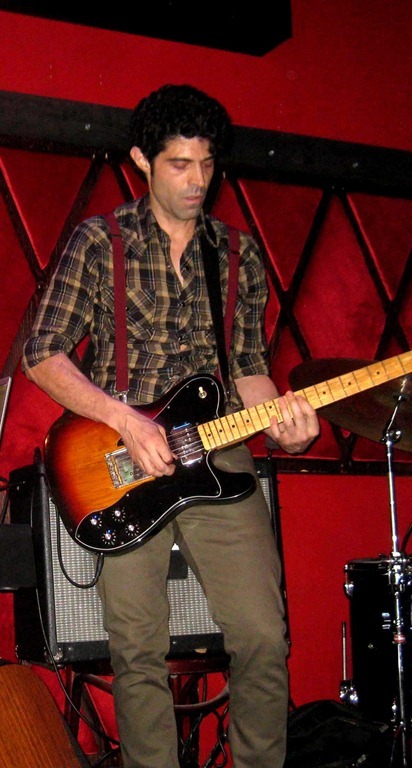 Oscar Bautista is a superb NYC-based guitar player. We’d pretty much go see him in whatever project he was involved in, at least once. That’s what got us to Arlene’s last night. 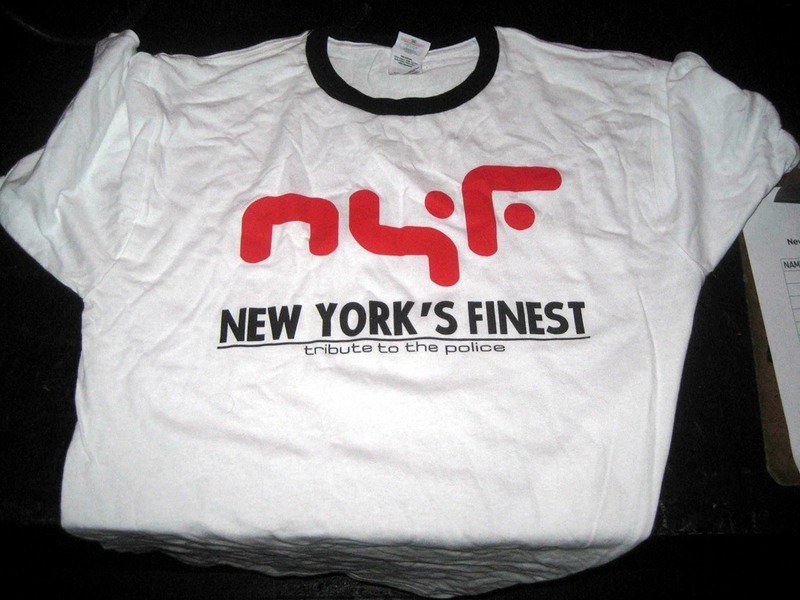 New York’s Finest (Police tribute) is three incredibly talented guys who do a great job of faithfully reproducing the sound of The Police, vocally and instrumentally. 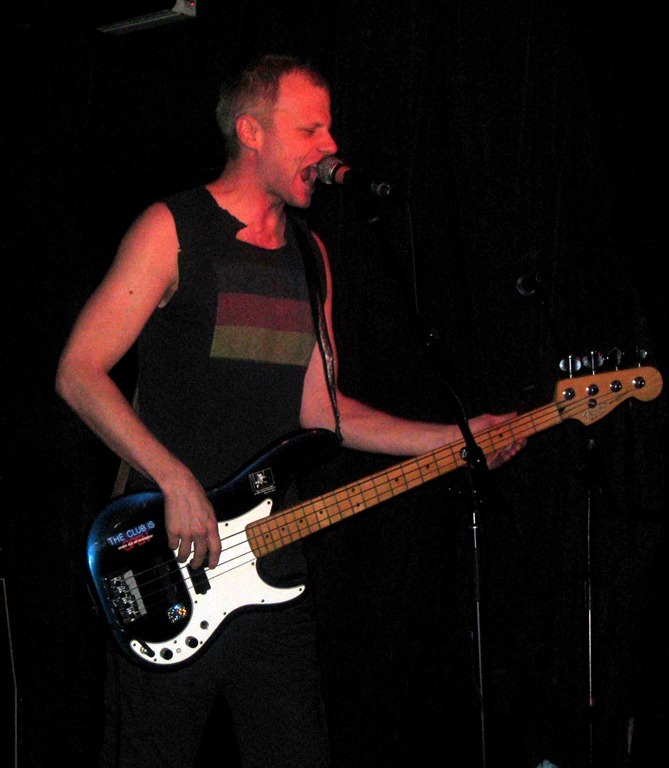 Mark Rinzel sang lead and played the electric bass. Aside from looking an awful lot like Sting, Mark sounds like him (at least when singing The Police songs). 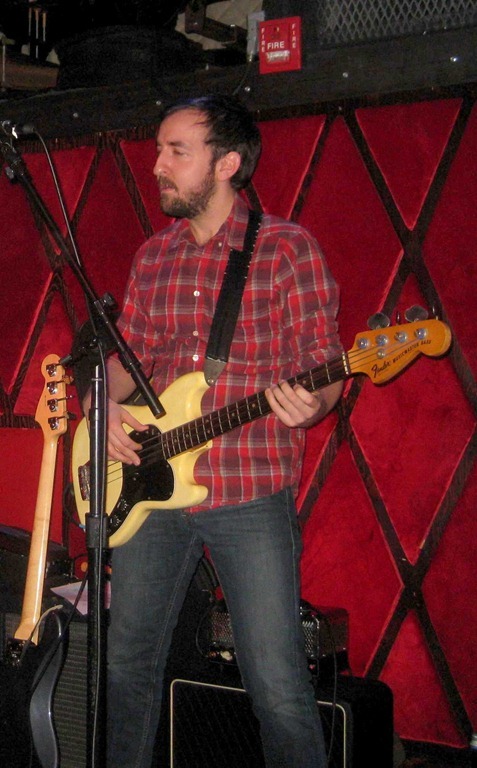 He’s excellent on the bass and is a showman with wonderful stage presence. 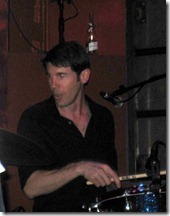 Alan Camlet on drums and vocals (sorry, no good individual musical link). Alan was excellent on the drums, ripping it up for the entire set. He also sang harmony on nearly every number. 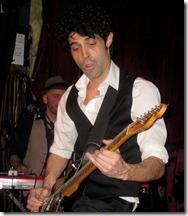 Oscar Bautista on electric guitar and vocals. 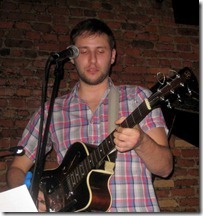 Oscar was fantastic on the guitar (validating our reason for attending in the first place!). 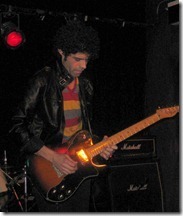 In addition to straight up leads, Oscar utilized a slide and some serious effects (including looping the slide with a fuzz effect creating an enormous sound). He sang less than Alan, but when he did, the three-part harmonies worked extremely well. 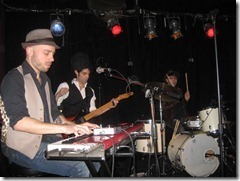 They have been playing a month-long residency at Arlene’s, with one show to go. If you want to verify any of the claims I made above, please get to Arlene’s next Tuesday, January 24th, at 10pm. If you are a fan of The Police, you’ll really thank me. If you’re not, but want to see three talented musicians execute an exceptional set, you’ll still thank me. Either way, win/win for you and me. The three of them created a huge sound (as I bet The Police did live), making the energy in the room heart-pumping on every number. 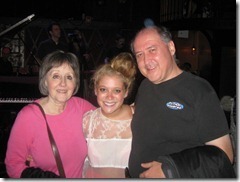 We were very glad we went, both for the music and for running into some of our favorite people, completely unexpected. Last night we attended the early show at Joe’s Pub. Under normal circumstances, we would have run home after the show. These were not normal circumstances. 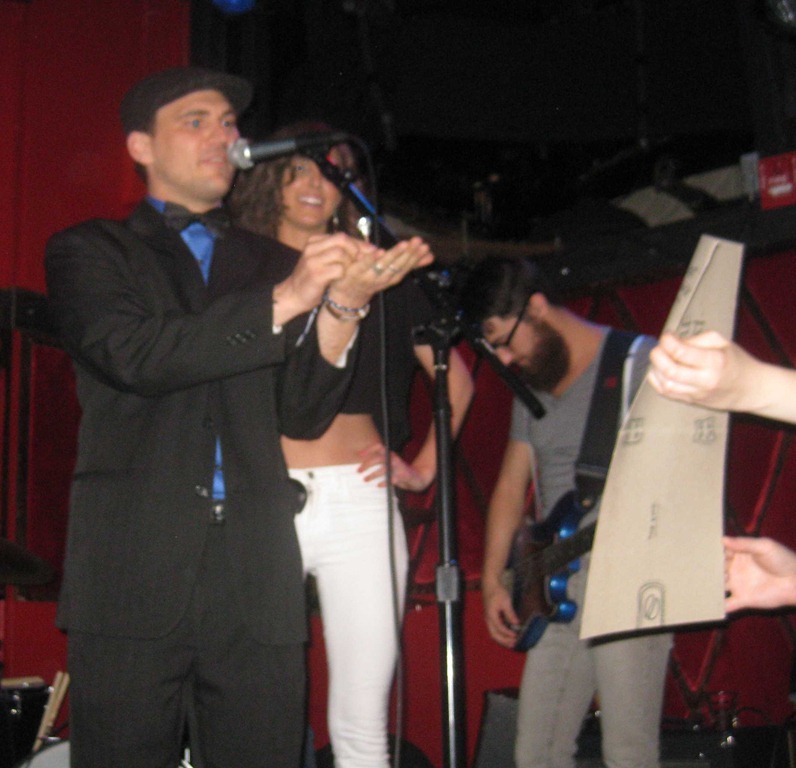 Over at Rockwood Music Hall, timed perfectly for us, was Backscratch XVII. That would have been more than enough to get us to stay out for another few hours. More poignantly, and most unfortunately, this was also billed as the last NYC-based Backscratch. Folks, that’s simply a tragedy (of reasonably large proportions). 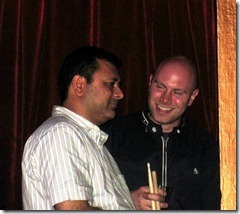 The concept of Backscratch was originated by Martin Rivas (and I think Craig Meyer). It will live on in London, run by Alex Berger, but unless I can find a way to blackmail Martin (or twist his arm really hard), it’s going to be very expensive to catch one of these shows in the future. 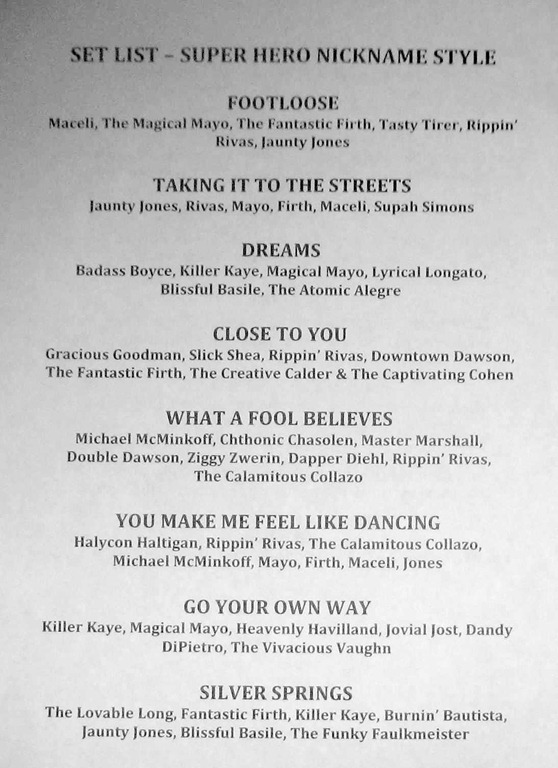 In addition to just wanting to catch any Backscratch show, the lineup for last night was particularly tasty. Every performer was particularly sharp (they understood the stakes), so it ended up being an extra-special night all around. Quick recap of what a Backscratch is: 6-9 performers. Each does three numbers. One has to be a cover of one of the other performers. They get drawn randomly and no one knows in advance who is doing their song. For the other two numbers, deep tradition has the artist performing one of their originals plus a well-known cover. 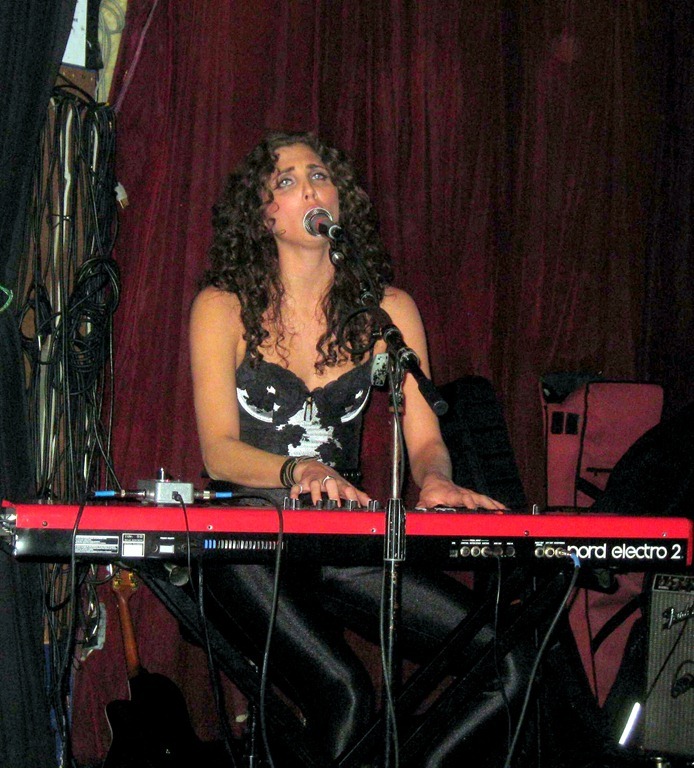 More recently, many artists perform two originals. Stephanie White and the Philth Harmonic were up first. 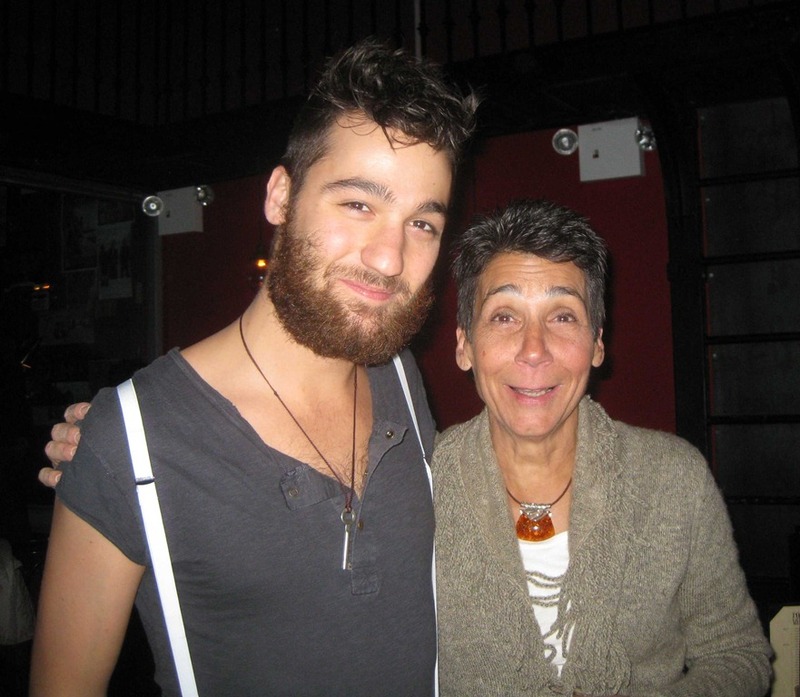 The Philth Harmonic is Robbie LaFalce (considering that Stephanie’s name appears separately and there are only two of them). Let’s start with Stephanie. 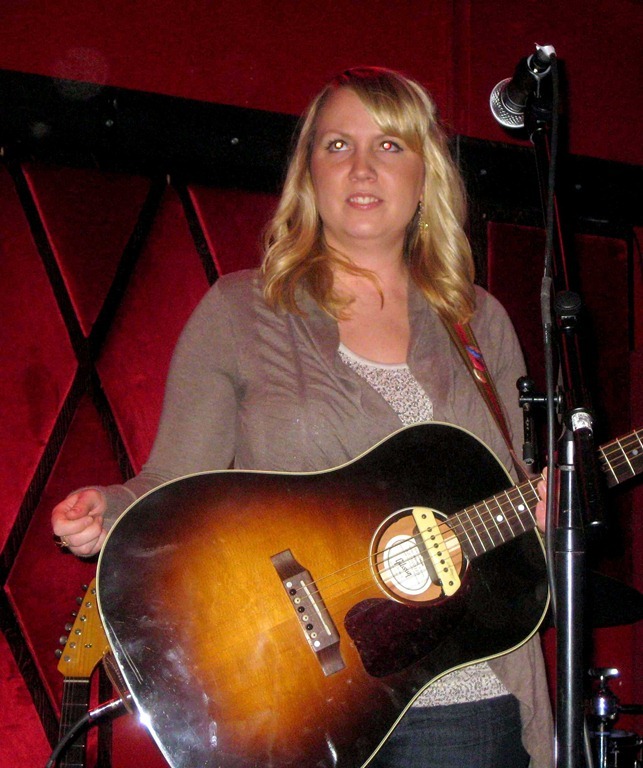 We’ve seen her sing one song, at one of Sam Techman’s Leave a Lasting Mark benefit shows. She was extraordinary then, and again last night. The woman can sing, pure and simple. 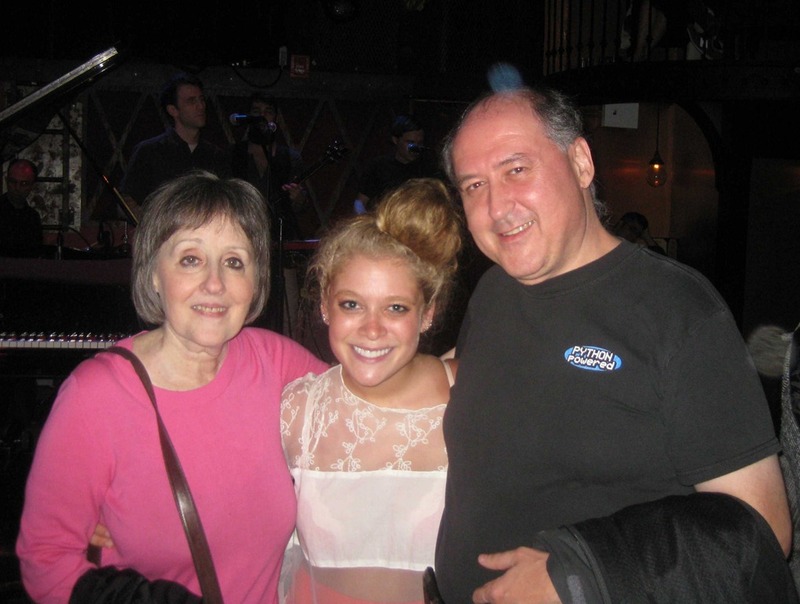 We’ve seen Robbie LaFalce three times, all at Sam Teichman benefits. At the first, he drummed. The second, he played piano. The third, he drummed, played piano, and sang. Last night, he played the electric guitar on all three numbers. Beautiful play, subtly, but interestingly supporting Stephanie. 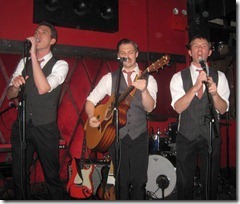 This was the first time that we saw them play together, as the Philth Harmonic. 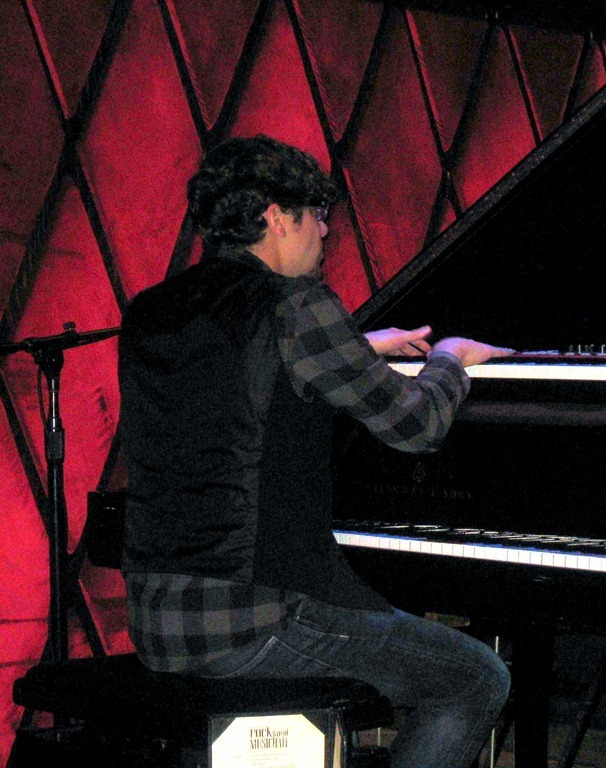 Unlike most Backscratch performers, they chose to do their cover as the middle number (there are no hard-and-fast rules). They drew The Vanity Belles. I am not familiar enough with the VB version to tell you how much Stephanie morphed it, but I can tell you that Stephanie was exceptional in performing her version. On one of the numbers, Robbie added a percussion loop and some looping of him clapping and playing guitar. It created a much bigger sound than the two of them would otherwise have. 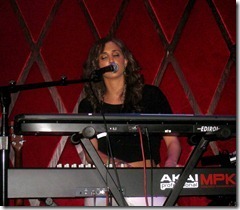 Morgan Karr was up next. I had never seen him before. 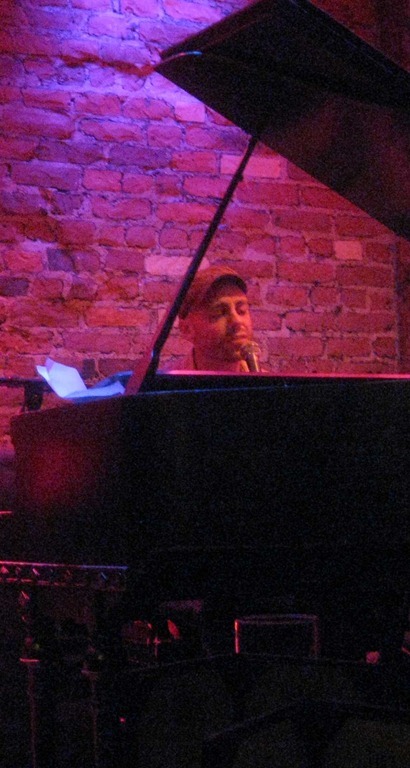 He kicked it off on the grand piano, playing beautifully, but really, showing off a great voice. For the next number, he came to center stage and just sang (he had accompaniment) without playing any instrument. Again, his voice really shone and I really liked his songs as well. For his backscratch, he sang accompanied by only an upright bass. He drew Jay Stolar. 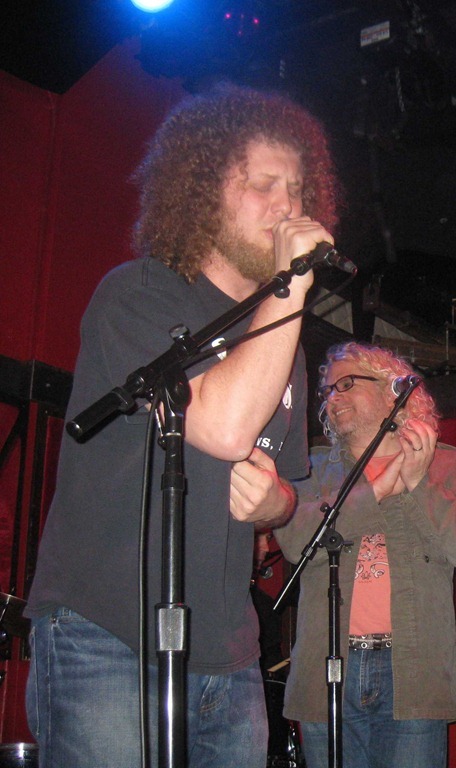 Again, I wasn’t familiar with Jay’s song, but Morgan nailed his rendition of it, hitting some high notes spectacularly. 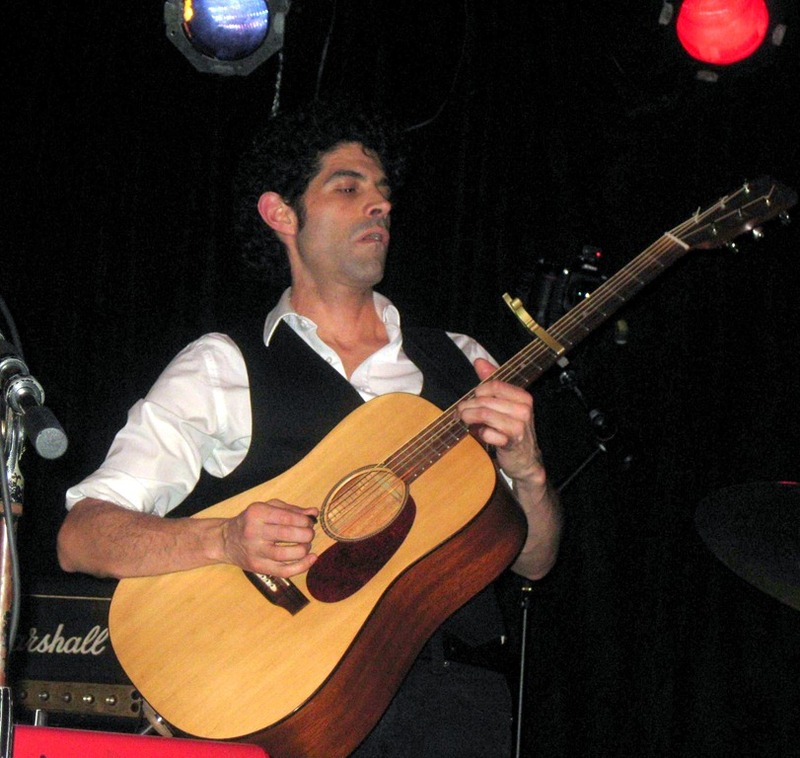 Justin Goldner on acoustic guitar. 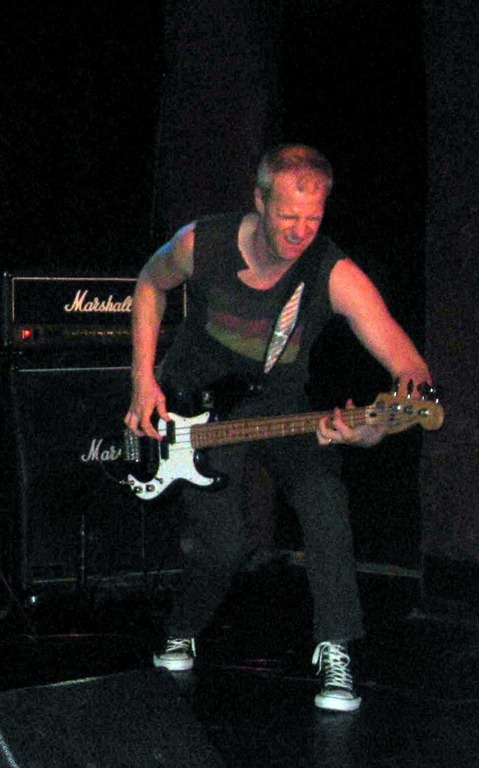 I’ve seen Justin a number of times, mostly playing bass for Bri Arden and Sam’s benefits. I also saw him play acoustic guitar for a very intimate performance of Bri’s. He blows me away on the bass, but hadn’t on the acoustic guitar that one time. 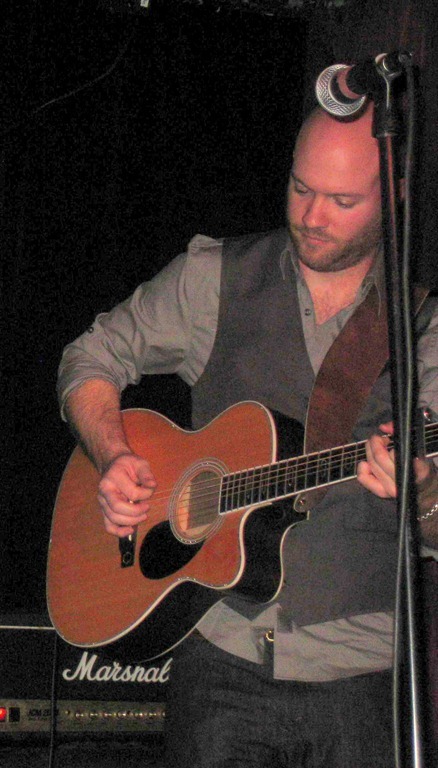 Last night, supporting Morgan, he showed a lot more skill on the acoustic guitar. 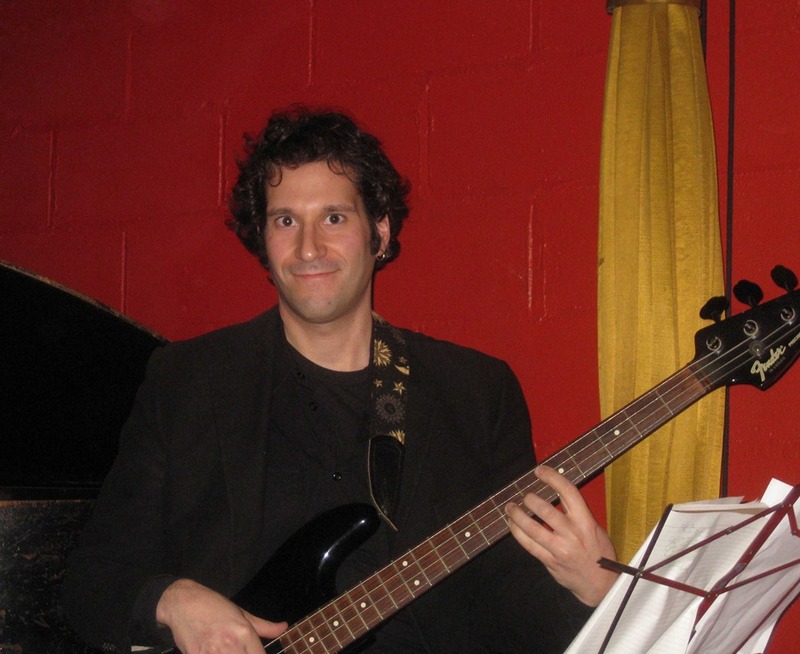 Lorenzo Wolff on upright bass. Very good on the first two numbers. On the backscratch, he was the sole accompaniment (Justin sat that one out and Morgan sang). Hearing just a bass with a great vocalist really highlights how good (or not) the bass player is. Lorenzo is really good! Abby Ahmad was up next. Another first for me. 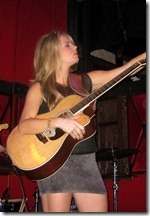 Great voice, very interesting guitar play. I really liked her songs as well. In other words, someone I intend to go see doing a full set soon (she’s playing Rockwood on Thursday at 11pm, but that might be too late for me that night). For her backscratch, she drew Morgan Karr. Another winner (both the song and her rendition). 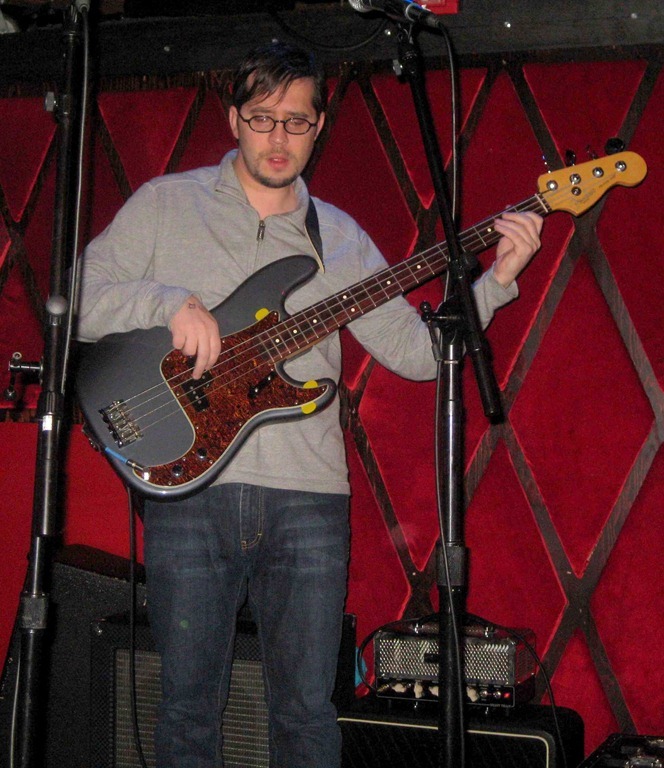 Adam Minkoff on electric bass and floor tom. 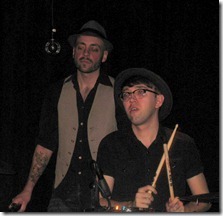 On Abby’s first number, Adam took the floor tom from the drum kit and brought it up on stage. He and the drummer (up next) played together, mostly on the rims first (in unison) and then separately, creating an extraordinary jungle rhythm for Abby to sing to. 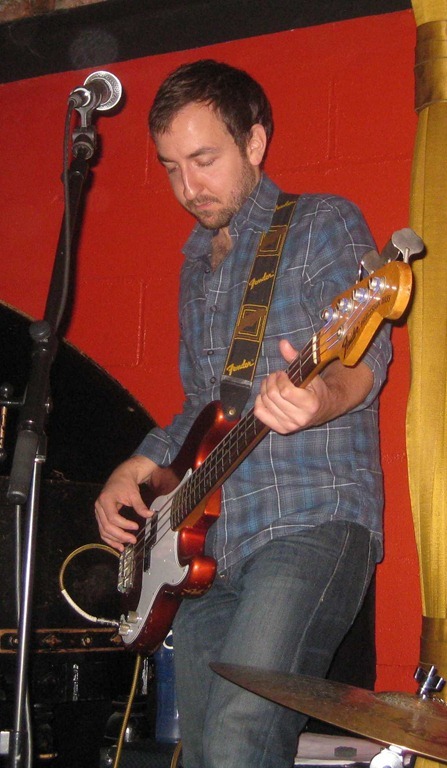 For the next two numbers, Adam switched to his more usual electric bass, and of course, was his usual excellent self. 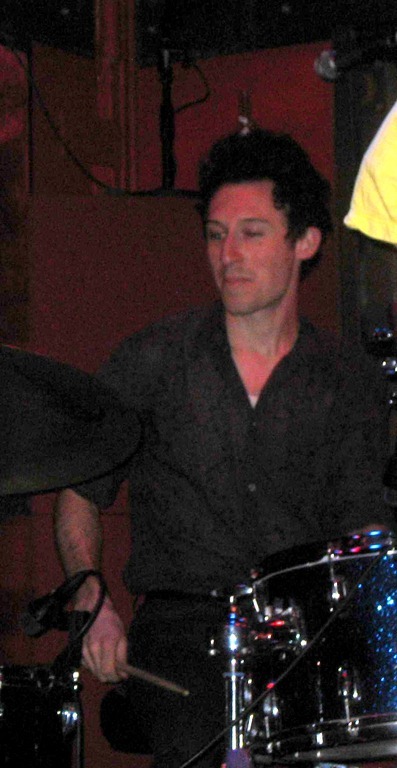 Sean Dixon on drums (again, no good link for him). This was my second time seeing Sean, and again he was excellent. In addition to playing the drum kit (minus the floor tom which Adam swiped, he also played the djembe on one number, beautifully. In fact, he put the djembe where the floor tom would have been. Not sure where else he could have placed it otherwise. Jay Stolar was up next. 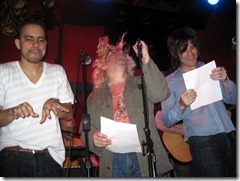 We’ve never seen Jay do his own stuff, but have seen him sing a song here and there (as a guest, and at a benefit concert). 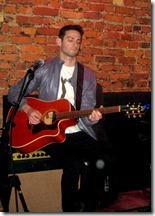 He has a superb voice which was in full effect last night and played the acoustic guitar. I really enjoyed his two songs. He drew Derek James for his backscratch. 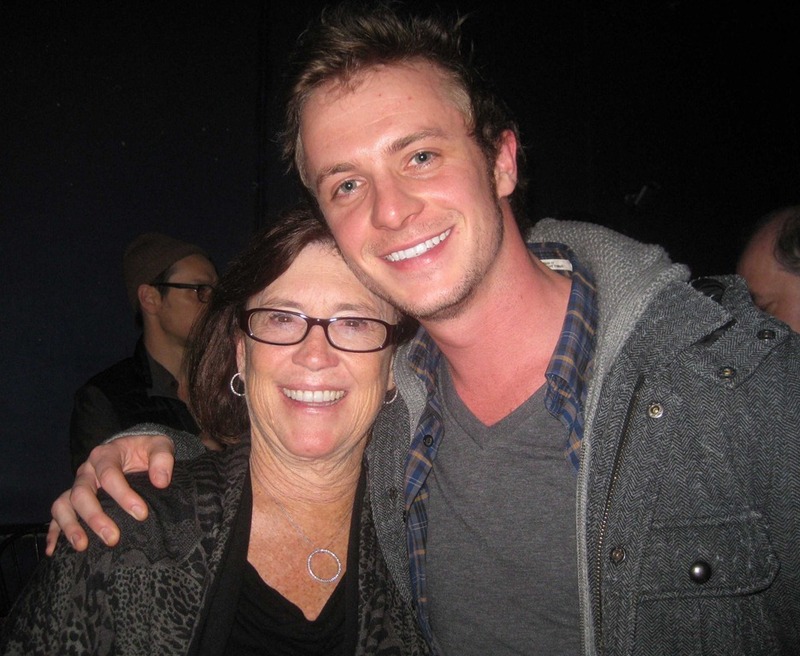 He chose Mama Said (it helps that I’m Derek James’ biggest fan, self-declared, so that I at least know which song Jay was covering). He played it so much slower than Derek does, but it totally worked. I’ll still take Derek’s version, but huge Kudos to Jay for creative arrangement and execution! 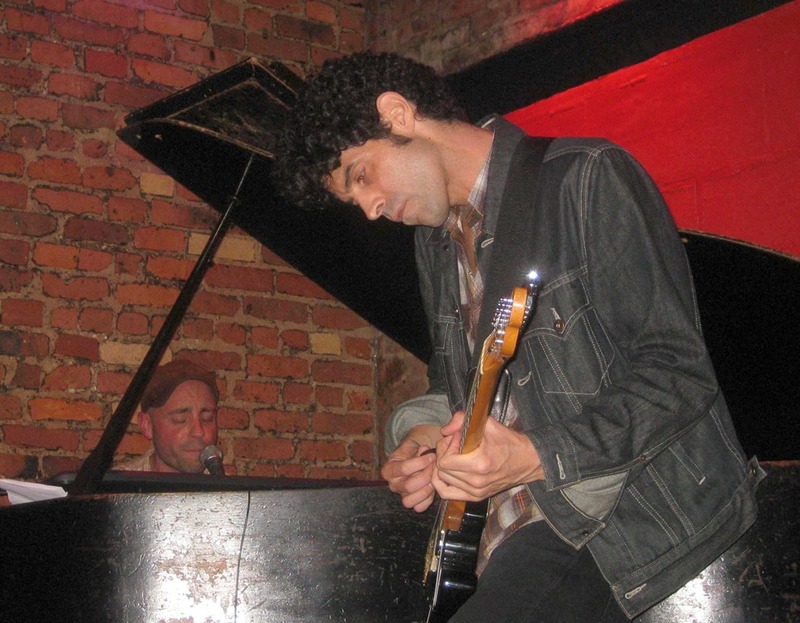 Jason Wexler accompanied Jay Stolar on his two numbers, sitting out the backscratch. 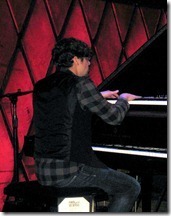 Jason was superb on the grand piano. It started off in a funny manner. 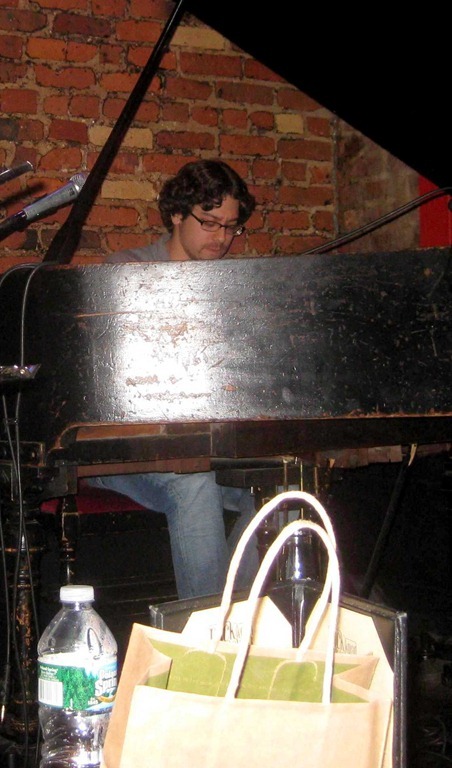 Jay began by picking on one or two notes, repeatedly, in a slow rhythmic manner, alone, no singing and no piano accompaniment. After a minute, Jay turned to Jason and said “Feel free to join in any time!”. Jason laughed and immediately launched into a fantastic series of piano leads. Satisfied, Jay started singing. Derek James was up next. 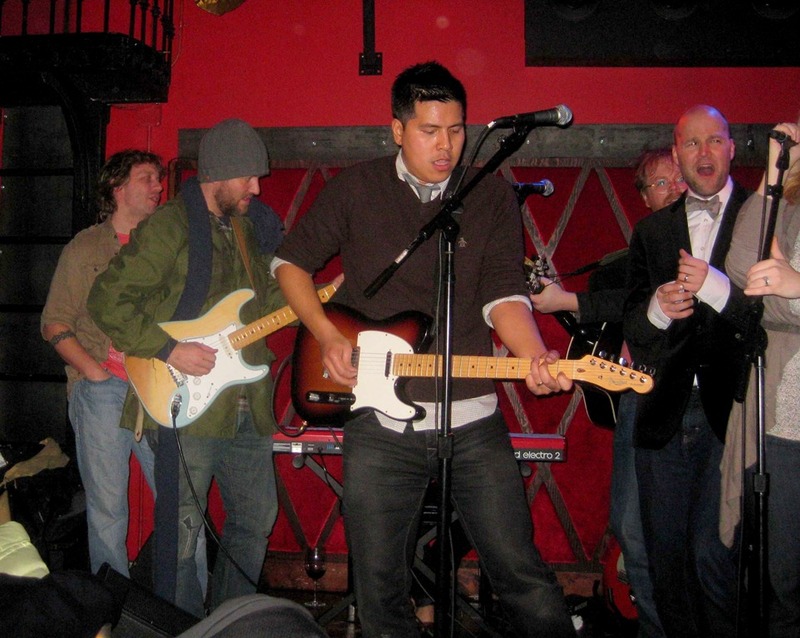 This was the first time I’ve seen Derek solo. I loved both of his numbers, which he dedicated to Terry. He kicked it off with What’s That Sound from his first CD, Stray. In a small-world story, I didn’t have that CD (though I’ve seen Derek perform the song a number of times), but Lois had secretly arranged with Derek in advance to purchase the CD last night, so I have it now! I was totally satisfied with Derek’s solo performance, but I admit that with the full band, there’s a swagger that was missing last night. Derek drew Stephanie and the Philth Harmonic for his backscratch and did a beautiful job. Another example of me not knowing the original, so I can’t compare the versions. The final act to close down the NYC-based backscratches (unless I have my way with Martin!) were The Vanity Belles. I’ve mentioned how much I love them a number of times, even though the first time I’ve ever seen them perform live, as themselves, was just this past Wednesday at a benefit show. They were stripped down last night, the two Belles, Carrie Welling and Jessi Rae Waltz, accompanied by the amazing Oscar Bautista on acoustic guitar (they typically have a full band). They opened with a brand new song that so blew me away I can’t find the words to describe it. 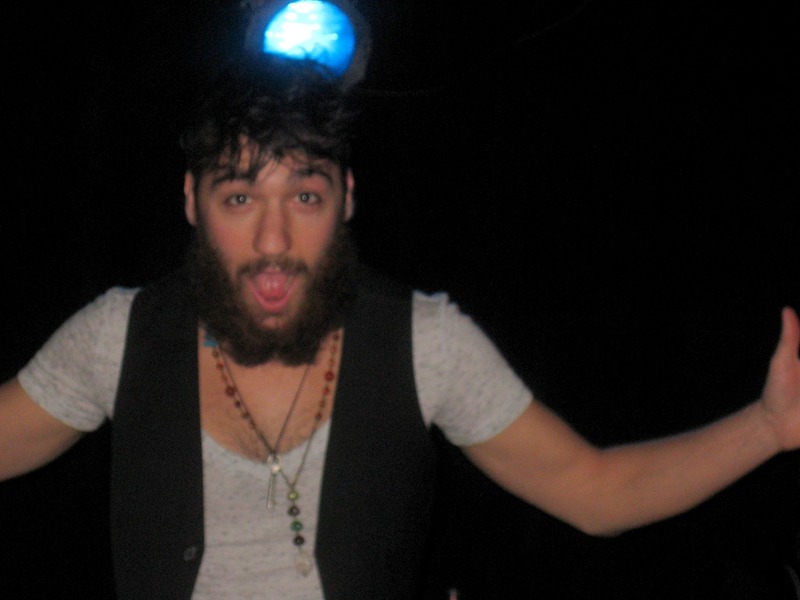 I happened to be standing next to their manager, Patryk Larney, and I couldn’t contain myself after the song. I turned to him and said: “Holy cow, that was absolutely extraordinary!”. He said that he agreed, and they just finished it and rushed to get it on the new CD (of which I am a very proud Kickstarter contributor). I can’t tell you how happy it makes me to know that I will soon own this song. Their next song had Jessi move to the grand piano. It too was absolutely breathtaking. They finished with their backscratch, drawing Abby Ahmad. Another mind-blowing performance, and I really loved the song too (credit for that to Abby, obviously, though I have no idea how her original version sounds). Folks, if The Vanity Belles don’t make it, the world is very broken. They closed the show by awarding Martin Rivas with an actual backscratcher, dated and signed by everyone who appeared last night. A very nice gesture indeed! 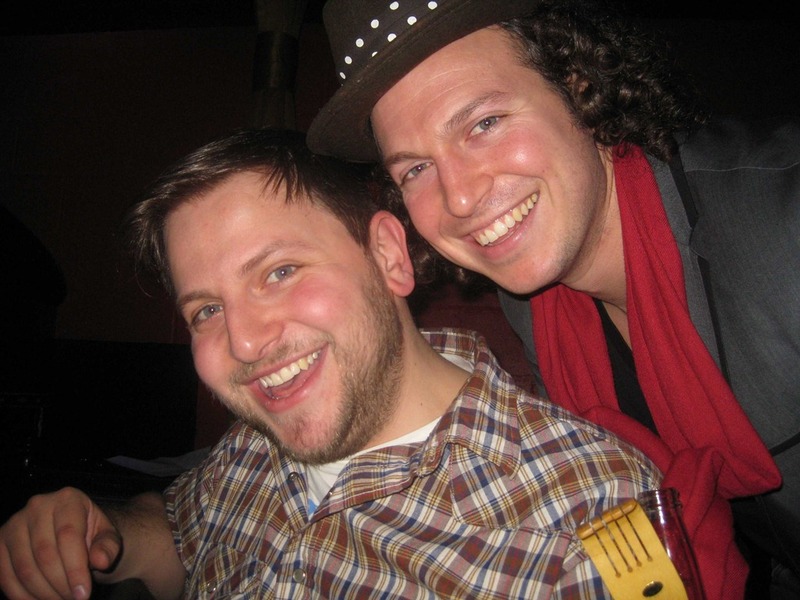 Here a pic of Alex Berger, currently the only Backscratch Master, with Jay Stolar. Alex has a show in 3 hours at Rockwood Music Hall Stage 2, so hurry up and get over there! 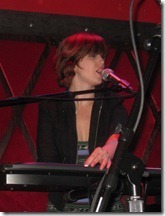 Last week I scanned the Rockwood Music Hall website for this week’s shows. 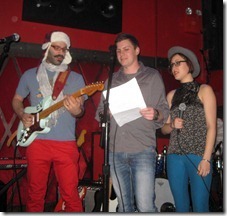 There was a show listed for last night simply labeled: “A Holiday Benefit”. The performers were a mixture of our favorite who’s who, plus a couple of groups we have wanted to see for a while, but scheduling has gotten in the way. I snagged two tickets and excitedly waited for the week to pass. 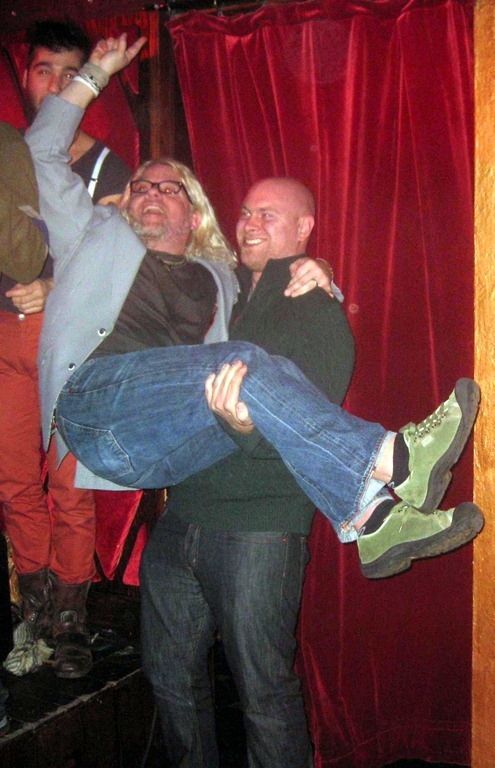 It turns out that this was the fifth (and unfortunately last) installment of this particular annual Holiday Benefit. It is organized by Benjamin Wagner (with some others who helped co-found it). The money raised is for 826NYC. Great cause, great people involved in raising the money and great musicians all around. Bottom line: my expectations were very high. I was blown away beyond those expectations on two levels: most of the people we know brought their A+ games and we discovered some people that became instant favorites! There were 16 acts (individuals and groups), some accompanied by a house band. Each act performed two numbers. 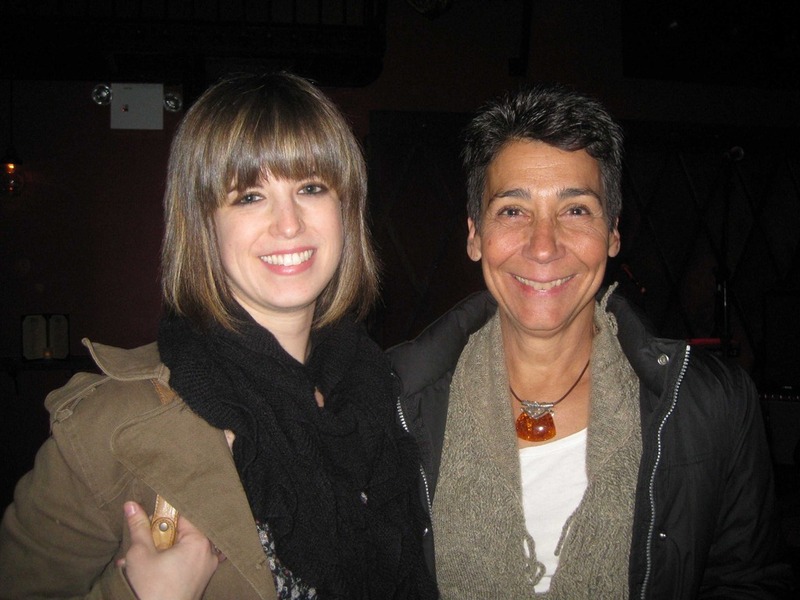 The entire atmosphere at Rockwood was that of a party filled with loved ones. 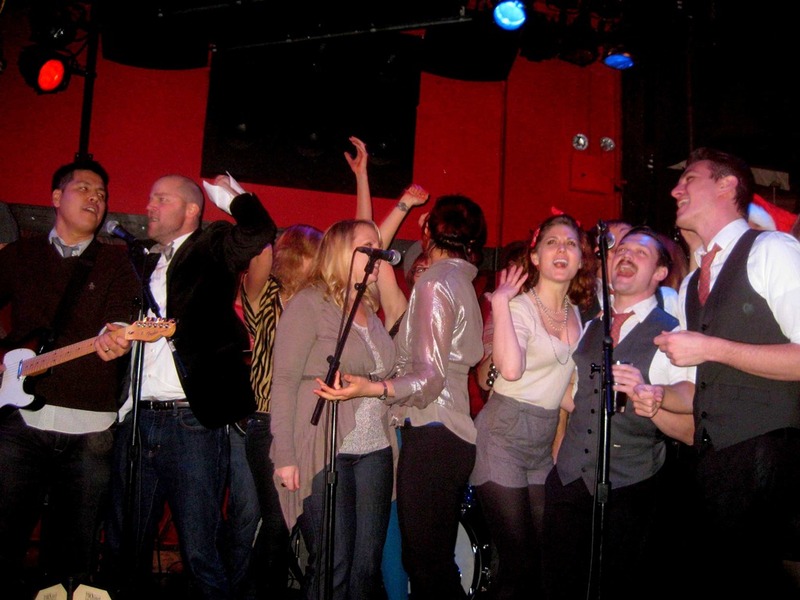 In fact, some of the musicians noted (on Twitter, and probably elsewhere) that it was more like an Office Party for them, given how many musicians were performing and in the audience. We were thrilled to participate in said party. 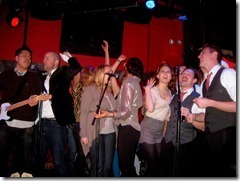 In addition to the ticket price going to the charity, this was also an official CD Release Party. Physical CDs were on sale for $10. 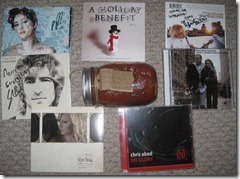 $20 got you the physical CD of A Holiday Benefit #5 plus downloads of the previous four albums. Of course we did that. 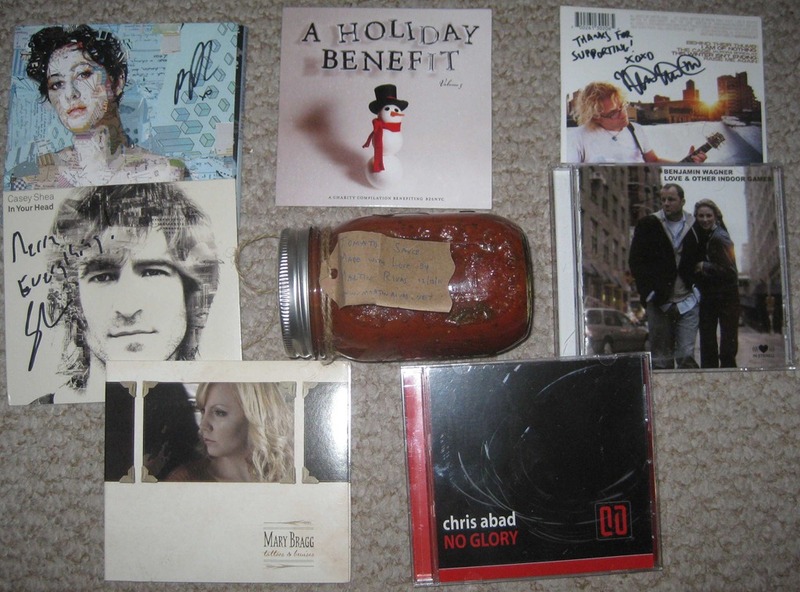 We kicked in more money later to purchase CDs by some of the performers, signed, with the proceeds going to 826NYC as well. 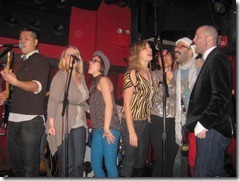 At the end, the encore involved inviting all of the performers back on stage together to sing one last song. It was hard to count accurately, as people kept jumping on stage (even some who didn’t perform earlier), but I’m 99% sure that at one point there were at least 26 people on stage at the same time. If that’s correct, that’s a new record for a show I’ve attended (sorry Sam Teichman, you have your work cut out for you now!). There’s no way to review a show like this without spending an entire day writing (something I don’t have the time to do today, nor the inclination). In fact, it’s sort of beside the point. What I’ll do instead is similar to what I did for the Haiti Benefit nearly two years ago. I’ll list the acts in the order they appeared, and mention who supported them. When first mentioning a support person, I might say a few extra words. 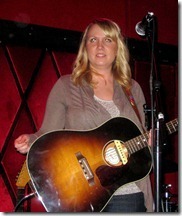 Mary Bragg (#1). Mary was new to us. Great voice. 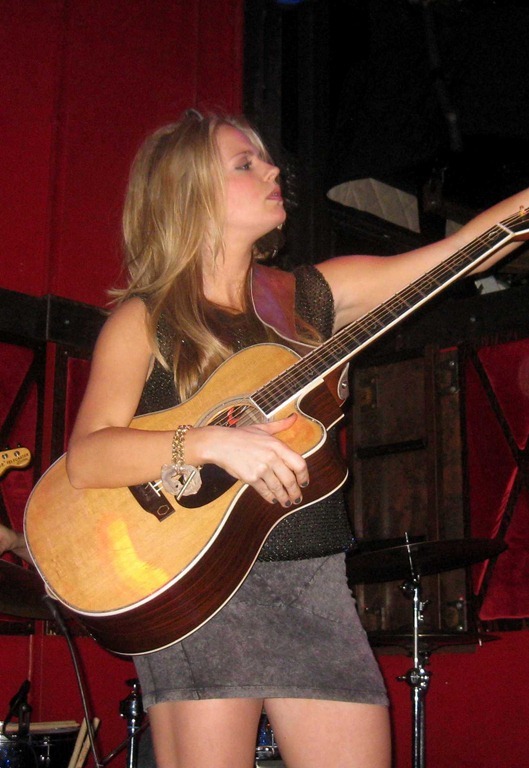 On her second number she also played acoustic guitar. She was accompanied by two very talented people, who I think played only with her. I’ll list them next. Mike Cassedy on electronic keyboards. Excellent. Mary gave him a couple of leads and he was great. 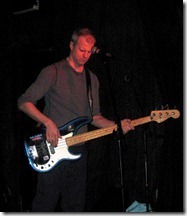 Jimmy Sullivan on electric bass (no good individual link). He too was excellent. He made the electric bass sound exactly like a very jazzy upright on one of the numbers. He was smooth. 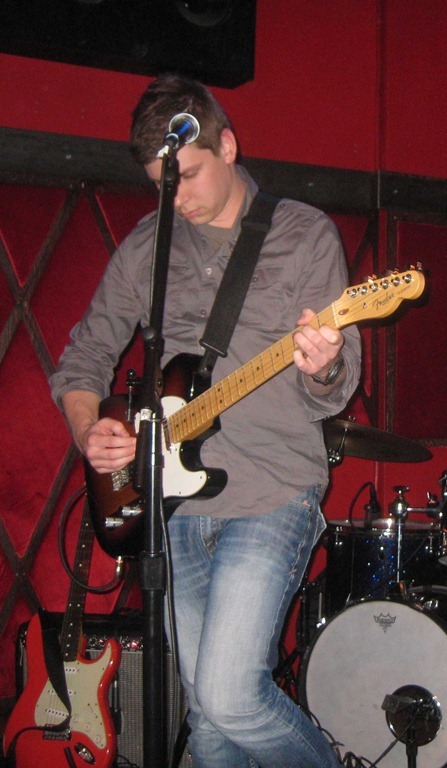 Casey Shea (#2) on electric guitar and vocals. Casey was wonderful. In addition to singing and playing well, he was very funny. He had two female backup singers, each of which was a lead performer later in the show, so I’ll save their names for their proper spots. Casey brought up Sean White to read a poem to end one of his songs. It continued the comic nature of an otherwise horrifyingly sad song (my house burned down on Christmas). Paula Valstein (#3). 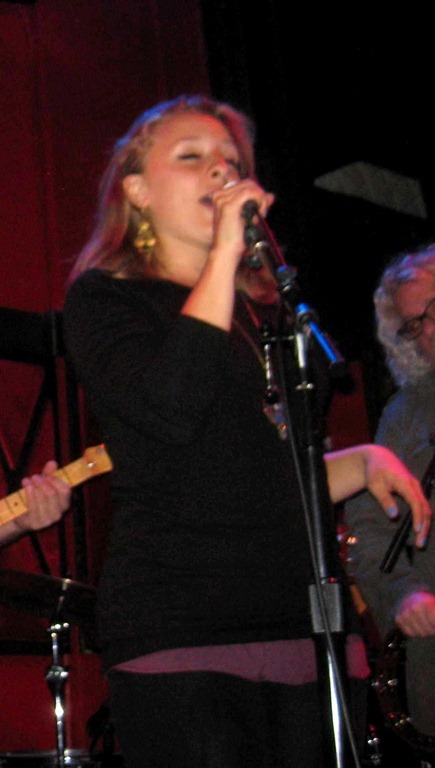 We’ve seen Paula once before, at the Haiti Benefit. 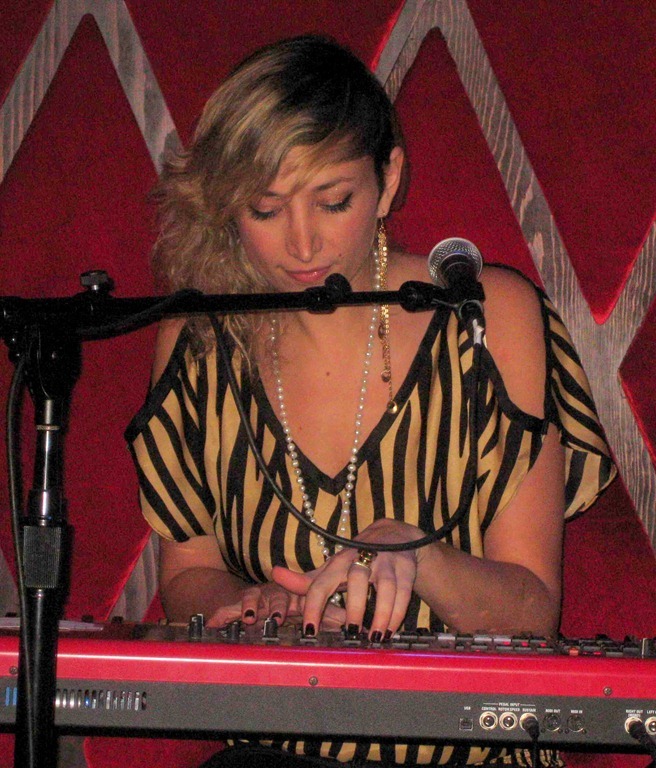 She played solo at the electronic keyboards. Great voice, excellent piano play. Definitely someone we need to check out more (one of our friends has been telling that to me for a while). Paula was also one of Casey Shea’s backup singers. Astoria Boulevard (#4). Wow! I can’t believe I never heard them (or of them) before. 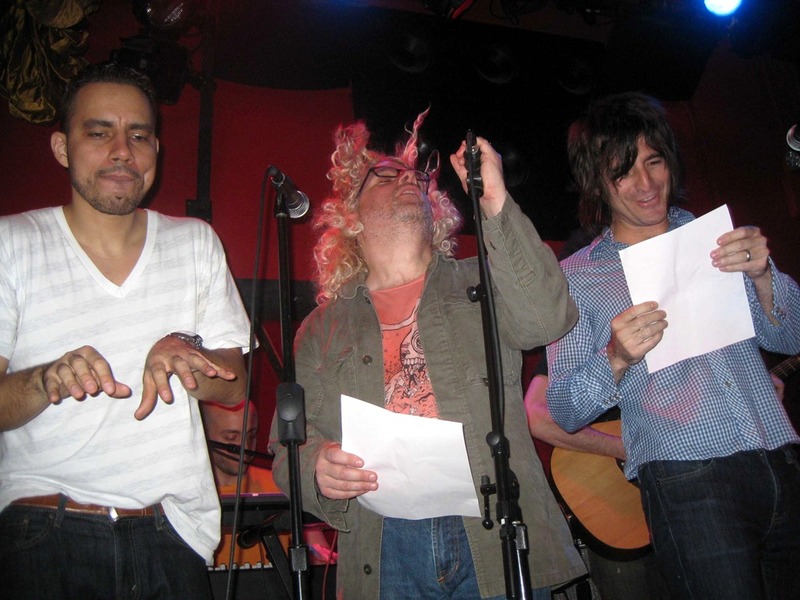 Three guys who sing heavenly three-part harmony. They’re funny and natural on stage as well. 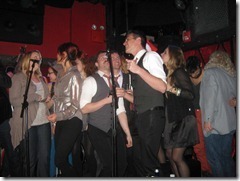 They opened the first number a cappella and knocked me back a few steps with how awesome they were. Guitar, ukulele, harmonica and kazoos were played too. 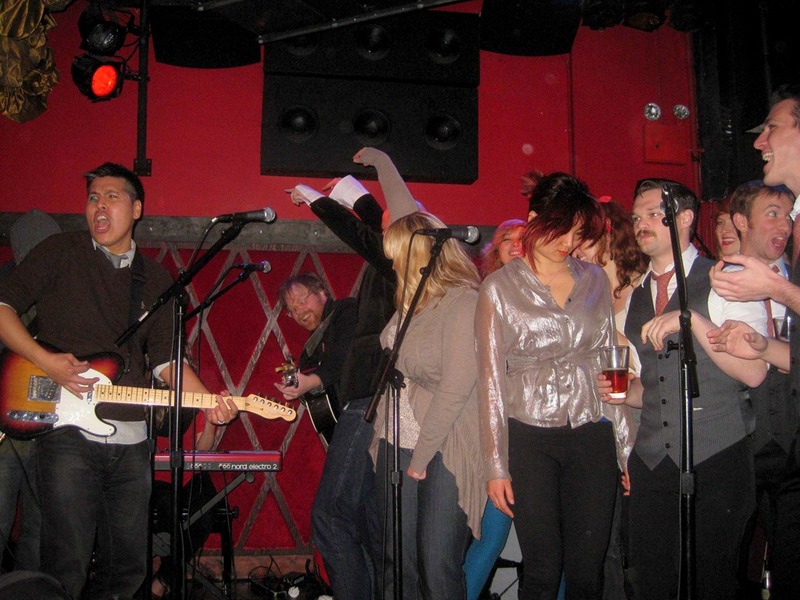 They were supported by the default house band (the next two people listed). 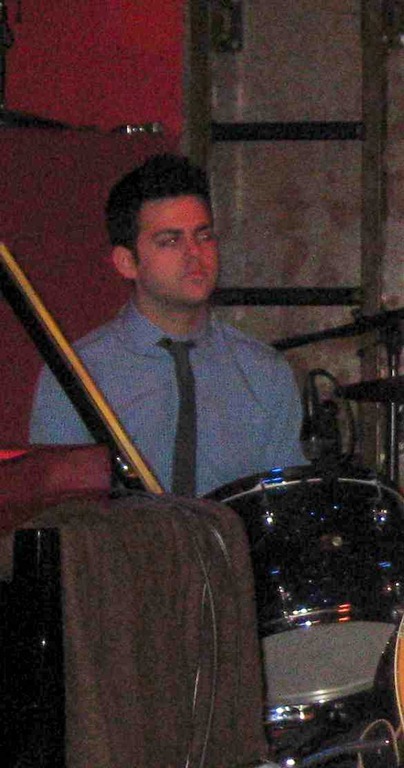 Ryan Vaughn on drums. Ryan was fantastic playing with roughly half of the acts last night. 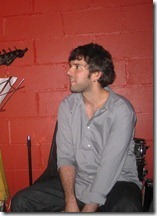 Ryan also joined for Mary Bragg’s second number, so I should have listed him earlier. 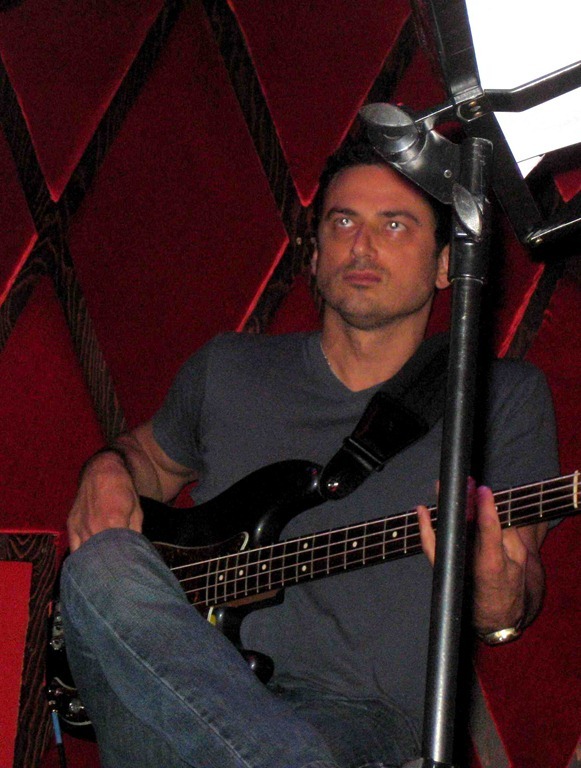 Tony Maceli on electric bass. Tony was his usual excellent self whenever he was on stage, which was a bit less than Ryan, but still the primary bass player for the evening. Dave Pittenger (#5). We’ve never seen him, but I’ve heard of him many times. 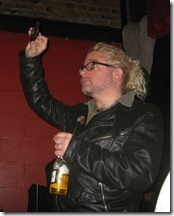 Mostly because he’s producing Live Society’s new CD (or at least I think it’s him). Dave invited two special guests up, Bess Rogers and Chris Kuffner to kick off his first number. Dave and Bess flubbed Baby It’s Cold Outside a bit, but turned it into a very good natured thing. 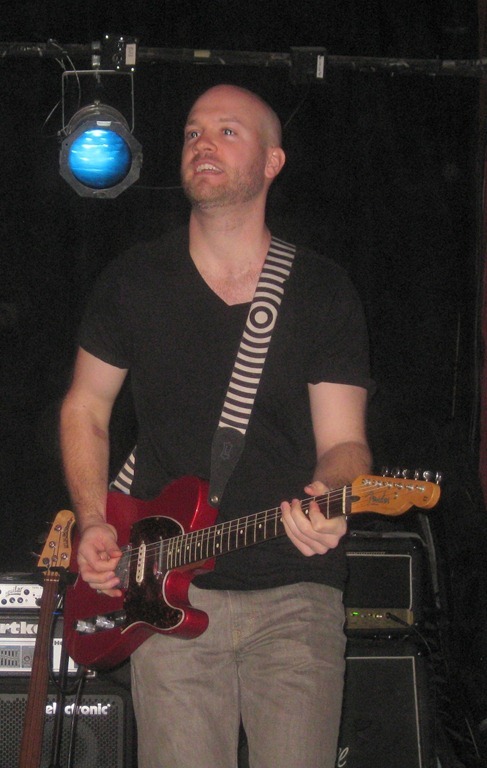 Chris played the electric guitar in an understated but fascinating manner. When they had to restart, he signaled to Ryan and Tony to join in, filling out the sound. 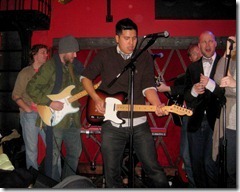 Dave then performed a second number accompanying himself on the electric guitar (with Ryan and Tony playing). Misty Boyce (#6). Misty kicked off her numbers on the guitar (I didn’t know she played the guitar), with the second number on the keyboards. Her voice is fantastic. 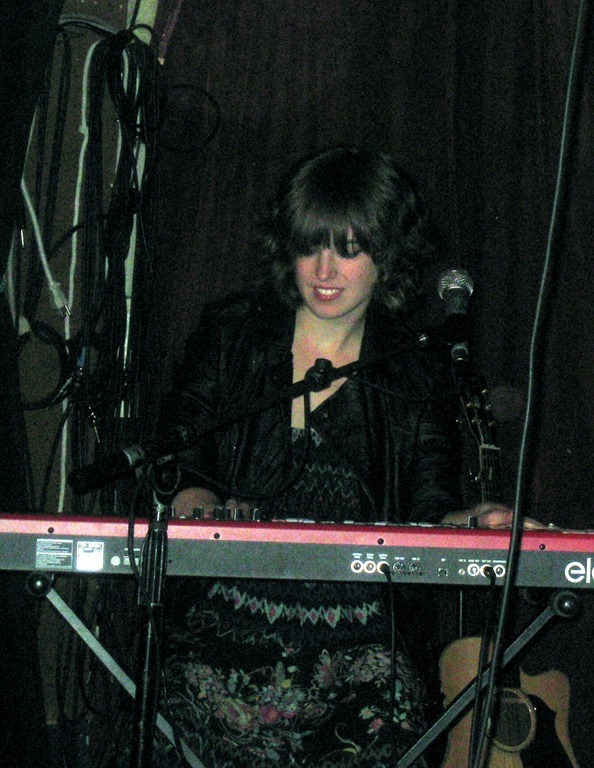 In addition to playing the keyboards really well accompanying herself, she also played them with a couple of other acts, super tasty every time. I’ve been wanting to see her perform her own set for a while and this only increased that desire. 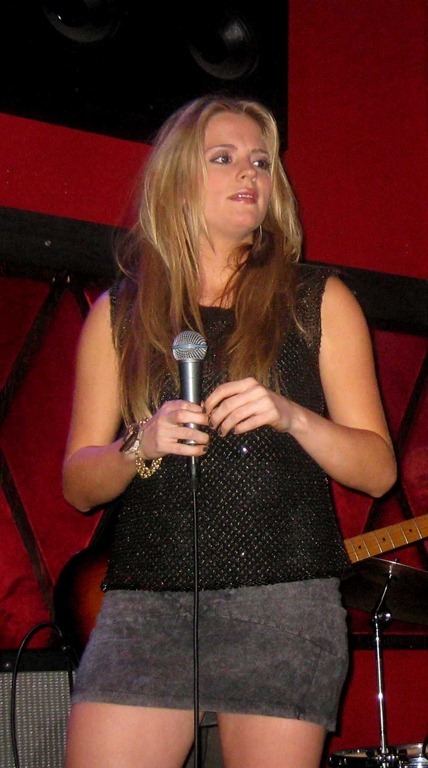 She was the second backup singer supporting Casey Shea. Nick Africano (#7). We hadn’t seen Nick before. 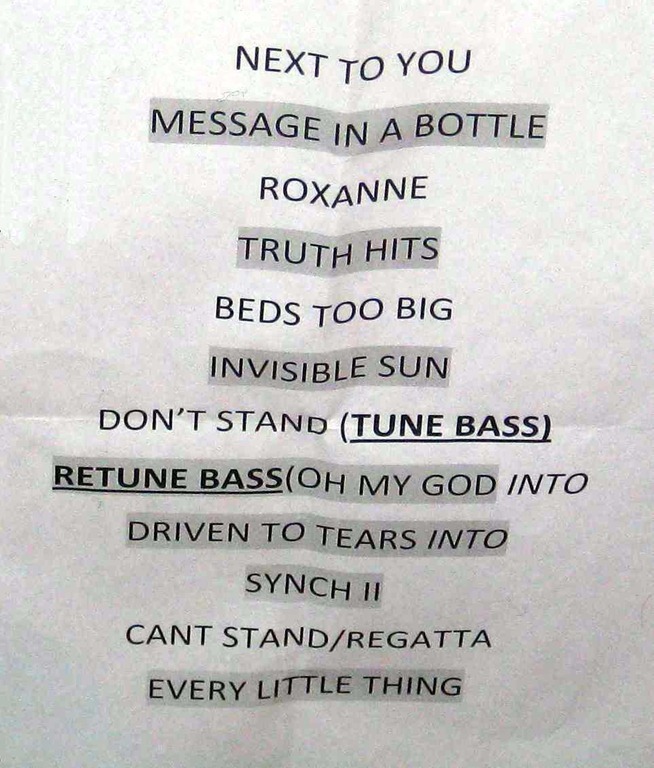 (That’s a total lie, Nick played with Misty during her first number, so we saw him before he took center stage!). He played the guitar beautifully (subtle slide leads). 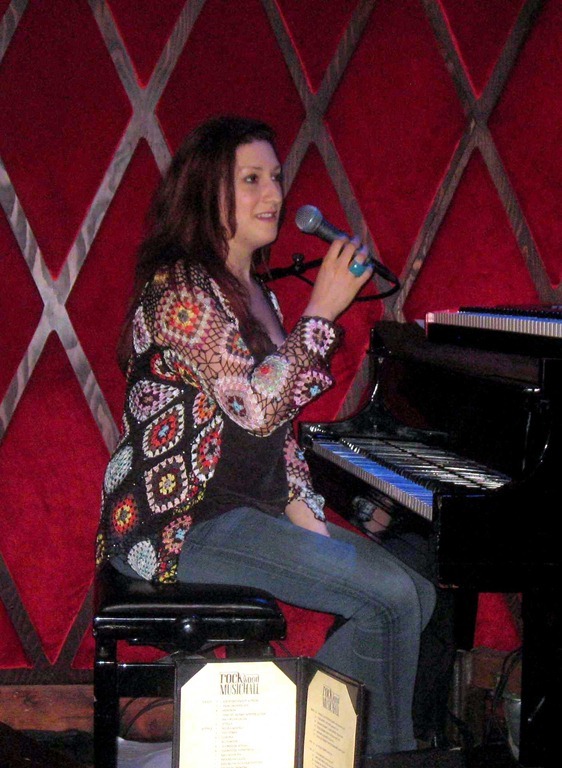 When he took over, Misty played the keyboards and she called up Bess Rogers, Paula Valstein and Charlene Kaye to sing backup. Very nicely done. We will be on the lookout for Nick in the future. 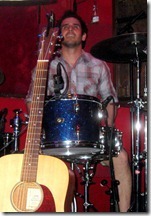 Greg Mayo Band (#8). 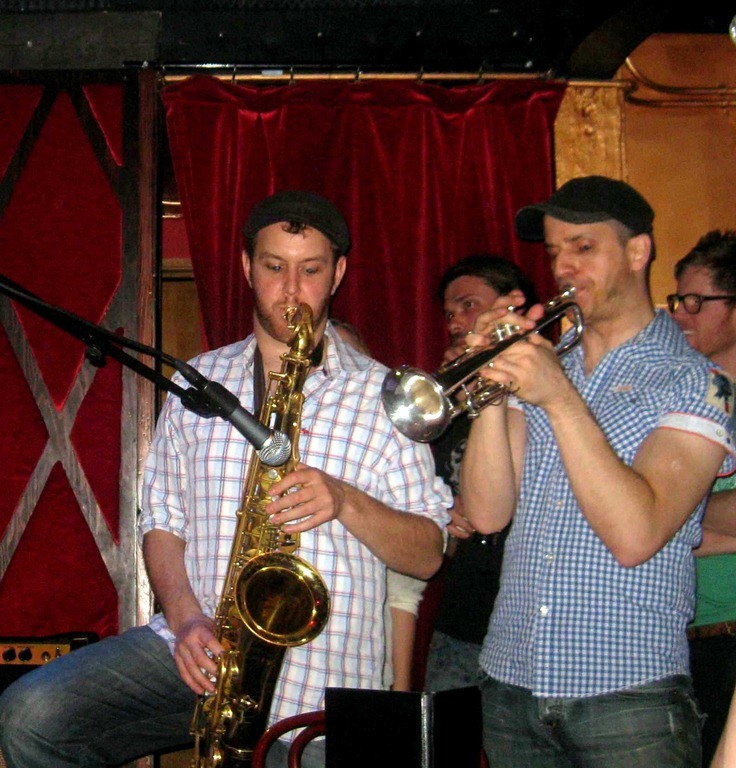 OK, it was technically the Greg Mayo Band, without the brass section. They also weren’t wearing suits, so I’m not sure how official this appearance was. That said, they were incredible, so I have no complaints! 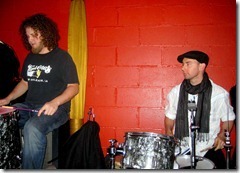 They had a guest vocalist and percussionist join them, but since each was a headliner as well, I’ll mention them later. 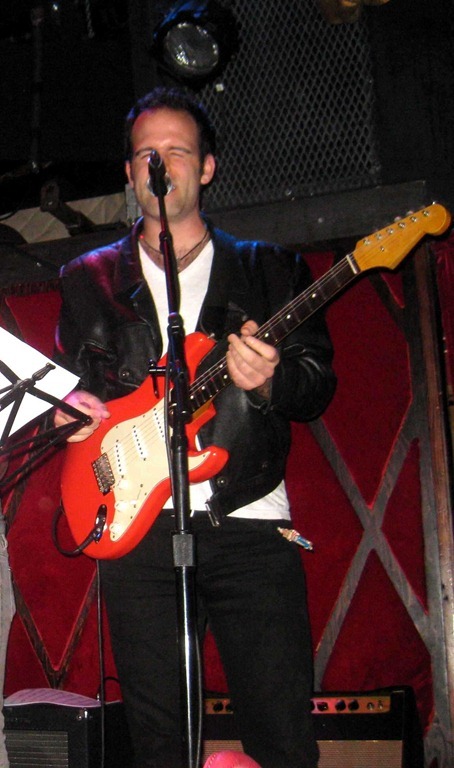 Paul Maddison on electric guitar and vocals. Wonderful. 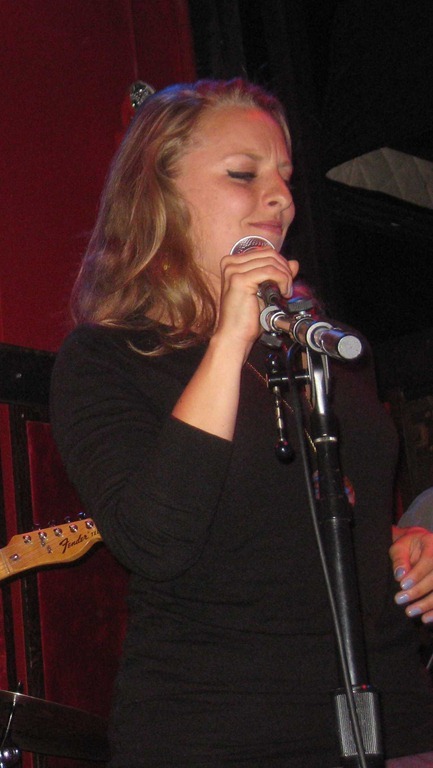 Rebecca Haviland on vocals. Spectacular. 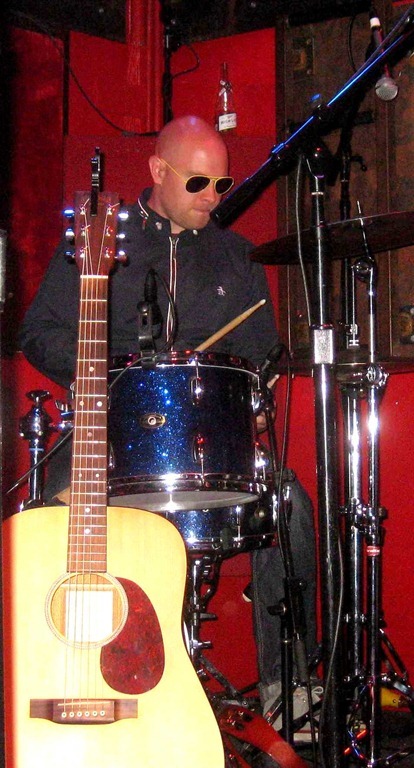 Kenny Shaw on drums. Excellent. Chris Anderson on electric bass and vocals. Superb. The Vanity Belles (#9). We’ve seen them sing backup with other groups. We’ve seen them perform on TV twice. 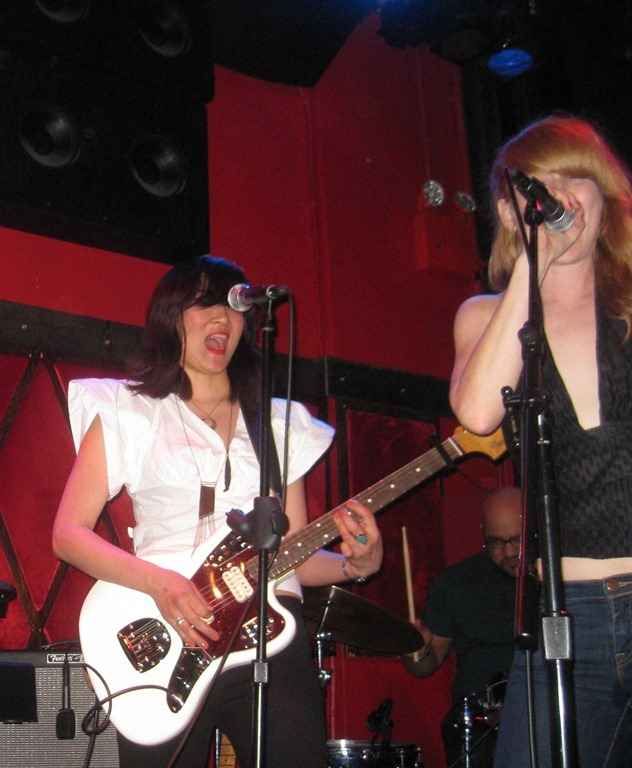 Unbelievably, this was the first time we saw them perform as The Vanity Belles, live. We’re proud supporters of the ladies through their recent (successful) Kickstarter, so this was one of the extra special reasons why I wanted to attend. Of course, they were fantastic. Whew! Patrick Firth played electronic keyboards for them. 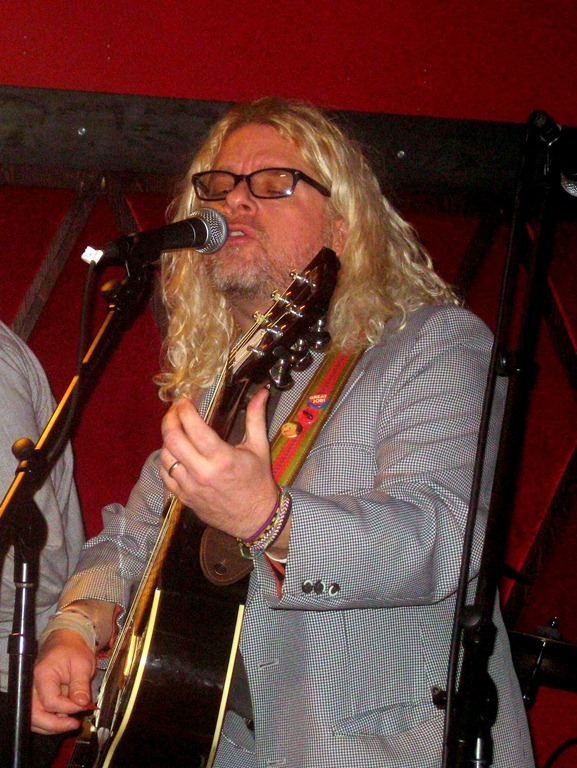 Joining him to round out the band were: Greg Mayo on guitar and Chris Anderson on electric bass. The drummer was already on stage before with the Greg Mayo band (as the guest percussionist) but I still haven’t mentioned his name (soon, don’t panic!). 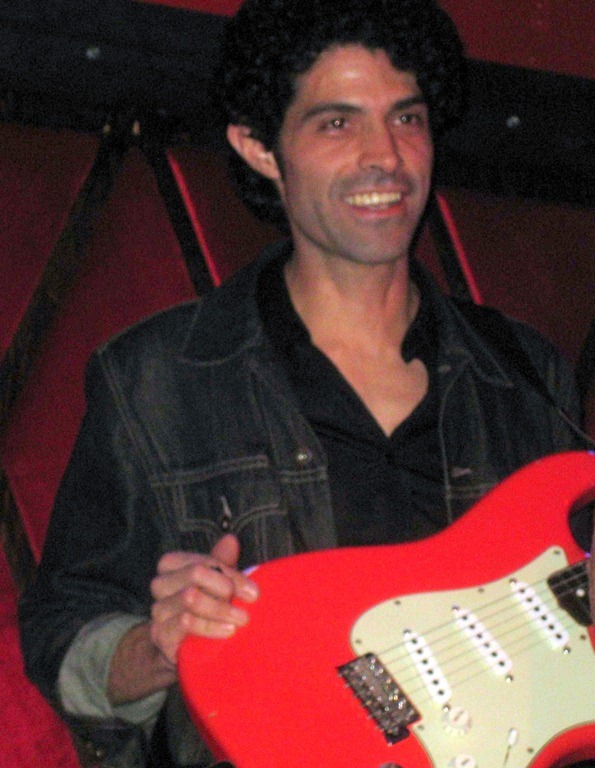 Oscar Bautista played electric guitar as part of The Vanity Belles band. He is always great, so I wanted him to have a paragraph for himself. Another reason to give Oscar his own section? 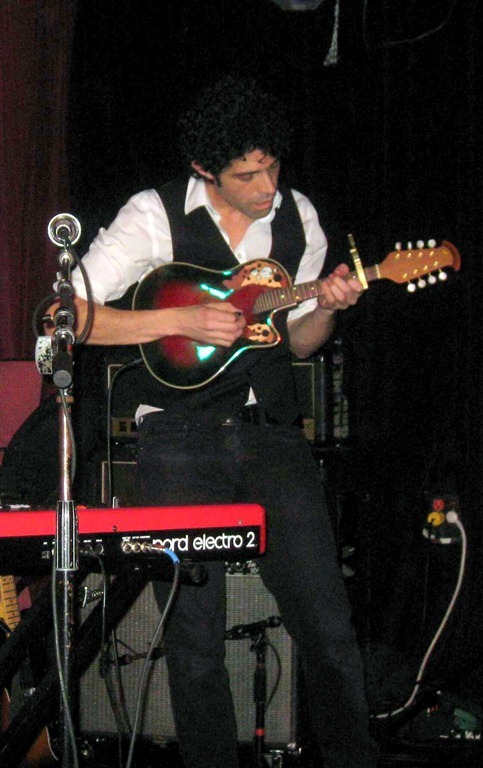 He broke out the mandolin last night, one of my favorite instruments. Sweet! Next up was another group I’ve wanted to see for a long time. The Stone Lonesome (#10). 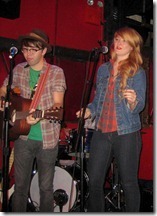 This is duo of Zach Jones (finally got to mention him) and Emily Long. 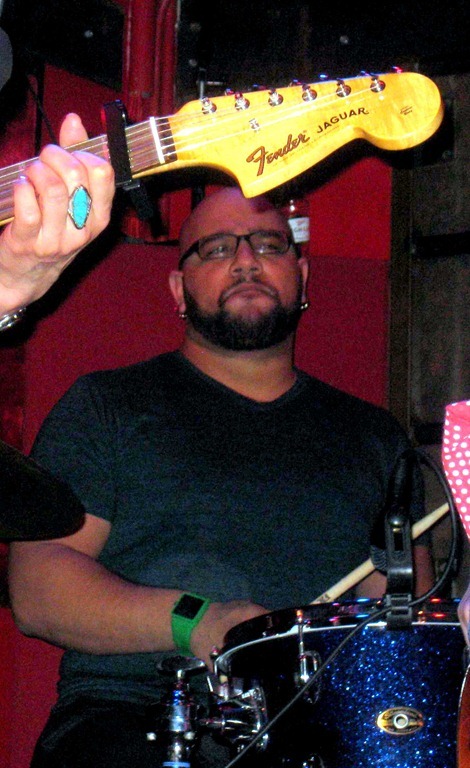 We’ve seen Zach drum many times (including earlier last night, and he was the guest percussionist with the Greg Mayo Band as well). He’s an awesome drummer. 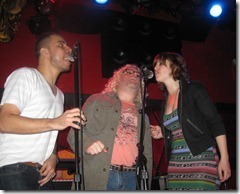 I also knew that he sings well, and that was proven when he was front-and-center with Emily last night. What I didn’t know was that he also plays the guitar. 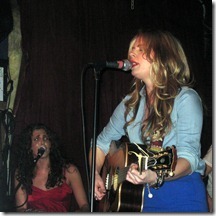 Emily sings really well too and the two of them sound great together. 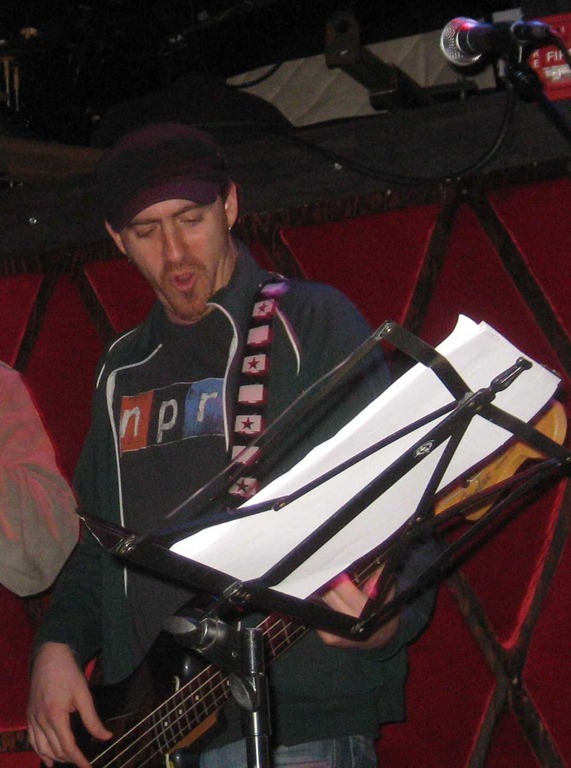 Brian Killeen supported them on electric bass, a perennial favorite of ours. He was joined by Ryan Vaughn on drums and Greg Mayo on electric guitar. Zach let Greg take a number of fantastic leads. The entire night was amazing, but I would have left happy just for the guitar solos that Greg took during The Stone Lonesome songs! Martin Rivas (#11). 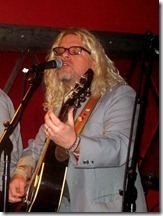 Martin had previously sung as a guest with the Greg Mayo Band, wonderfully. He now took center stage and wowed everyone with two of his own songs (one a Christmas number, the other off of his new CD, due out in May, 2012). He was supported (incredibly) by Patrick Firth, Greg Mayo, Chris Kuffner, Zach Jones and Brian Killeen. A few items were raffled off during the evening. 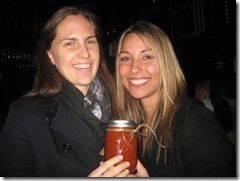 One of them was a jar of Martin Rivas’ world-famous spaghetti sauce (or is it more properly referred to as tomato sauce?!?). Anyway, we won it (see the proof here and again in a couple of the photos at the very bottom!). Can’t wait to savor it! Chrissi Poland (#12). 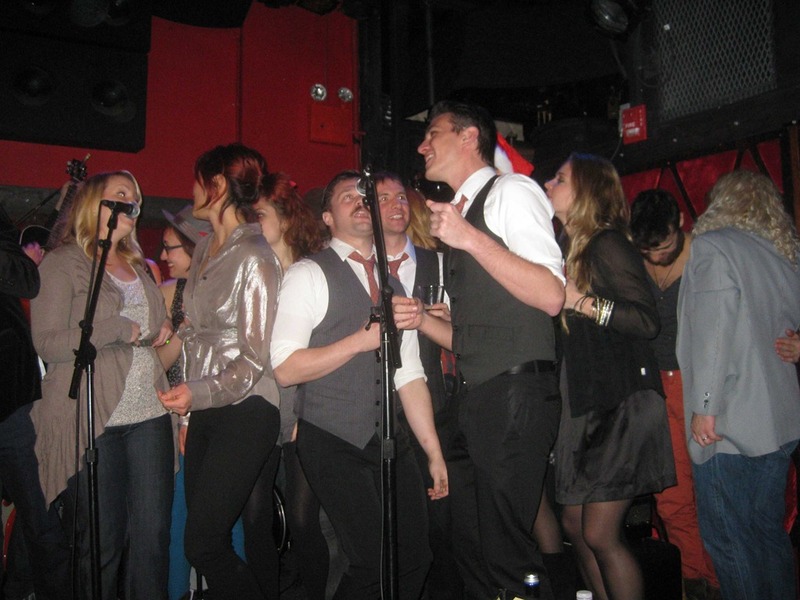 We’ve only seen Chrissi singing backup with others. We knew she had an extraordinary voice but I have to say that I still didn’t understand the full effect of it until last night. Another wow. 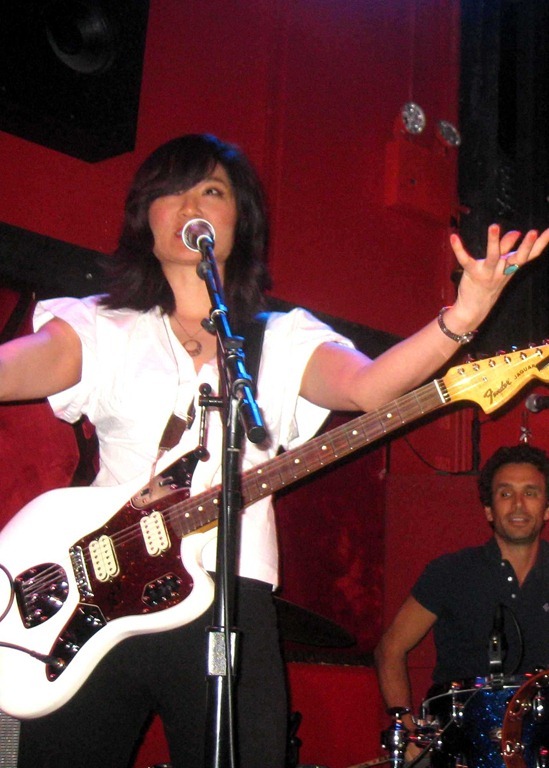 We won’t be attending, but if you want to catch her headlining a show, with Martin Rivas opening, head to Highline Ballroom this Sunday night (Dec 18th, 2011). You won’t be disappointed! 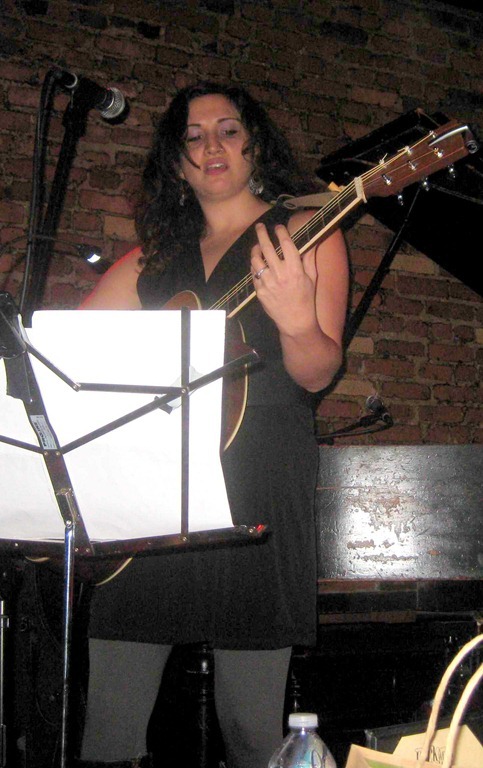 On her first number, she played guitar and was accompanied by Patrick Firth, Greg Mayo, Rebecca Haviland, Martin Rivas, Ryan Vaughn and Brian Killeen. She then put the guitar down and blew everyone away accompanied by the same band, minus the backup singers (Rebecca and Martin). Her voice and stage presence had us eating out of her hand. Caleb Hawley (#13). 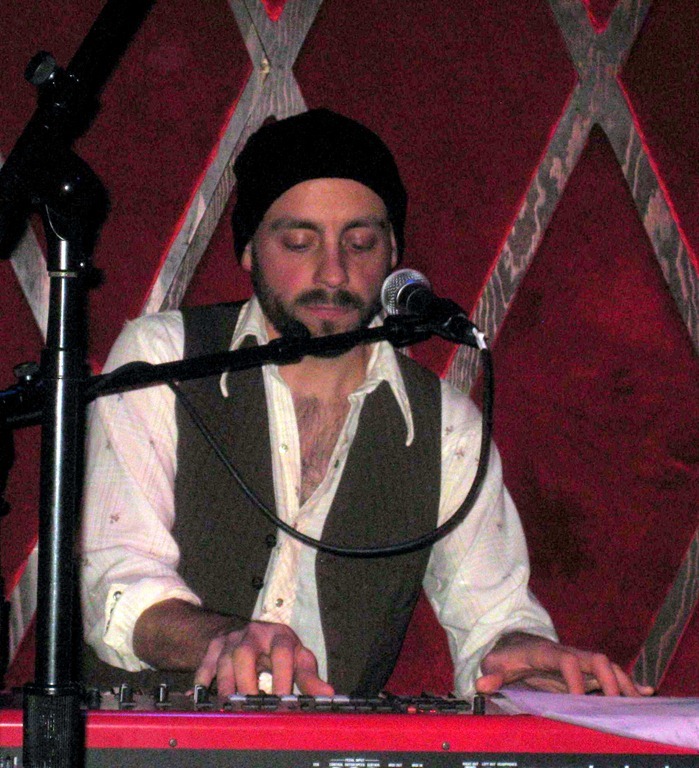 Caleb is one of my favorites and I’m always disappointed when I can’t make it to one of his shows (which happens more frequently than I care to admit, including the night before!). At least I got a taste last night to hold me over until his next full show. Caleb was supported by Patrick Firth, Ryan Vaughn, Zach Jones and Brian Killeen. There was dancing in the audience (not atypical of any Caleb performance), but I won’t post the pictures, since those people didn’t sign any waivers. Benjamin Wagner (#14). 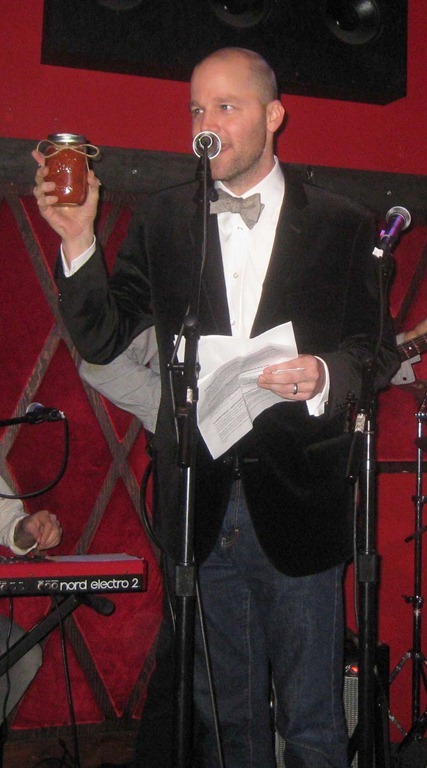 Benjamin was our host throughout the show, introducing each act as they were coming on stage. Now it was his turn to shine and shine he did. 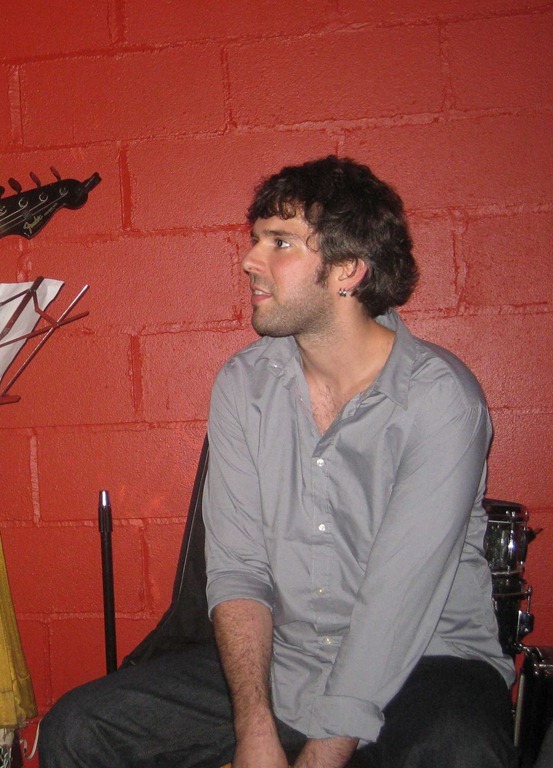 He has a wonderful voice and he wielded it for our delight. He was joined by a stellar band. 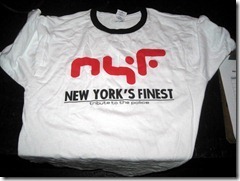 I’ll mention all but two of them, since they were the next two headliners and hadn’t yet made an appearance. 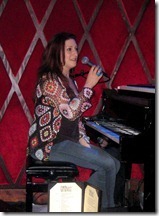 Misty Boyce on keyboards, Chrissi Poland singing backup, Ryan Vaughn and Tony Maceli. All, great! 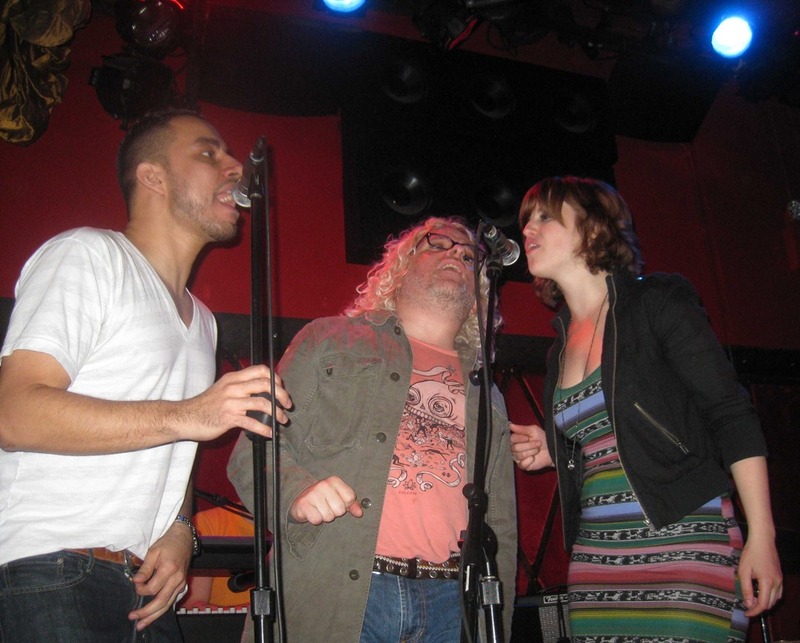 For his second number, additional backup singers joined: Mary Bragg, Bess Rogers, Paula Valstein and Martin Rivas. 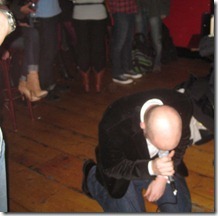 In true showman style, Benjamin left the stage and prostrated himself right in front of us! Bryan Dunn (#15). 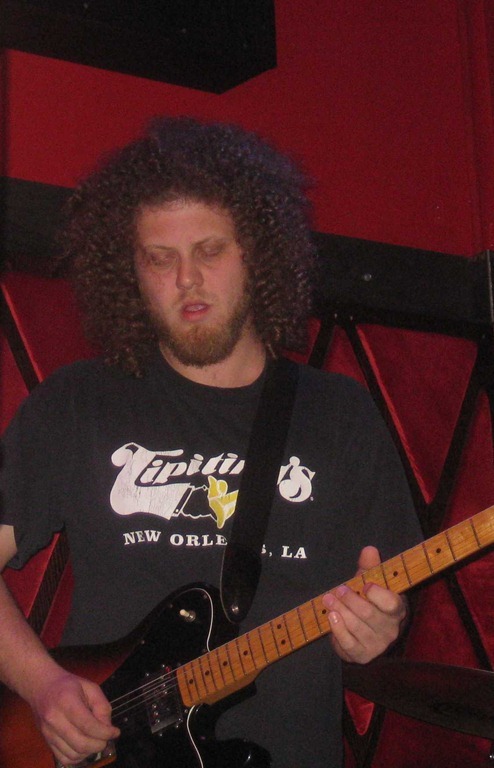 Bryan also played guitar on Benjamin’s set. Bryan is wonderful all around. When Benjamin introduced him, he said “Bryan is normally a rocker, but he’s going to bring you down a bit with his first number.” Ha! I hope no one fell for that. 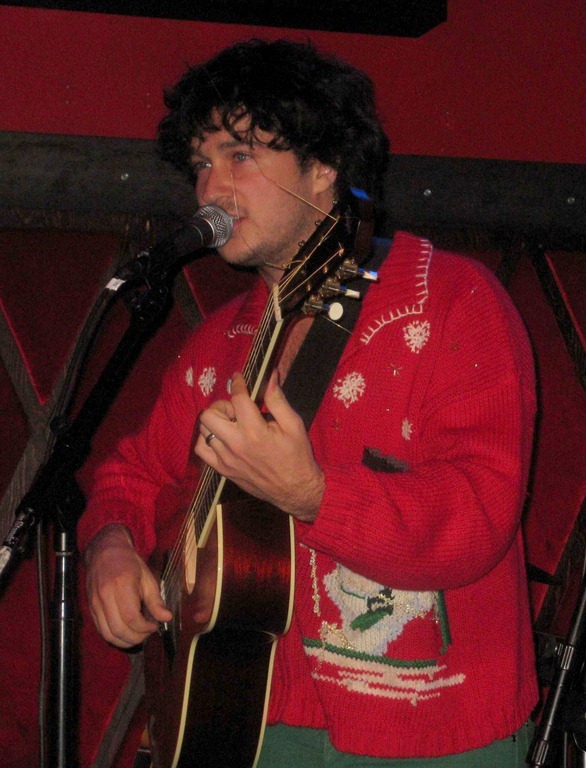 It might have started out sounding like a ballad, but Bryan had everyone hopping in no time. Both his numbers were fantastic (and no, I wasn’t the least bit surprised!). He was supported (wonderfully) by Misty Boyce, Ryan Vaughn and Tony Maceli. He also had another guitar player and vocalist, but since he was the next headliner, I’ll save his name for the very next line. Chris Abad (#16). Another wow for me. 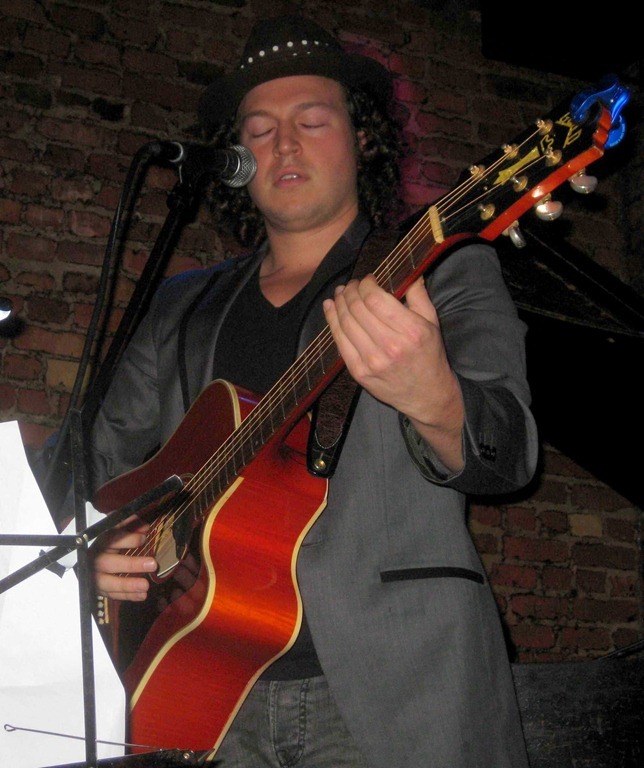 He played guitar for Benjamin and Bryan Dunn and sang harmony with Bryan. His guitar play was awesome. It looked like he was playing one of Greg Mayo’s two electric guitars, so for a minute, I thought that perhaps Greg just has magical guitars and anyone could make them sound this good. 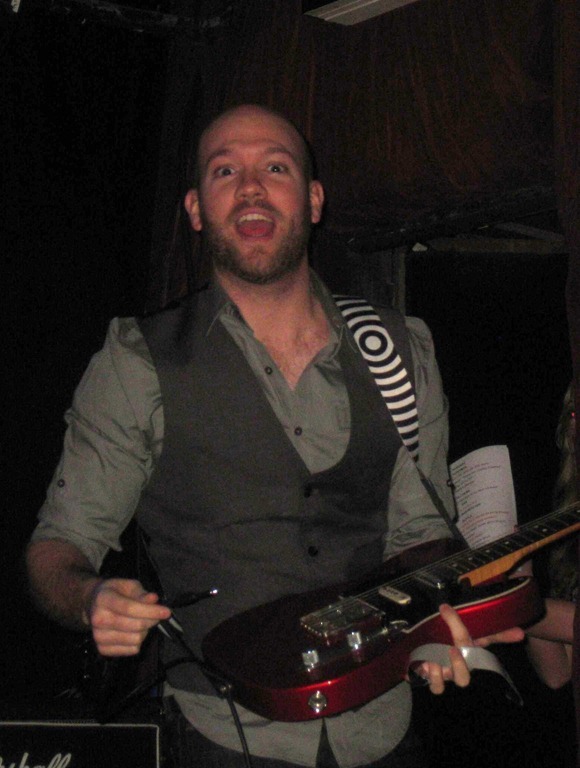 I checked after the show, and the guitars are just look-a-likes, so apparently Chris is just really that good. 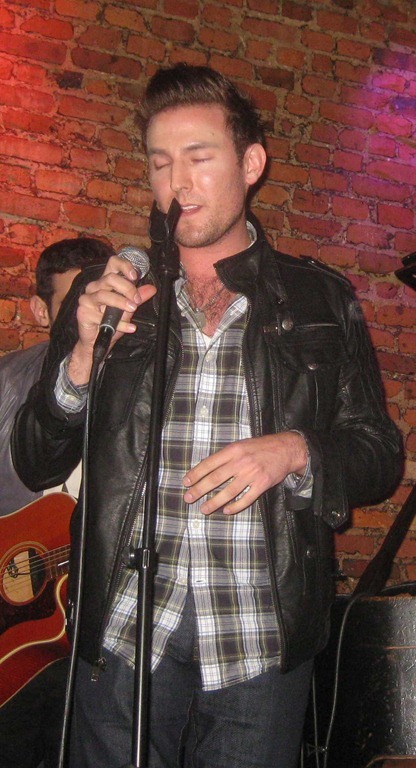 He also sang at center stage when Bryan was done, and did a great job. 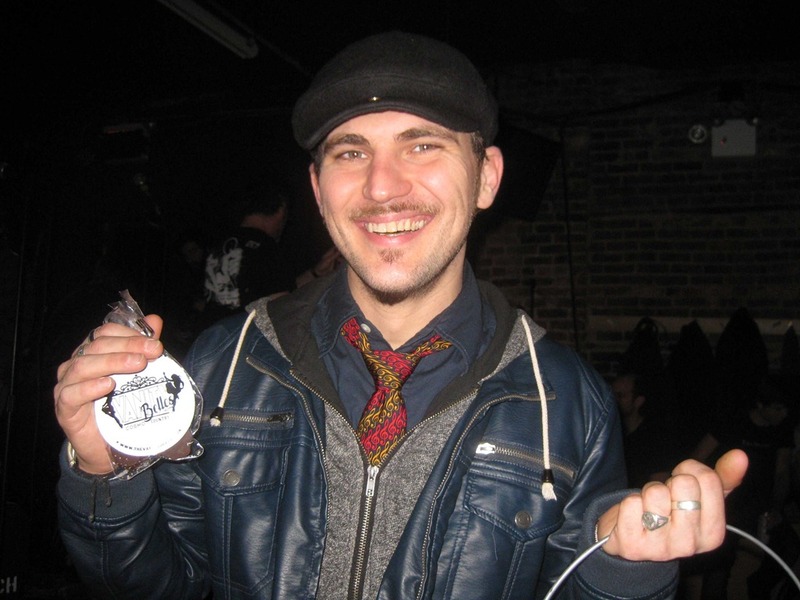 He was supported by Misty Boyce, Bryan Dunn, Ryan Vaughn and Tony Maceli. 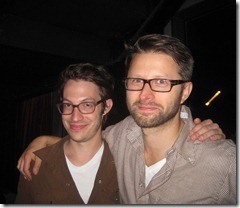 If I heard correctly, Chris also produced at least one of Bryan’s CDs, perhaps the upcoming one as well. Talented guy, no doubt! For his second number, he was joined by a slew of backup singers: Mary Bragg, Bess Rogers, Paula Valstein, Charlene Kaye, Chris Kuffner and Benjamin Wagner. 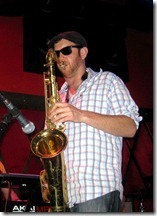 One of the only performers who didn’t hop on stage was Kenny Shaw. When Martin tried to get him to come up, Kenny seemed to motion to Martin to come down instead. Martin took it as an invitation to have Kenny hold him in his arms. Kenny obliged! We shared the evening a number of friends. In one of the photos you can even see our hard-won jar of sauce (I went with the cautious “sauce” with no modifier there). 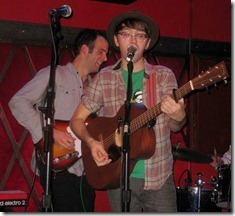 Patrick Firth debuted as a headliner at Rockwood Music Hall last night. Those of us who see Patrick play sideman in a number of bands have been eagerly awaiting this night. That said, I had no idea what to expect. 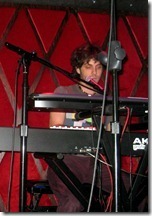 In the other bands, Patrick plays keyboards (piano and electronic) and sings background/harmony. I’ve heard him sing covers, so I know he has a good voice. 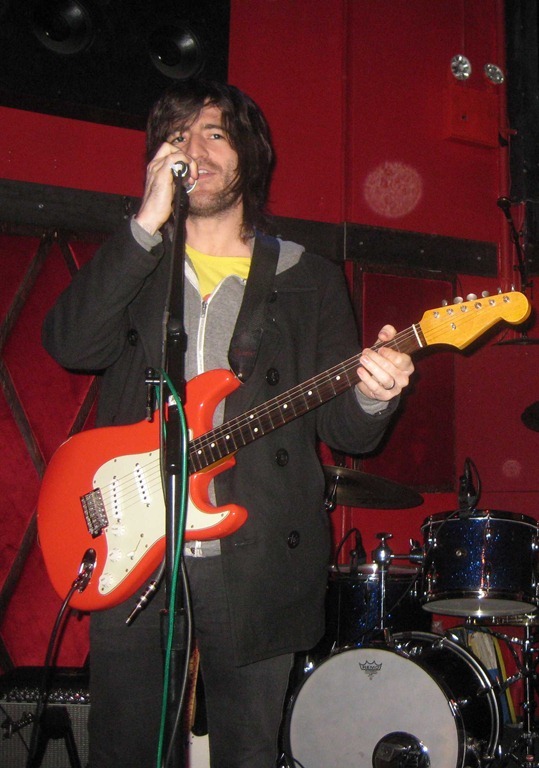 In May, we learned that Patrick was working on a CD of original songs. Since then, we’ve seen him perform one of those songs, Boomerang, two different times. 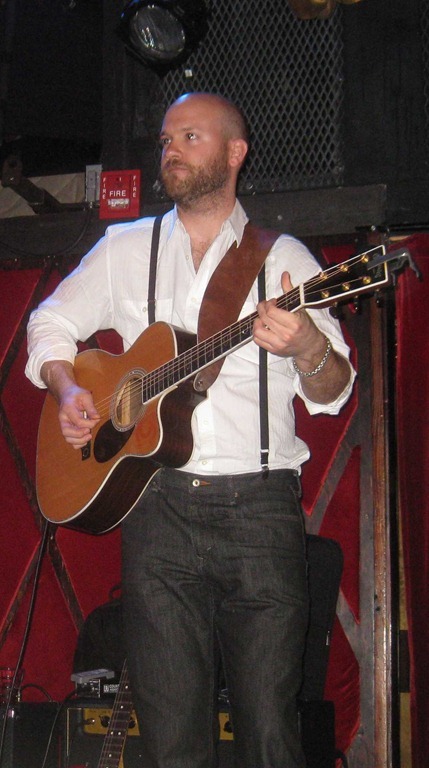 Each time Patrick played acoustic guitar (backed by a full band). I could never have guessed what I would end up seeing at the actual show. 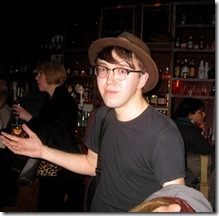 First, let me say a few words about Patrick and the songs themselves, then describe the surprise. I enjoyed Boomerang the two times I heard it (now three) but if the entire CD was made up of similar songs, I don’t think it would excite me. Even though I still like the song, let me say definitively that every other song I heard last night was dramatically better (apologies to fans of Boomerang). I already knew how good he is on the keyboards, but he also impressed on the guitar, in particular when he finger-picked an entire song. 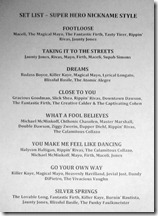 I will own this CD (whenever it comes out), and it will get many plays. I assumed (incorrectly), that each of those people would rotate on/off for different songs. Why? Because two are top guitarists and two are top drummers. Rockwood 1 is small, so my assumption seemed natural. Bzzzt! All of them were on stage for every song. 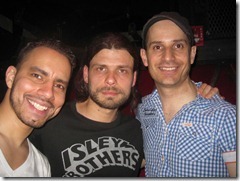 Two of the best guitarists and two of the best drummers, supported by one of the best bass players. All of them supporting one of the better keyboard players (who happens to handle the acoustic guitar well). Wow! Here’s what made it more special than simply listing out their instruments. 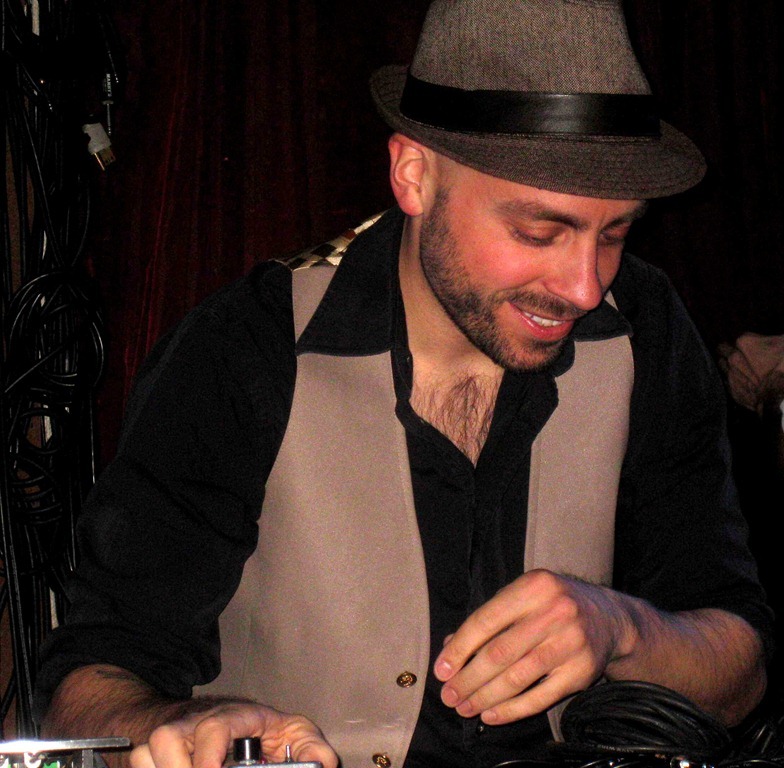 Typically, when an album is produced, many sounds can be achieved that are hard to reproduce in a live show. Overdubs are the most obvious reason, but having a top session musician come in to lay down a very specific sound is another. When you can have those top session musicians, in duplicate, you can create many of those textured sounds live. They did exactly that last night (including having a few pre-recorded sound effects playing on Patrick’s Macbook Pro as well). 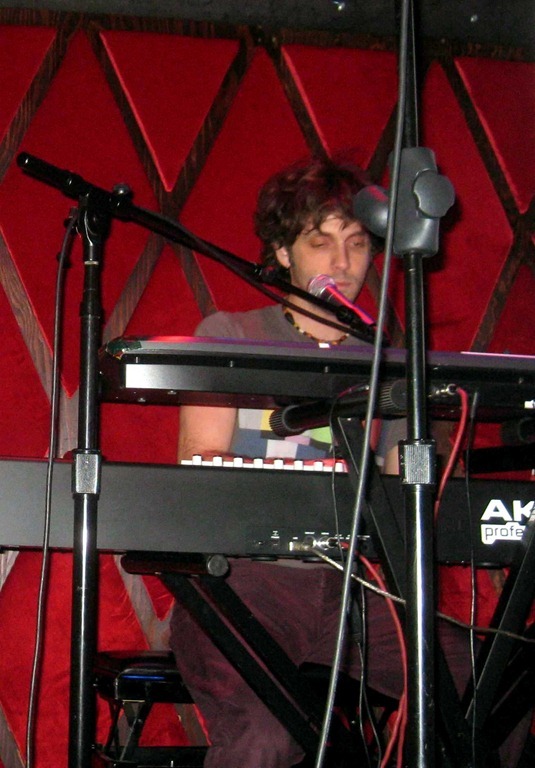 Patrick spent half of the show at the keyboards and the other on the acoustic guitar. Greg Mayo on electric guitar, keyboards (grand piano and electronic) and vocals. This music calls for subtle (dare I even say supple) guitar play. 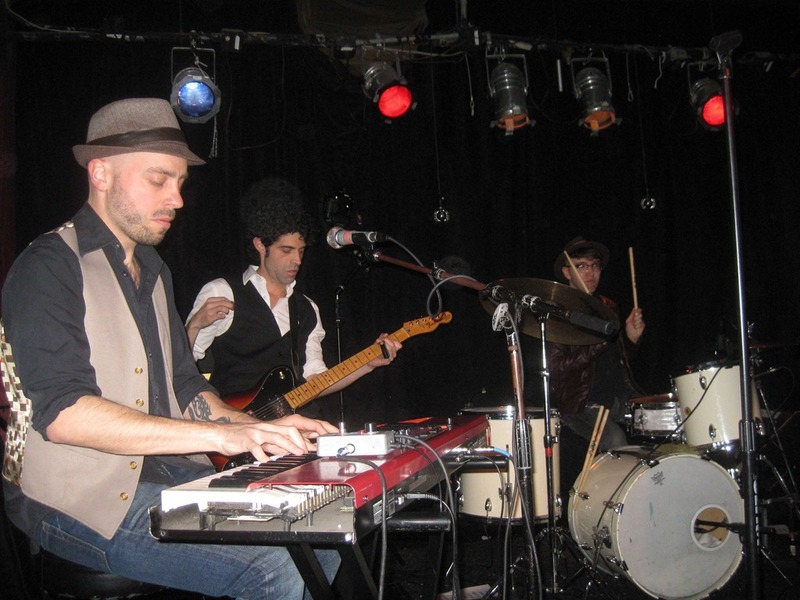 On at least two songs, when Patrick was on acoustic guitar, Greg took over the keyboard duties. 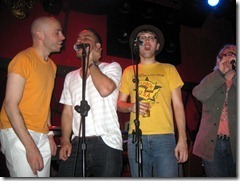 Greg sang the most harmony with Patrick as well (beautifully). 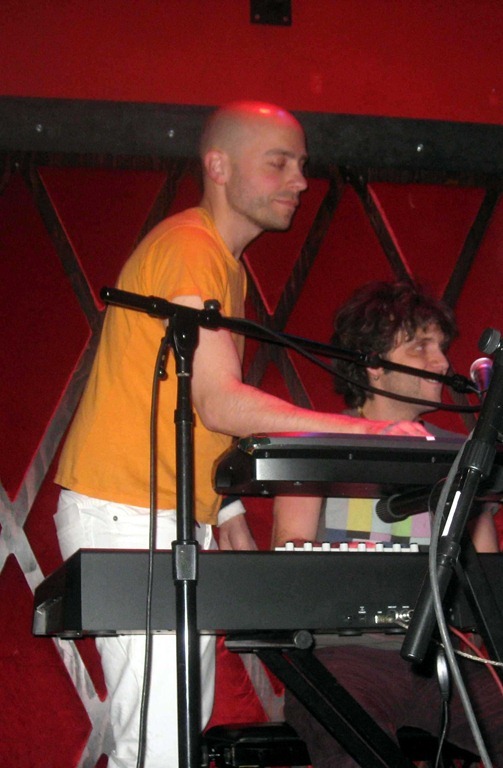 Of course Greg was great on the guitar and keyboards. Patrick mentioned that Greg has been engineering the new CD in his studio, causing them to spend hours on end together. No wonder Greg knows the lyrics so well. 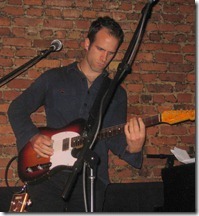 Oscar Bautista on electric guitar. 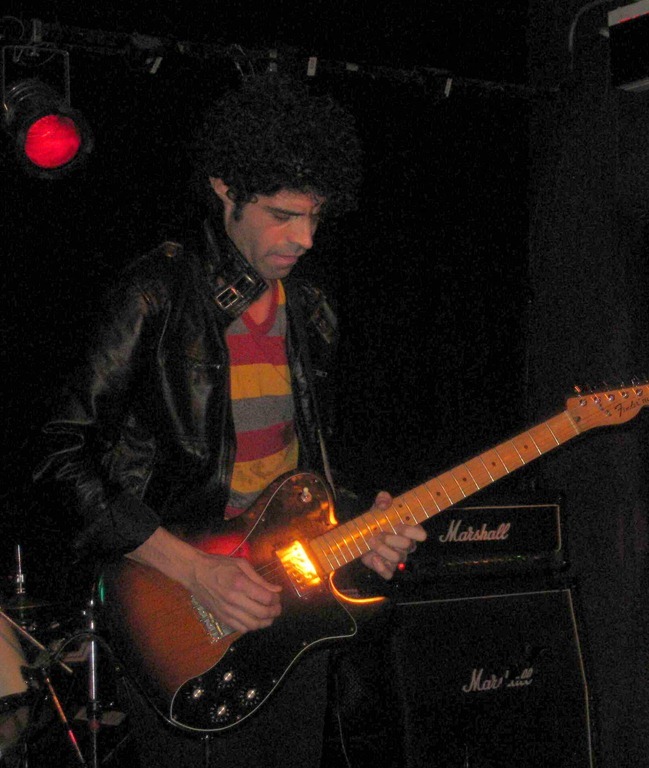 Oscar is an amazing guitarist. Having him play with Greg is something I never expected to see. I’ll admit to having had a fantasy of seeing them play some Allman Brothers (or Lynyrd Skynyrd) together. This wasn’t that, but it was equally interesting in a different way. Oscar used the slide to create very ethereal sounds while Greg played subtle leads. 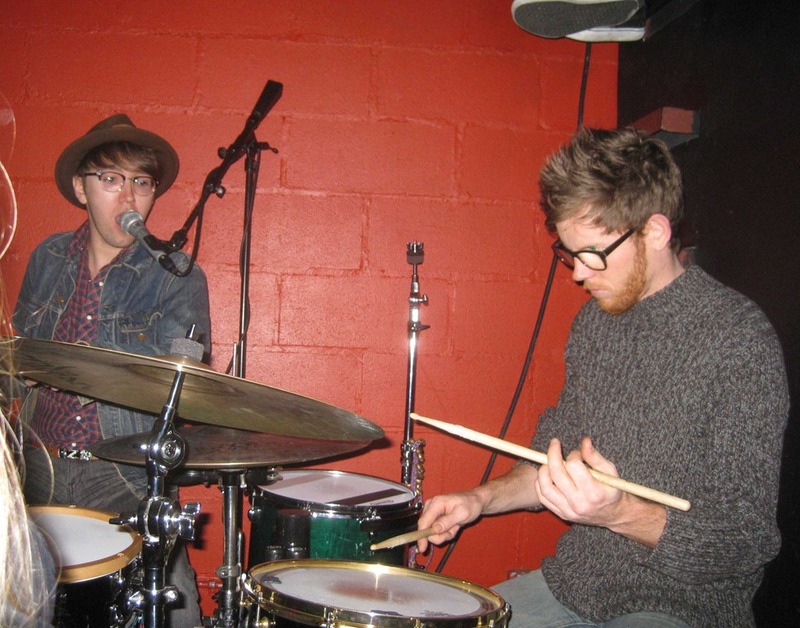 At other times, Greg played more of an organ sound while Oscar played some lead. 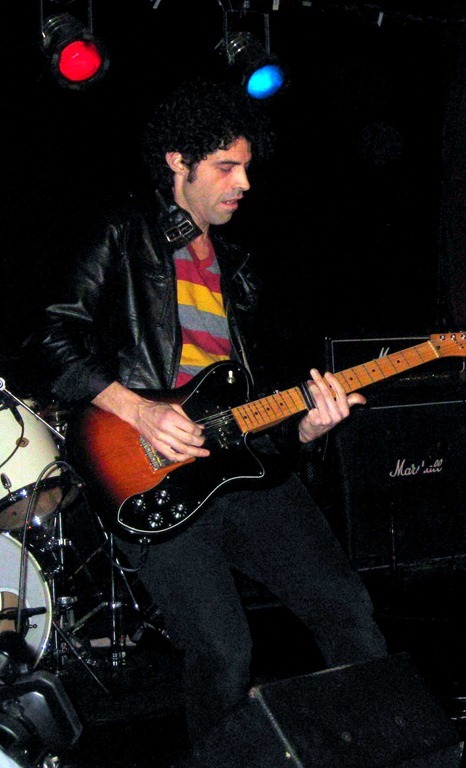 When Greg was at the keyboards, we still had a top lead guitarist, etc. The point is they were able to produce all manner of guitar sounds, just like I’m sure we’ll hear on the actual CD. 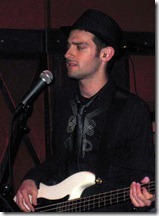 Brian Killeen on electric bass and vocals. Brian always does a great job on the bass, last night included. He sang harmony with the others. 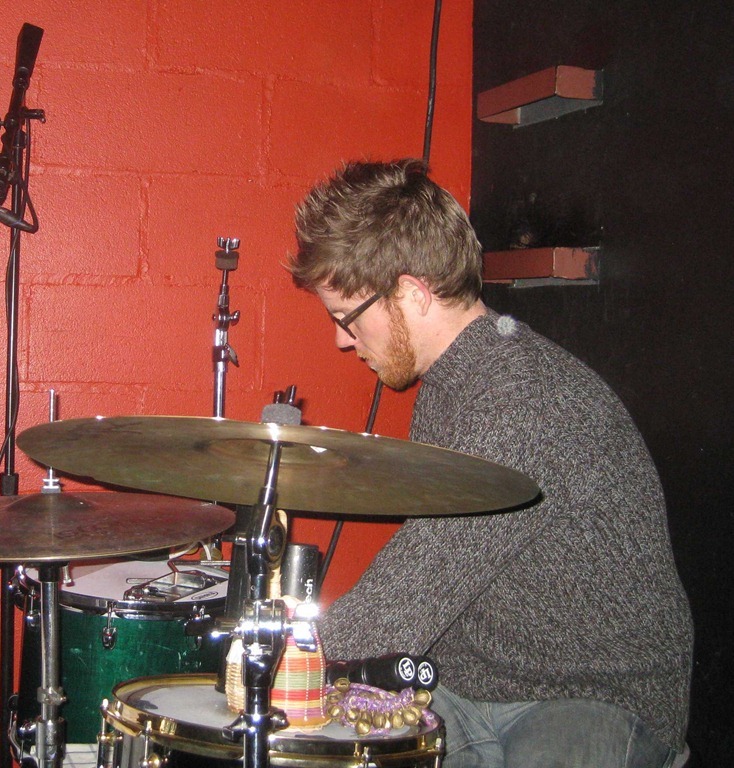 Zach Jones on drums and vocals. 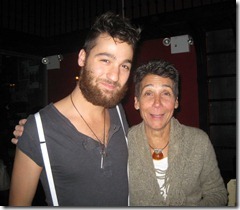 I always rave about Zach’s drumming, as recently as the night before when he supported Robbie Gil. Last night was even more special. 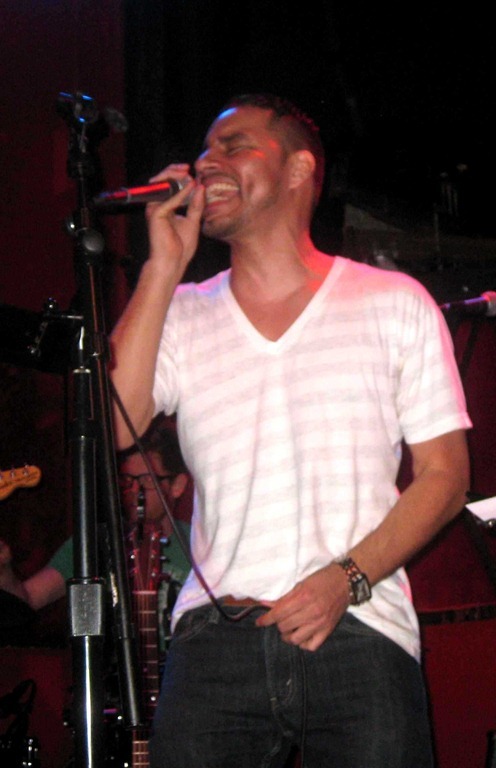 When Zach sang, it was typically the third or fourth voice, making for some big sounding vocals. First, I have to mention another person, so I can write about them as a unit. 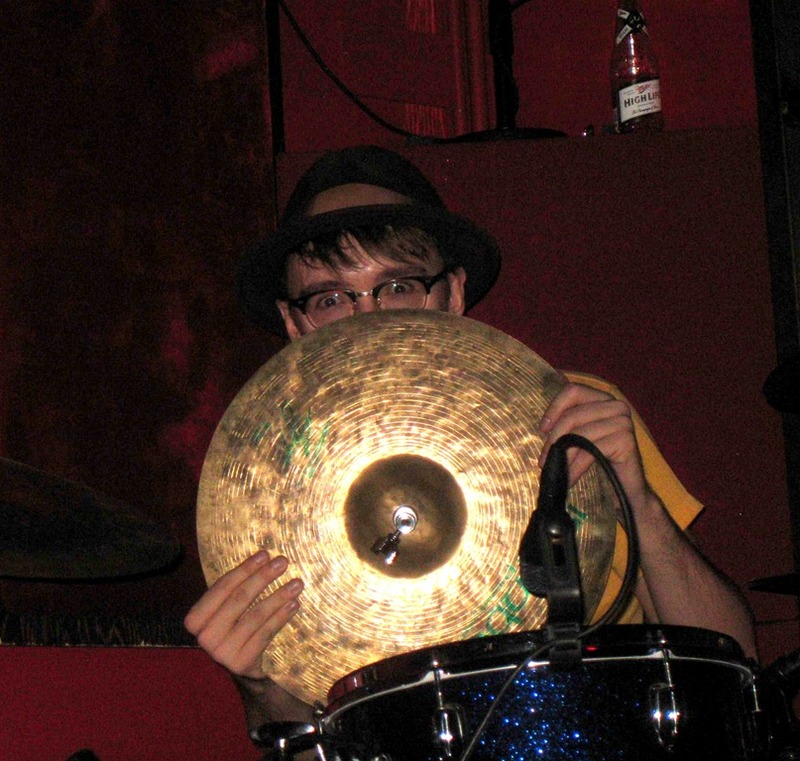 Ryan Vaughn (mentioned in the tweet above) also played drums and percussion. 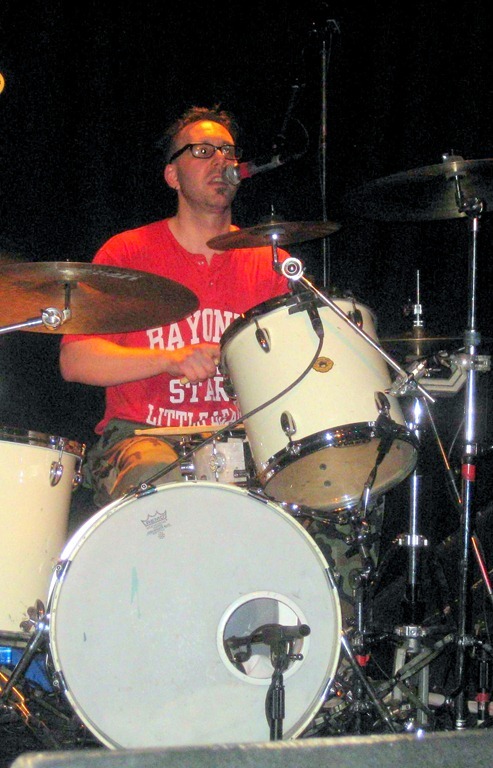 He had a slightly reduced kit (no kick drum). That Rockwood was able to fit 1.5 drum kits in the tiny space to the right of the stage was incredible. 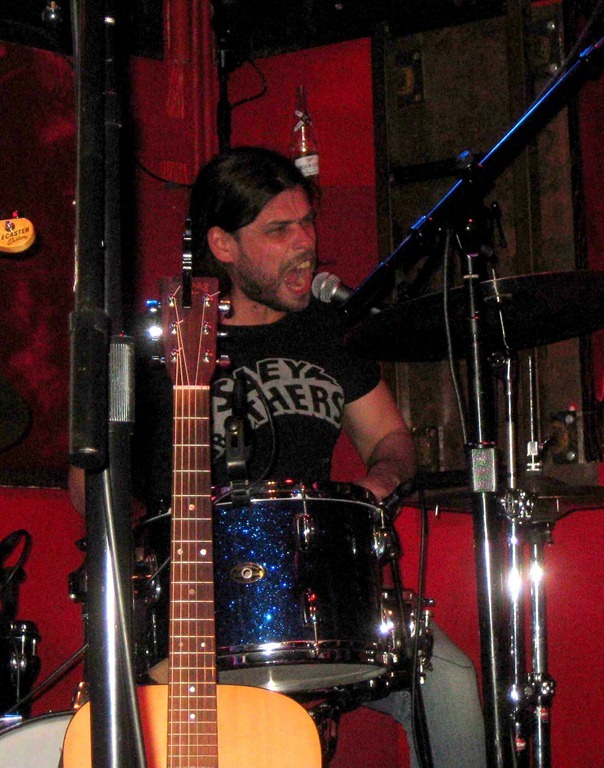 I love drums. A number of my all-time favorite rock bands have multiple drummers (notably: The Allman Brother Band and The Grateful Dead). 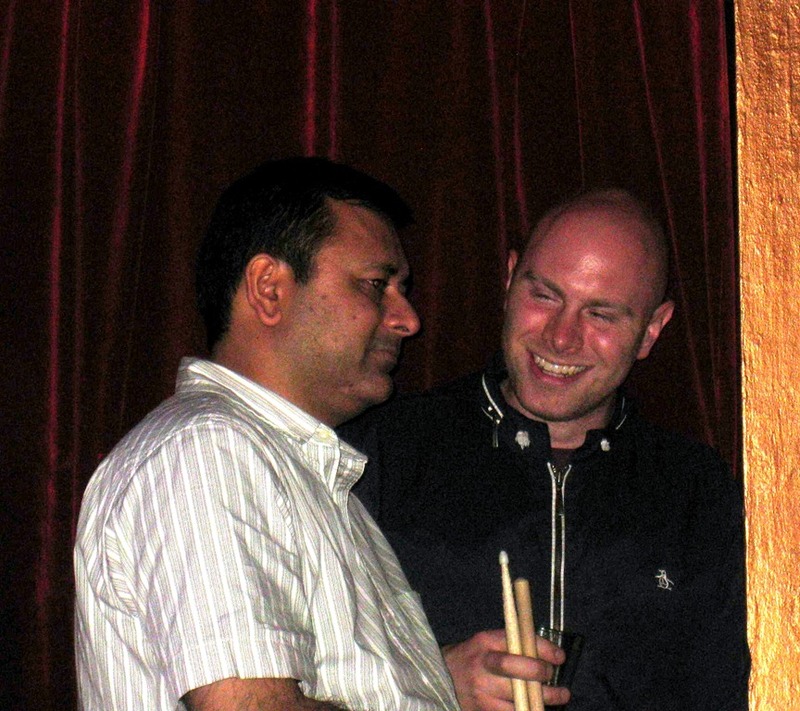 If the drummers are great, you simply can’t have too many of them. They won’t step on each other or drown anyone else out. 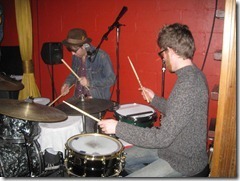 They will create sounds that a single drummer would have trouble producing. The Allman Brothers have three full-time drummers/percussionists, and nearly always have a fourth guest drummer join for a song or two. 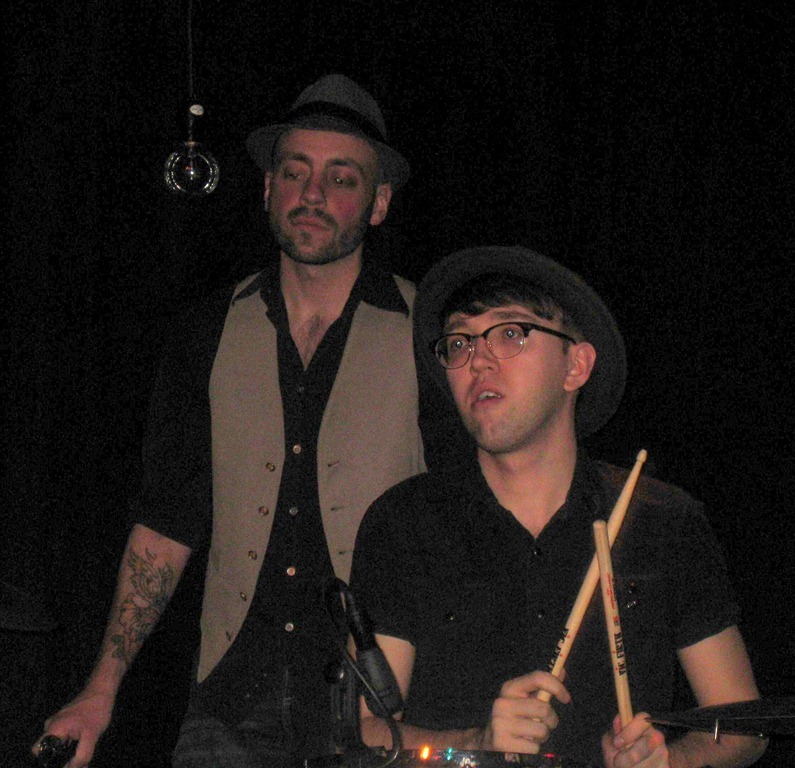 Zach and Ryan are great drummers and were absolutely perfect together last night. I can’t stress enough how amazing that is. They are not in this band full time, therefore rehearsing and touring non-stop playing this material. We know from the tweet that they rehearsed together at least once. I wouldn’t be surprised to hear that was the only time. Yet, they were so tight, on every note. It was one drummer with four arms/hands. One last word about the music. No two songs sounded alike. 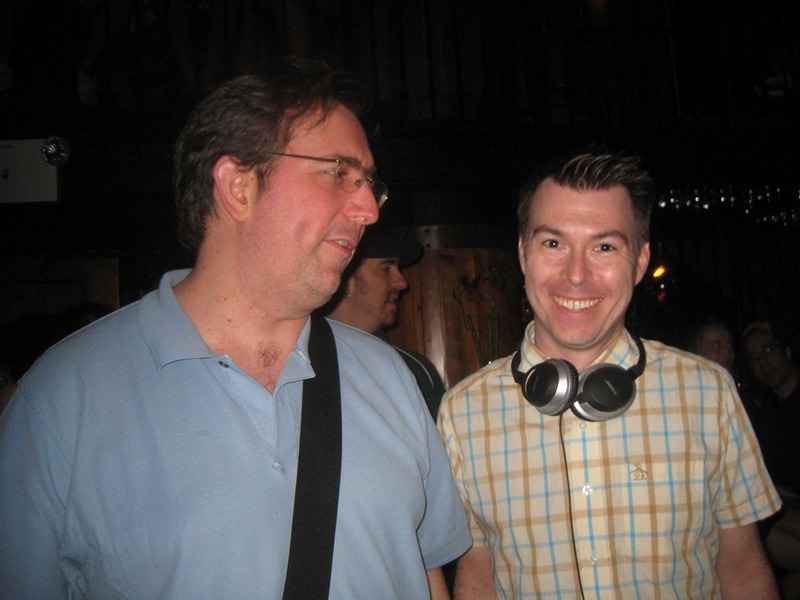 When the originals were over, the sound guy signaled to Patrick that he had time for one more. Patrick will never be able to debut again, but he won’t have to. He doesn’t need a do over.